Some great history related events are either happening or coming up in the Western District over the next few months. 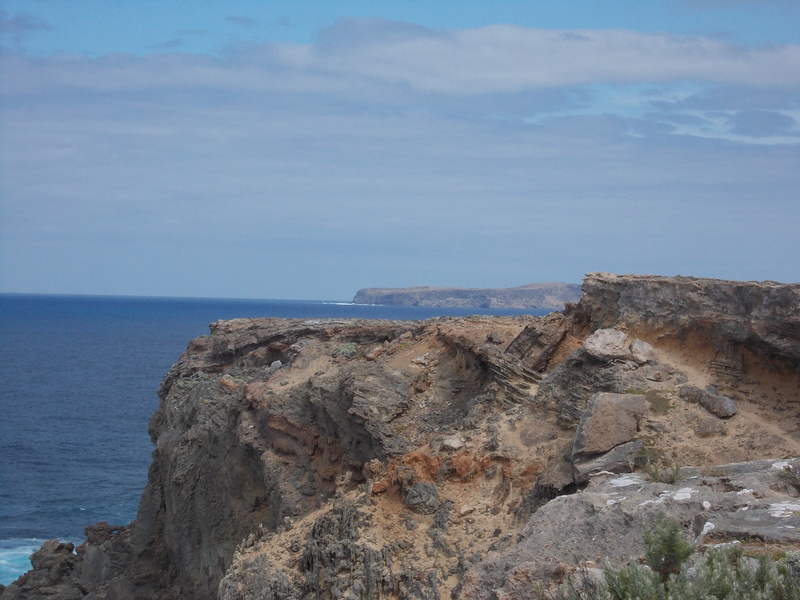 Running now until 28 April at the Port Fairy Museum and Archives is a travelling exhibition “Submerged” about shipwrecks along the south-west coast and Australia wide. Port Fairy is a good place to host an exhibition about wrecks with fourteen wrecks recorded within Port Fairy bay alone. You can find out more at the museum’s Facebook page Port Fairy Museum and Archives or website. 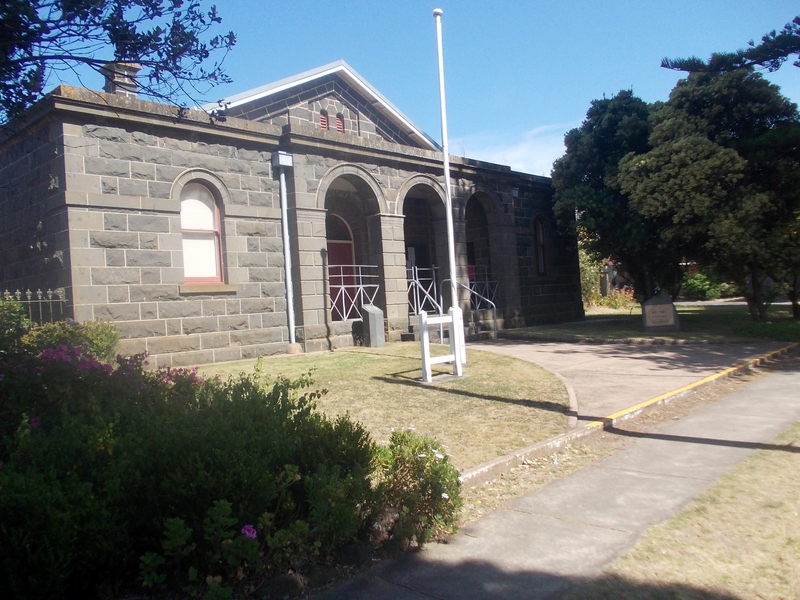 PORT FAIRY MUSEUM & ARCHIVES, GIPPS STREET. The Glenelg Shire Council Cultural Collection exhibition “Gone But Not Forgotten…The Lost Buildings of Portland” is now on at the Portland Arts Centre until 26 April. The exhibition includes a display of photos and other items on the long-gone buildings of Portland. 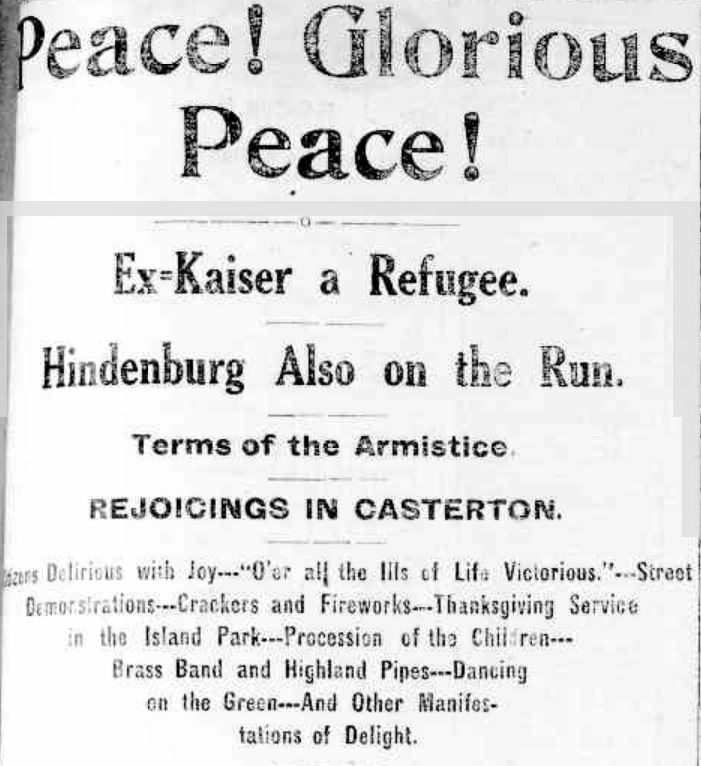 An exhibition curated by the Casterton RSL will look at the Centenary of the RSL will begin on 2 April at the Casterton Town Hall foyer. 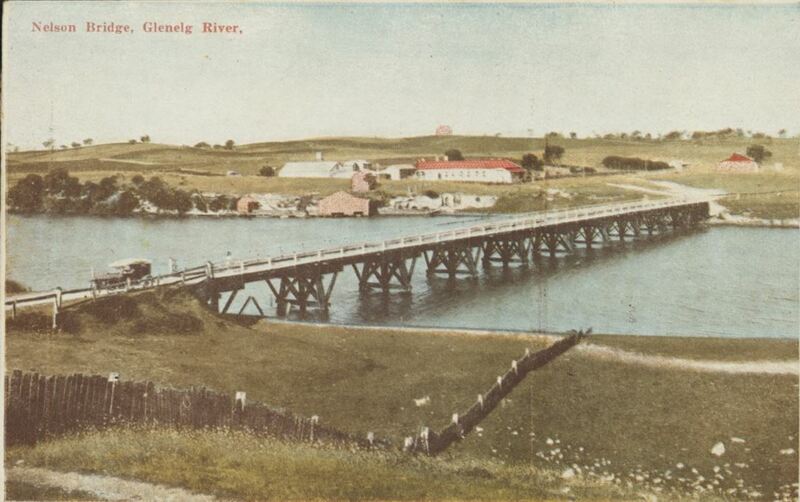 You can find out more at the shire’s Facebook page Glenelg Shire Council Cultural Collection. 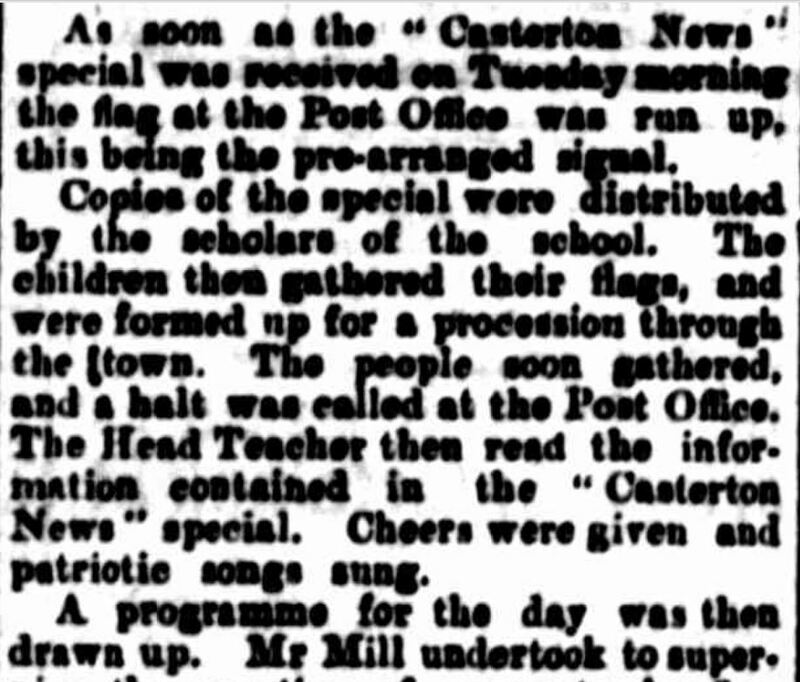 Near Lake Bolac on 28 April will be an unveiling of a plaque at the former Mellier State School. The plaque will remember the 100th anniversary since the school was moved to Norbank Road, Lake Bolac. 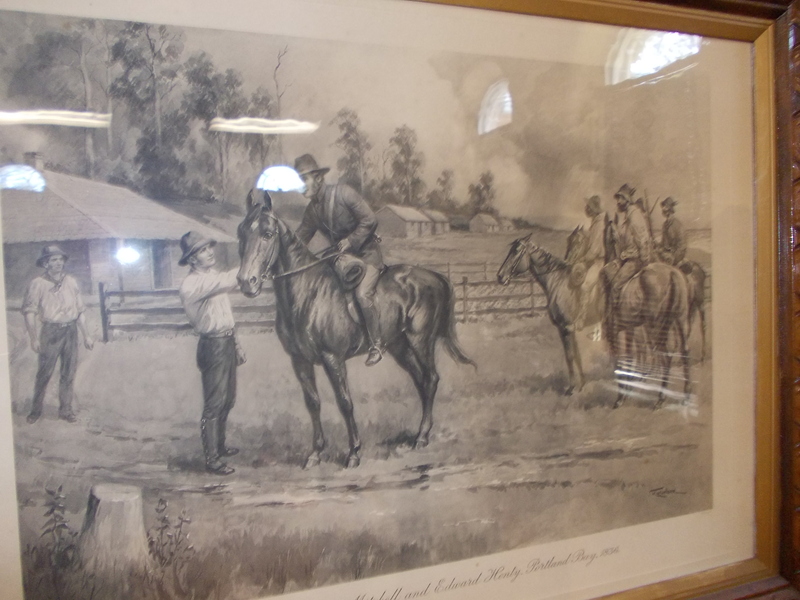 You can find out more on the Historic Lake Bolac Facebook page. On the weekend of 18 & 19 May is the Hamilton Pastoral Museum May rally. You can see some of the sights…and sounds of the museum in this video from my visit to the October 2018 rally. Look for further rally information on the museum’s Facebook page Hamilton Pastoral Museum Inc or the museum website. 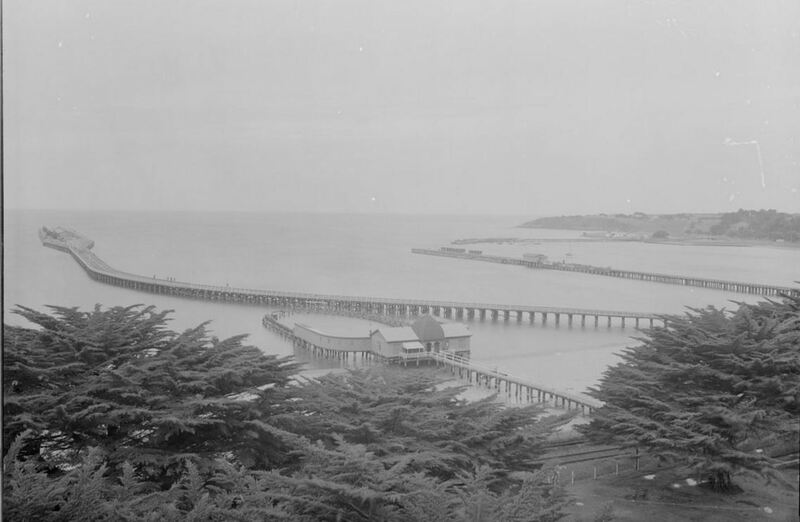 Also on 18 May, the Warrnambool Family History Group are holding a seminar with four guest speakers each with great topics including Ken Flack, a genealogist and historian from Horsham speaking on taking a different approach to research; Janet McDonald, the President of the Warrnambool and District Historical Society talking about using local records to research land and houses around Warrnambool; Kate Moneypenny from the State Library of Victoria talking about researching family history at the SLV. You can find out more on the groups Facebook page Warrnambool Family History Group or their website. For those interested in DNA and Family History, the Colac & District Family History Group is hosting a workshop on Friday 31 May from 1pm to 3pm with a representative from Ancestry. This must be a Western District first on such a topic so take the chance to attend. The Colac & District Family History Group are doing some great things. 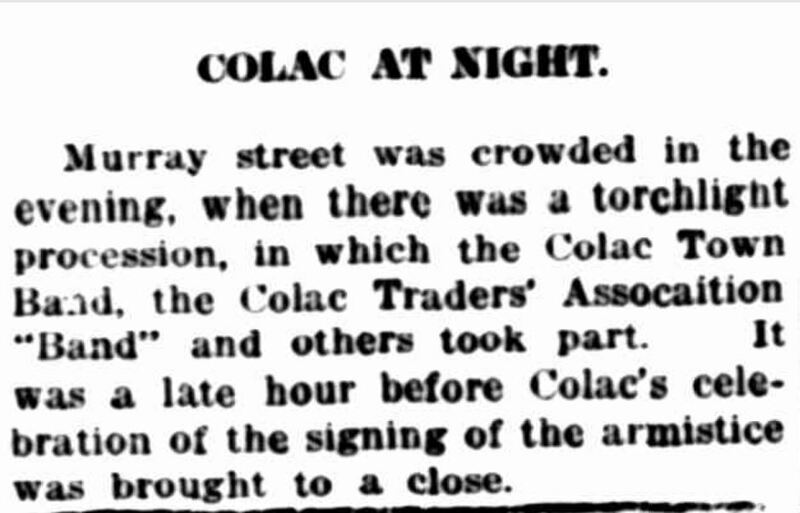 For further updates, check out the group’s Facebook page Colac & District Family History Group and website. It’s a new website too so definitely take a look. The following day, Saturday 1 June is the 2019 VAFHO (Victorian Association of Family History Organisation) Expo at the Chevalier Centre, Monivae College in Hamilton from 10.00am to 4.00pm. Take the opportunity to hear some of the best family history speakers right here in the Western District. I’ll keep you updated with details including guest speakers as they come to hand or you can check out the VAFHO Facebook page VAFHO – Victorian Association of Family History Organisations or website. You may have sat in a church and admired the stained glass windows, but have you had a close look? 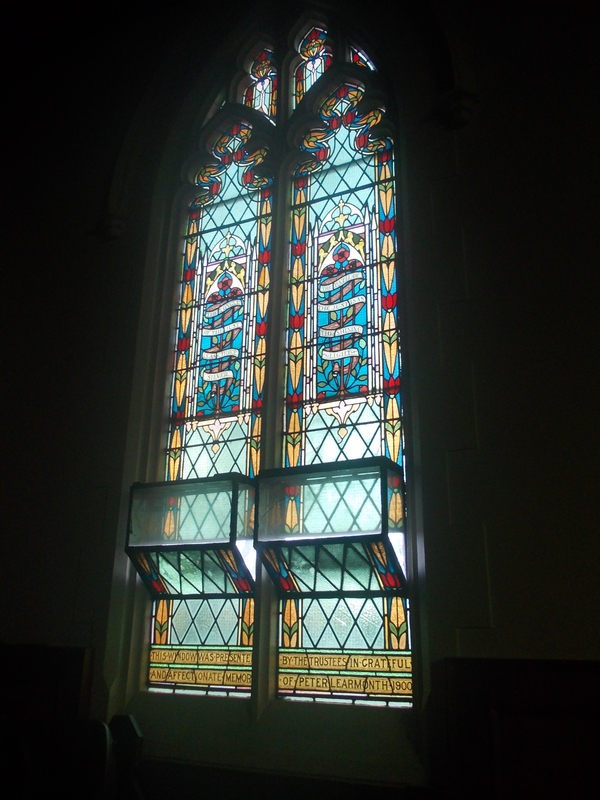 You’ll see church windows can tell a story about a town’s history and people. 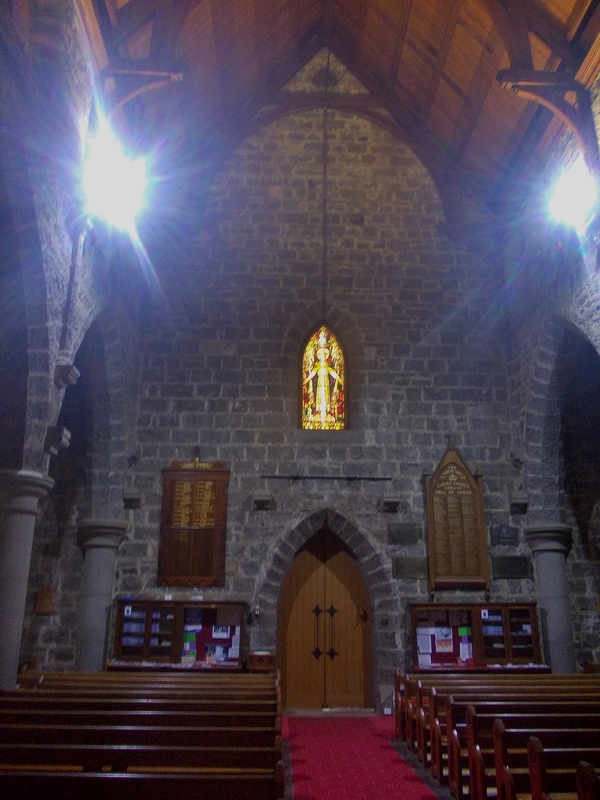 To give you an example, let’s take a look at windows at two churches I’ve visited over the past year, the Hamilton Uniting Church and the Hamilton Anglican Christ Church. A disclaimer…I like to think it’s a spiritual force responsible for the large percentage of blurry photos I’ve taken in churches. In reality, it says something about my photography skill. Also, there are loads of links in this post so if you see underlined text, click on it and you will find more information about the subject. Opened on Sunday 5 October 1913 as the Hamilton Wesleyan Methodist Church, the Hamilton Uniting Church in Lonsdale Street has some beautiful windows. I have some family history here as my ggg grandfather James Harman was a Wesleyan local preacher and often preached at the former Wesleyan Church in McIntyre Street. The current church opened prior to his death and even though he was eighty-three he still found the energy to attend events important to him so I expect he was there. 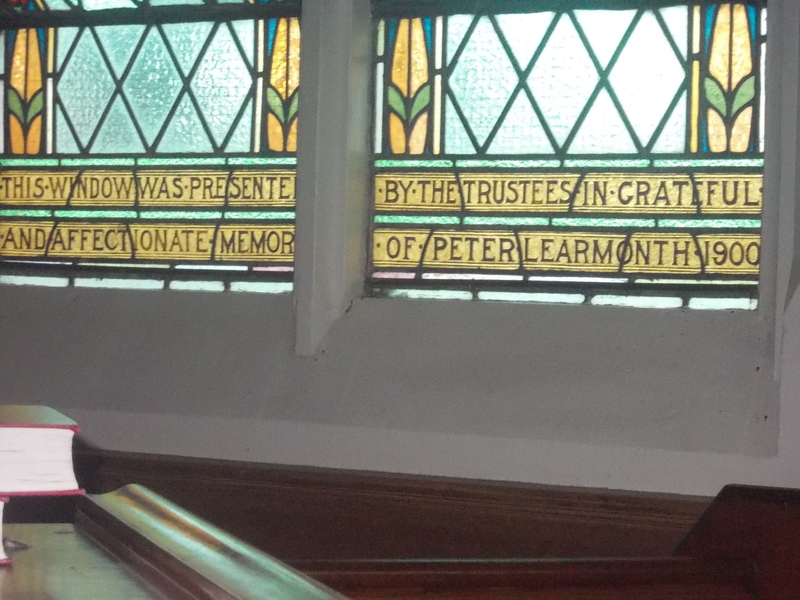 There isn’t a memorial window for James, but there is a window for a man he knew well, Peter Learmonth of Prestonholme Hamilton, a local businessman, flour mill operator and stalwart of the Wesleyan Methodist Church. 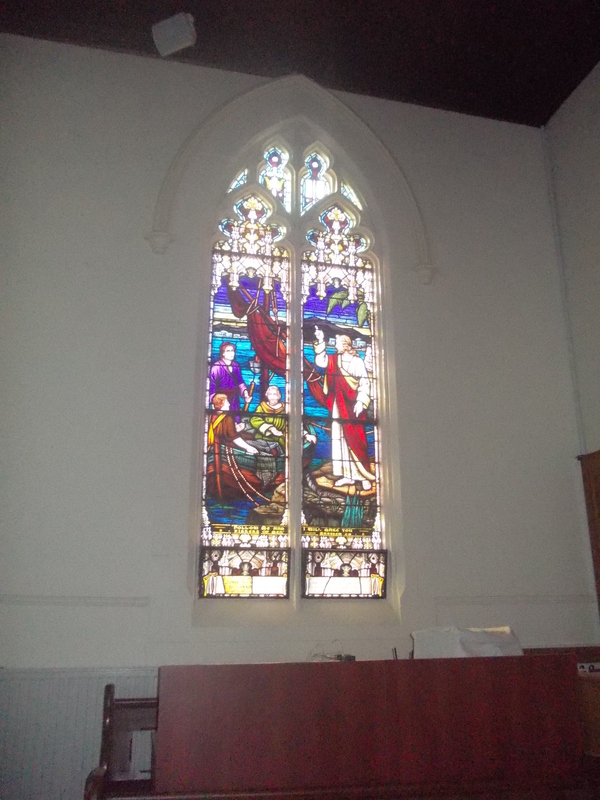 Unveiled on 14 January 1900 at the then Methodist Church in McIntyre street, this beautiful window was later installed at the new church in Lonsdale Street. 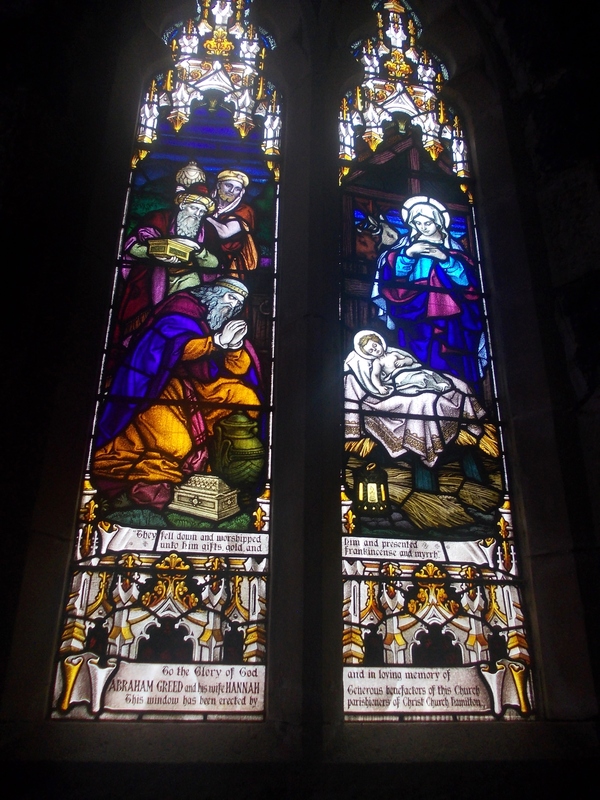 The Reverend W.C. Thomas spoke of the Learmonth’s dedication to the Methodist Church during a memorial service for Mary Jarvey Pearson, herself deserving of a memorial window. 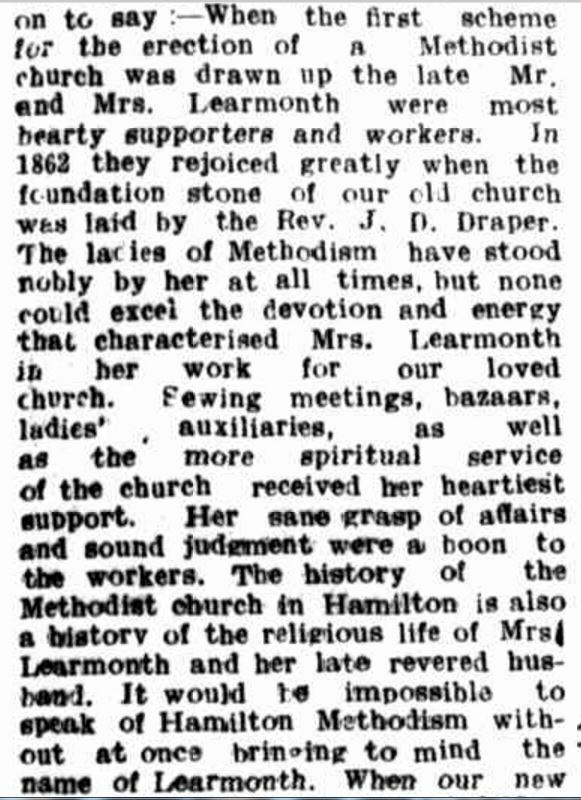 “LATE MRS. PETER LEARMONTH.” Hamilton Spectator (Vic. 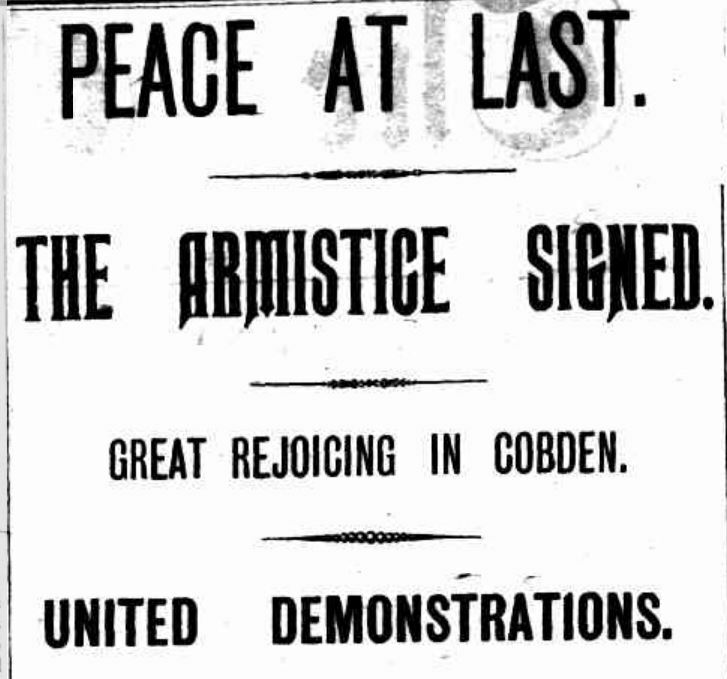 : 1870 – 1918) 8 December 1913: <http://nla.gov.au/nla.news-article225162684&gt;. 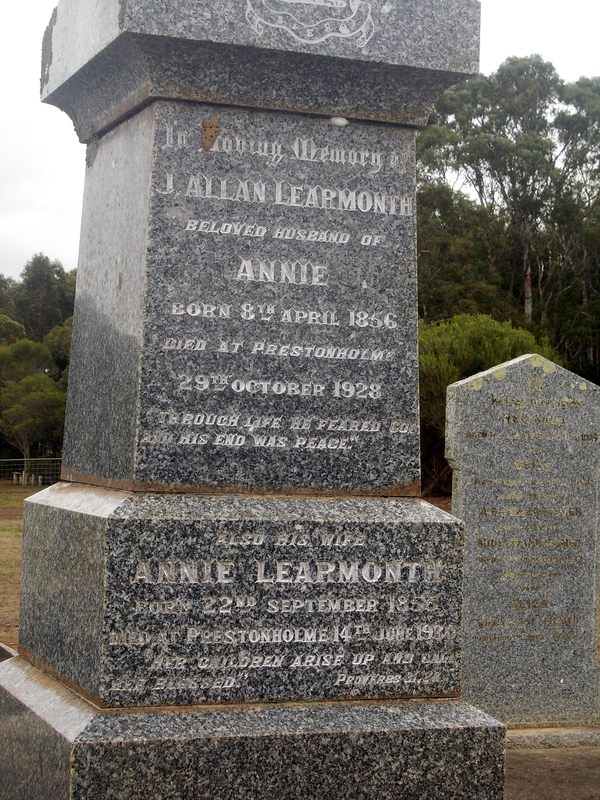 James Allan Learmonth was a son of Peter Learmonth and Mary Jarvey Pearson. He was born at Merino Downs on 8 April 1856 and went to school at the Hamilton and Western District College and Wesley College. Locally, James was well-known for his sporting prowess. After some work experience in Melbourne, James returned to the Western District to manage his father’s Penshurst Flour Mill. After his father co-purchased Maraposa Estate in Mexico, James and his brother left for that country to manage the estate for ten years, returning home briefly in 1886 to marry Annie Thomson of Monivae Estate. In 1892, James and Annie returned from Mexico to live at Prestonholme. James died on 29 October 1928 and Annie on 14 June 1930. They were buried at the Old Hamilton Cemetery. 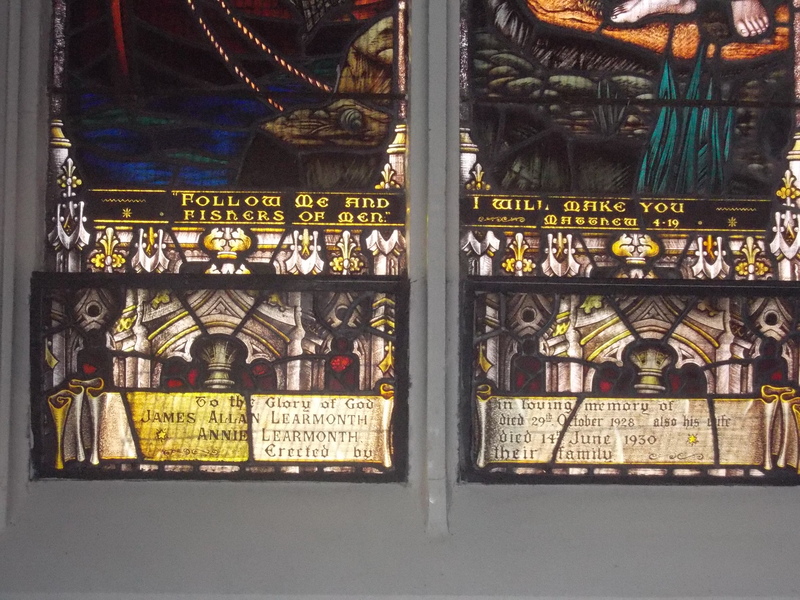 Annie’s family were Presbyterian and the St Andrew’s Church in Hamilton features a large memorial window for her father James Thomson. 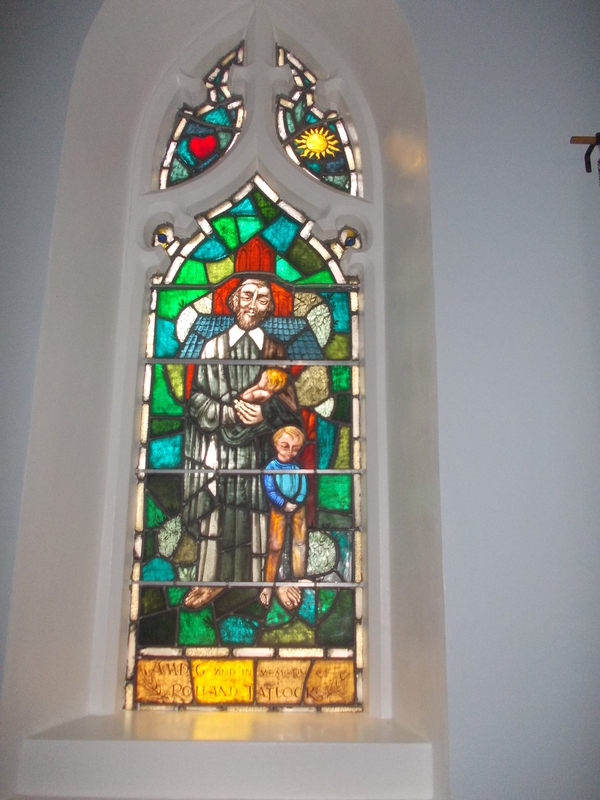 James and Annie Learmonth’s window at the Hamilton Uniting Church is below. 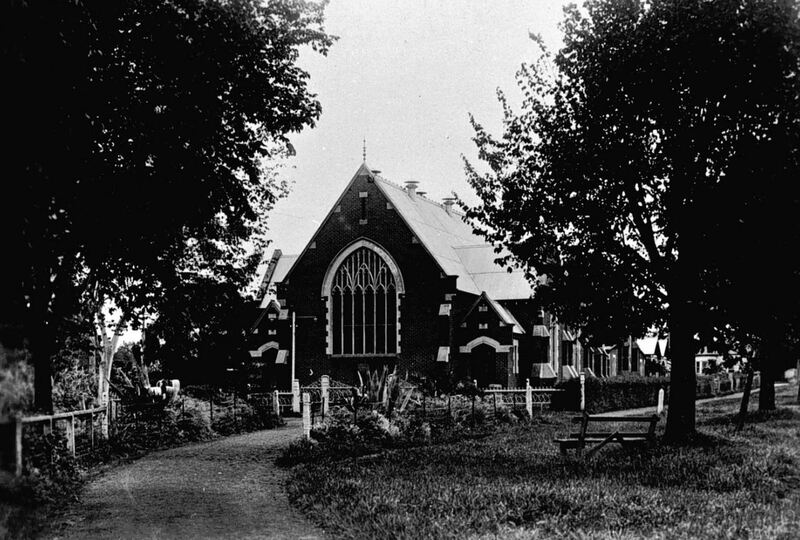 Hamilton’s Christ Church in Gray Street was built in 1878. Walking up to the door, I always imagine handsome Lieutenant Edward Ellis Henty and his beautiful bride Florence Grace Pearson emerging through the doors after their marriage on 18 November 1914. They’re bittersweet thoughts because nine months later, Florence and Edward’s family and friends entered the same doors for a memorial service for Edward. He was killed at the Charge at the Nek at Gallipoli on 7 August 1915 while serving with the 8th Australian Lighthorse Regiment. Florence was around seven months pregnant. I’ve visited the Christ Church three times in the past year. Each time I visit, I can’t help but touch the 137-year-old walls made from local bluestone just as I enter the doors below. 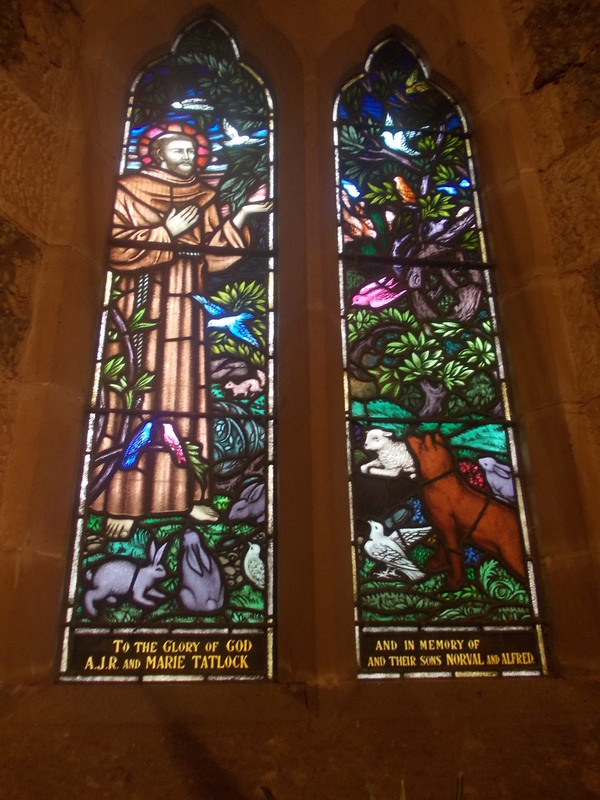 Just inside the main door of the church in the vestibule is the first stained glass window, a memorial for the Tatlock family, Alfred James Rolland Tatlock, his wife Marie McGowan and sons Norval and Alfred Jr. Depicted is St. Francis of Assisi possibly indicating the Tatlock’s love for animals. Alfred Sr.’s father Thomas Henry Tatlock was a leading breeder and judge of poultry and horses. Alfred Tatlock Sr. was a grand master of the Grange Masonic Lodge and a Hamilton councillor. Marie died in 1937 and Alfred Jr. met a tragic end, killed in a plane crash in Queensland on 27 March 1943 while serving with the RAAF. Twenty-two other crew and passengers were also killed. Norval died in 1951 and Alfred Tatlock Sr. in 1956. Once inside the Christ Church, stained glass windows line either side of the nave. 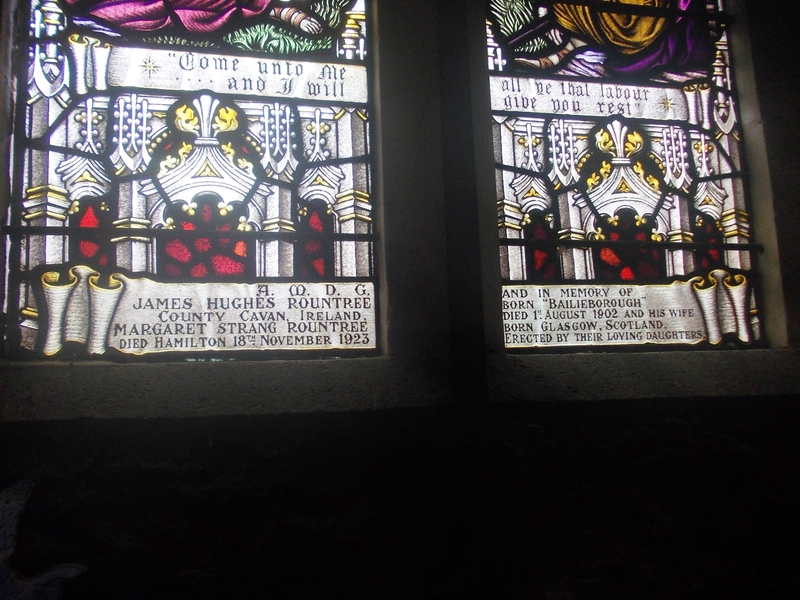 To the left is the window for Abraham Greed and his wife Hannah Oaff. 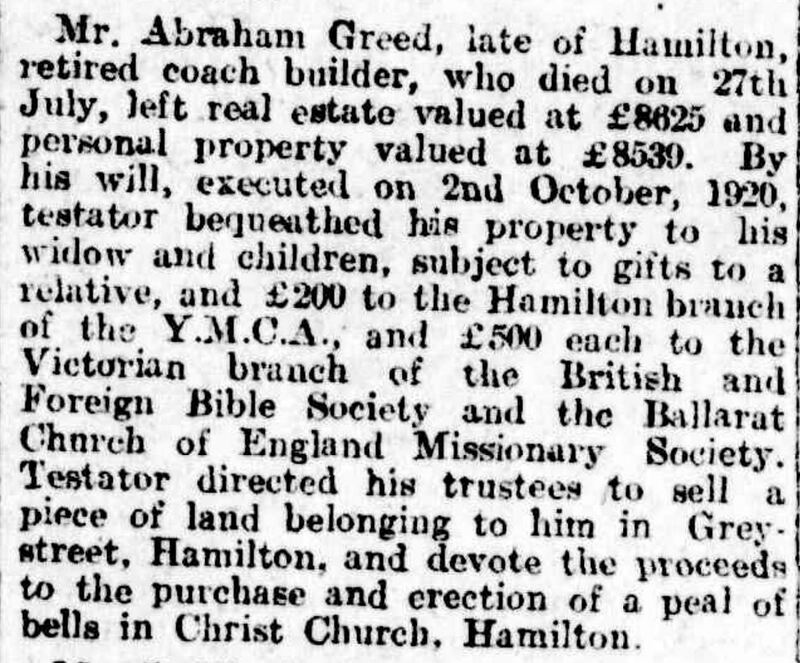 Abraham was a leading coachbuilder in the town and a Mayor of Hamilton. He was born in Taunton, Somerset, England and arrived in Victoria around 1857. Abraham married Hannah Oaff in 1866. He died on 27 July 1926 aged eighty while on holiday in Geelong with Hannah and their daughter. Only the year before, Abraham had donated an oak altar and reredos to the church. 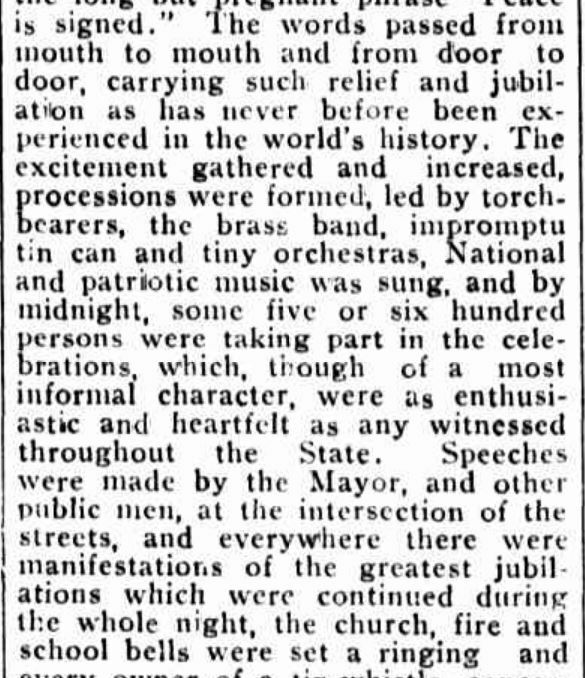 “HAMILTON.” The Argus (Melbourne, Vic. : 1848 – 1957) 22 May 1925: 6. . 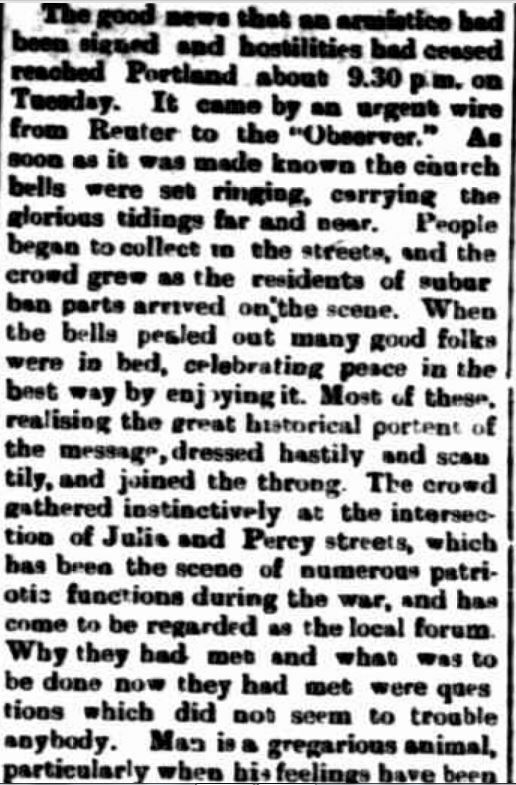 In his will, Abraham left the Christ Church money for a peal of bells. Hannah died at Hamilton in 1937 aged eighty-eight. 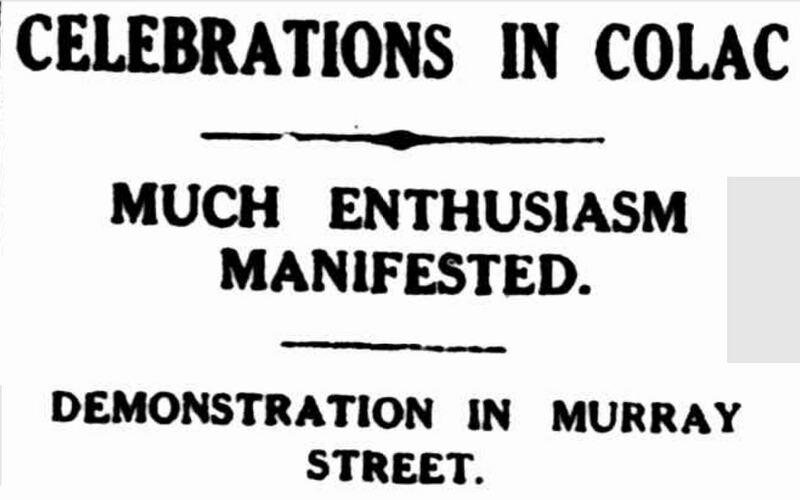 “ABOUT PEOPLE.” The Age (Melbourne, Vic. : 1854 – 1954) 1 November 1926 . 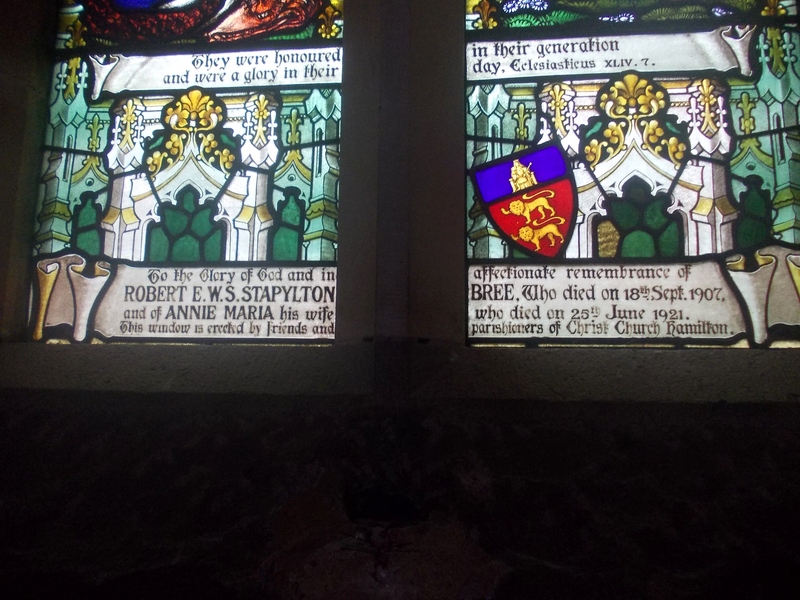 Also to the left of the nave is the window for Robert Edwin Windsor Sandys Stapylton Bree and his wife Anna Maria Henty. Robert Bree was born in Cornwall on 11 November 1839, his father an Anglican minister. He worked for Dalgety & Co. in London before arriving in Victoria and working for Stephen Henty as a manager of Henty’s properties. It was during that time Robert met Stephen Henty’s daughter Annie four years younger than himself. 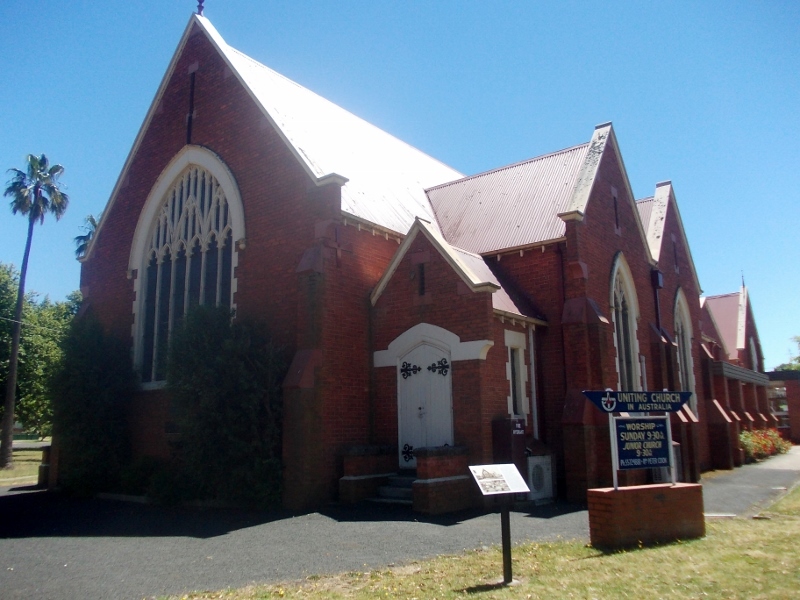 They married in Hamilton’s first Anglican Church on 30 July 1874. Robert operated a stock and station business at Hamilton from 1872. At one time he was in business with Alfred Tennyson Dickens, son of Charles Dickens. Robert sat on the Hamilton Borough Council for thirty-five years, twice serving as Mayor. He was President of the Hamilton Hospital board and operating theatre was named in his honour along with a park opposite the hospital. On 26 May 1900, Robert and Anna’s son Reginald Robert Stephen Stapylton Bree serving as a Lieutenant was killed in Bloemfontein, South Africa during the Boer War. Robert Bree died on 16 September 1907. 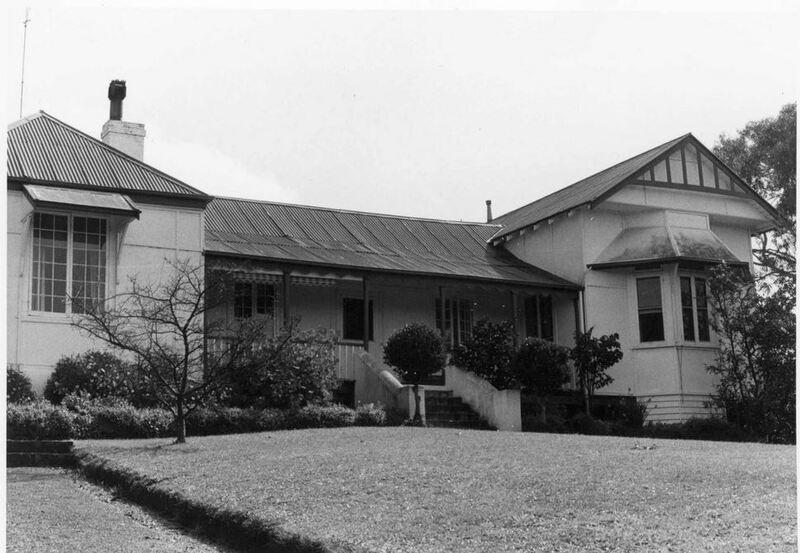 After Robert’s death, Anna continued living at the Bree family home Bewsall in Hamilton and in 1914 hosted the wedding breakfast of her nephew and his new wife, the aforementioned Edward Henty and Florence Pearson. 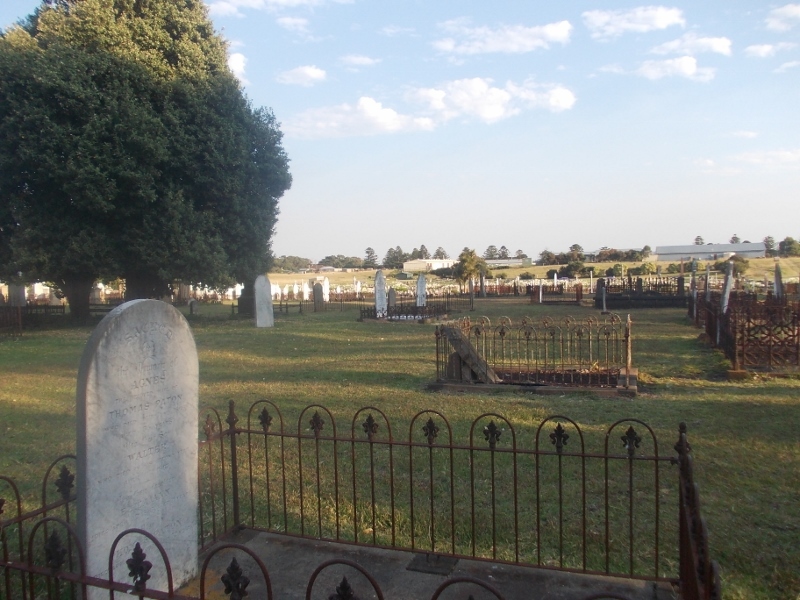 Anna died on 2 July 1921 at Bewsall in Hamilton leaving two daughters and a son. Next is the window for the Rountrees, James Hughes Rountree and his wife Margaret Strang Kitchen. 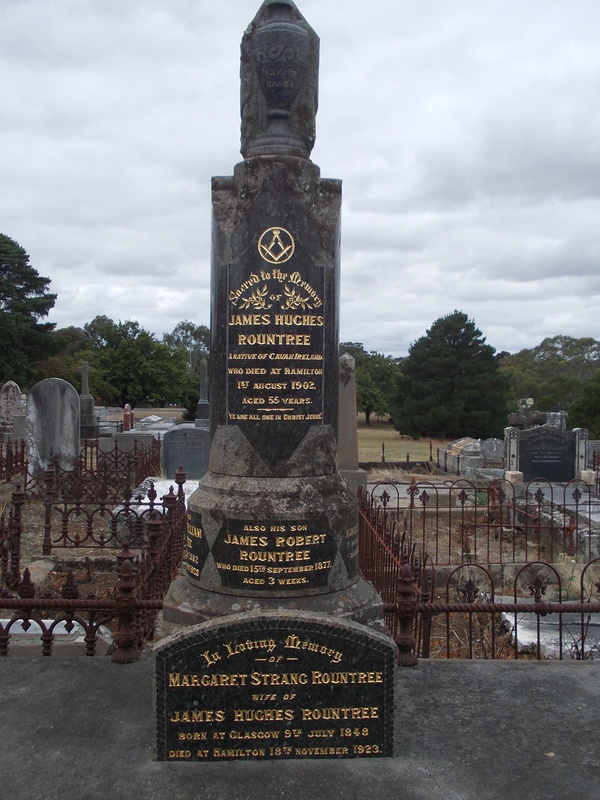 James Hughes Rountree died on 1 August 1902 after an operation for an ulcer. He arrived in Victoria aboard the Great Britain in 1864 and worked as a dispenser at the Geelong hospital. In 1874, he became superintendent at the Hamilton Hospital. Fourteen years later, James opened a chemist shop in Hamilton. He was a member of the Masonic and Orange Lodges. At the time of his death, James left his widow, Margaret and eight children. Most of James and Margaret’s children followed James’ profession. Daughters Mary, Margaret, Jean and Ella were chemists as was son James. Mary Rountree married the well-known jockey Bobby Lewis in 1920. Lewis rode four Melbourne Cup winners during his career and controversially rode Phar Lap to third in the cup in 1929. 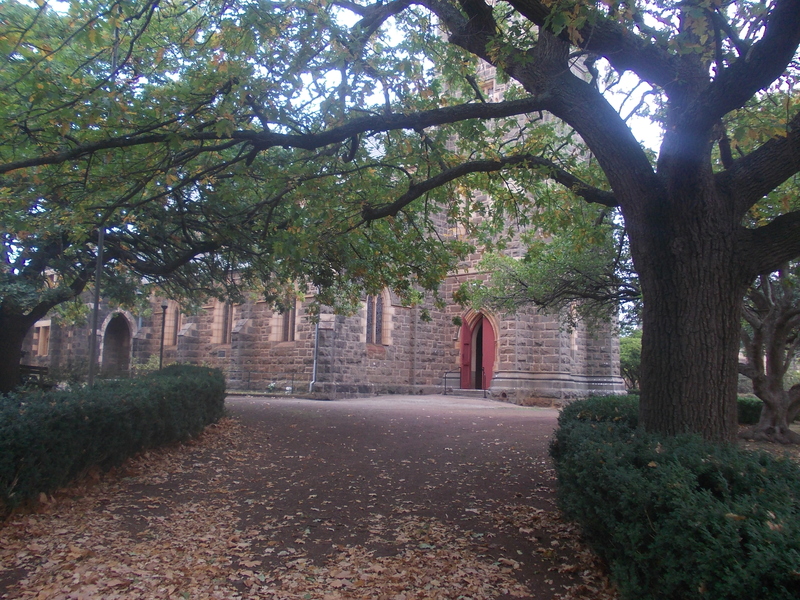 The wedding took place at the Hamilton Christ Church. “PERSONAL.” The Ballarat Star (Vic. 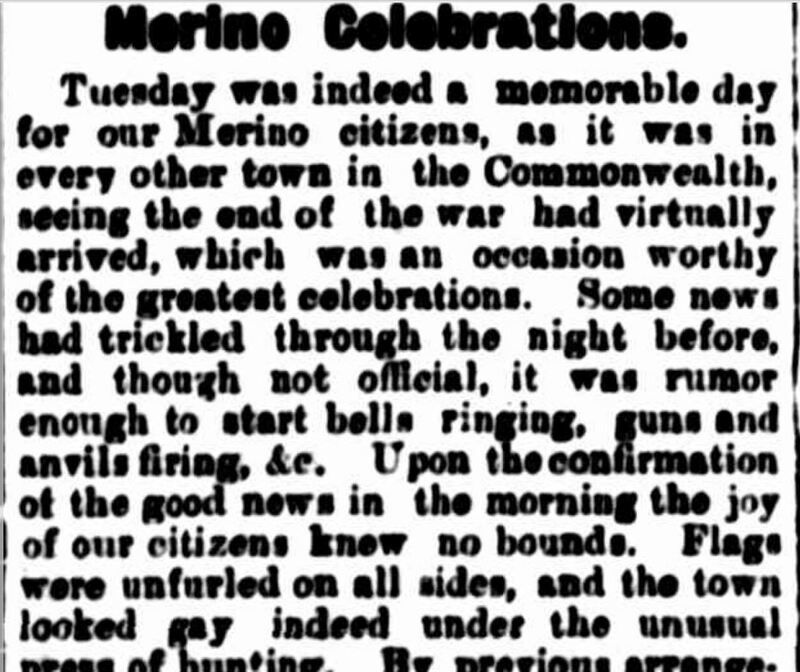 : 1865 – 1924) 19 June 1920: <http://nla.gov.au/nla.news-article211909666&gt;. James and Margaret Rountree were buried at the Old Hamilton Cemetery. The following photo is a perfect example of most of my church photos and I wasn’t going to post it. Instead, I asked Mum to try her luck photographing the window. When I compared the two photos, I had to share both because of the different colours in each photo. This is Mum’s photo. Each was taken in the early afternoon, the first in April and the second in November. The angle was the main difference. 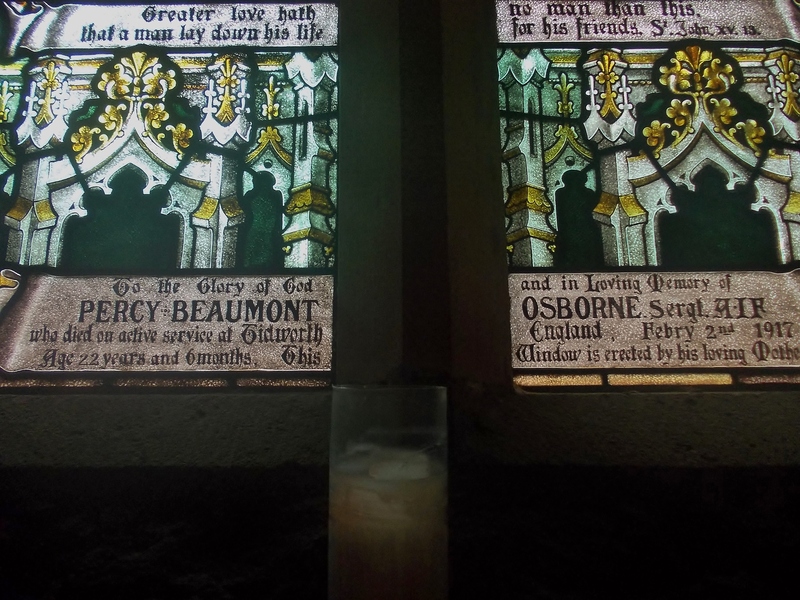 The window is dedicated to the memory of Percy Beaumont Osborne. Percy Beaumont Osborne was the stepson of Hamilton’s Anglican Vicar from 1907 until 1917, Charles Harris. He enlisted for WW1 on 11 February 1916 and left Australia for England on 28 July 1916. Percy died of Meningitis at Tidworth Military Hospital, England on 2 February 1917 aged twenty-two. 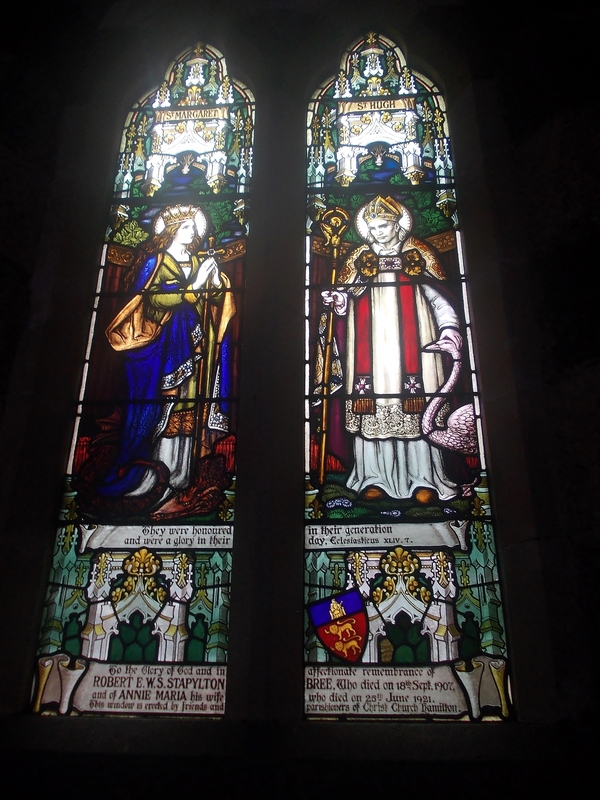 His memorial window was unveiled on Sunday 17 June 1917. 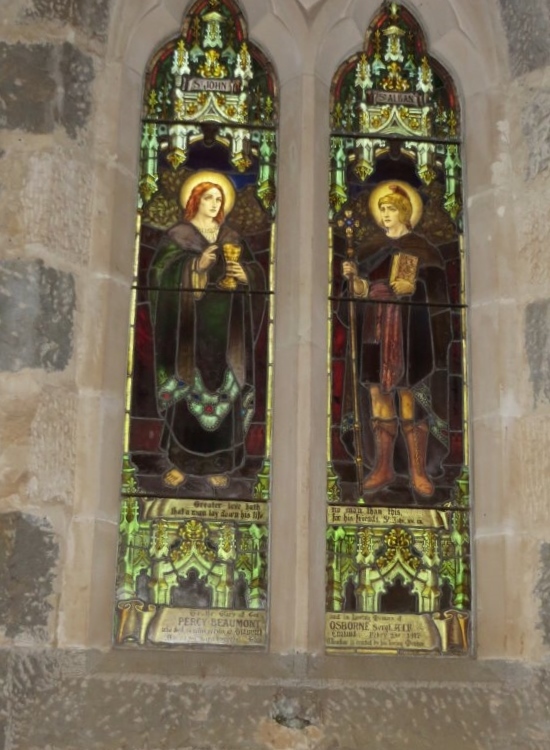 Memorial windows for WW1 soldiers are not unusual. 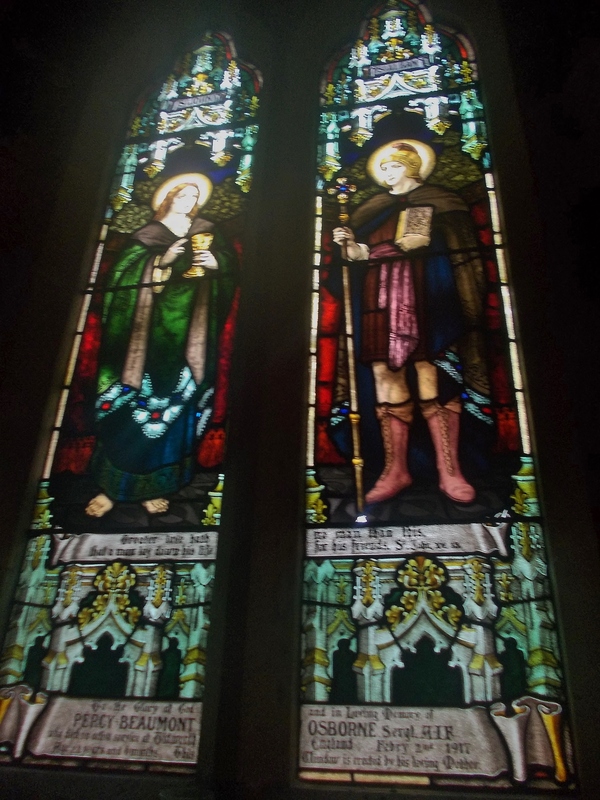 The former Baptist Church in Hamilton (now a private home), had five memorial windows installed for WW1 soldiers Alexander and Edgar Stevenson, James Sack, Joseph Brokenshire, Walter Filmer and Albert Herbert Lewis. The Victorian War Heritage Inventory site allows for searches by a soldier’s name or site of a memorial. I intend to add to my stained glass window photo collection and hopefully, with more practice, they’ll improve. 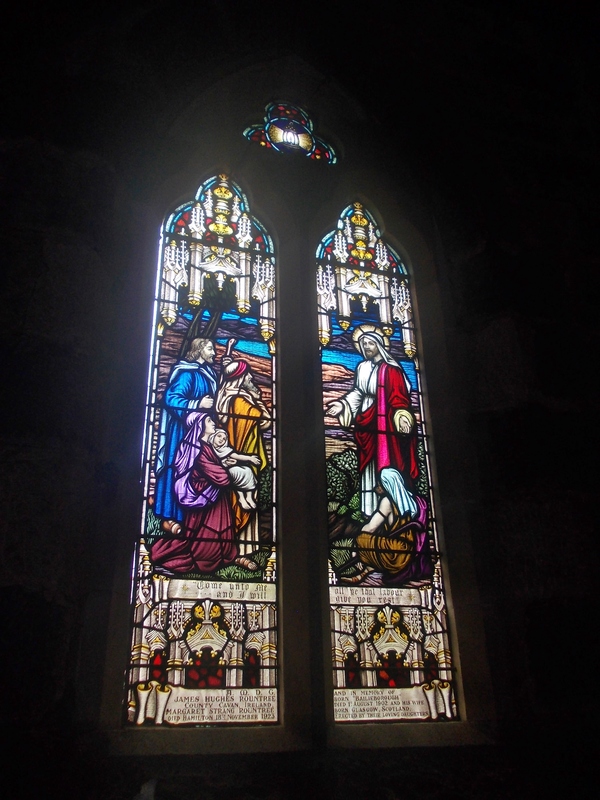 I’m keen to get back to St. Stephen’s Church in Portland where there are beautiful windows and a memorial tablet for Edward Ellis Henty was unveiled there on 1 July 1917. On 29 August 1836, Major Thomas Mitchell saw Portland Bay for the first time. Since we last were with Mitchell on his freezing night on the summit of Mount William in July 1836, he and his party had travelled a great distance and being winter, the terrain was mostly muddy. From Mount William, the party had travelled north to and climbed Mount Zero. Then west along the northern Grampians to Mount Arapiles and Mitre Lake. 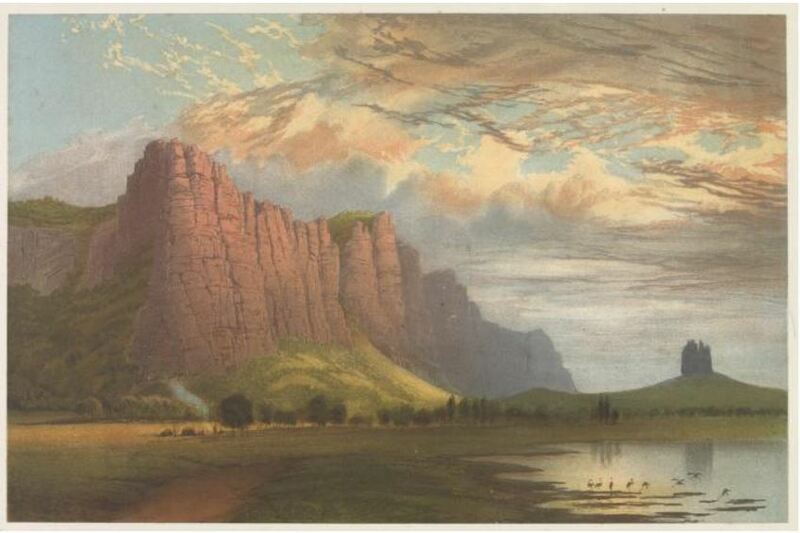 Scaling Mount Arapiles, which he named, Mitchell was able to see the country to the south and it was in that direction they next travelled. They soon met the Glenelg River near Harrow on 31 July, and from there they passed through Pigeon Ponds, Chetwynd, and Wando Vale. 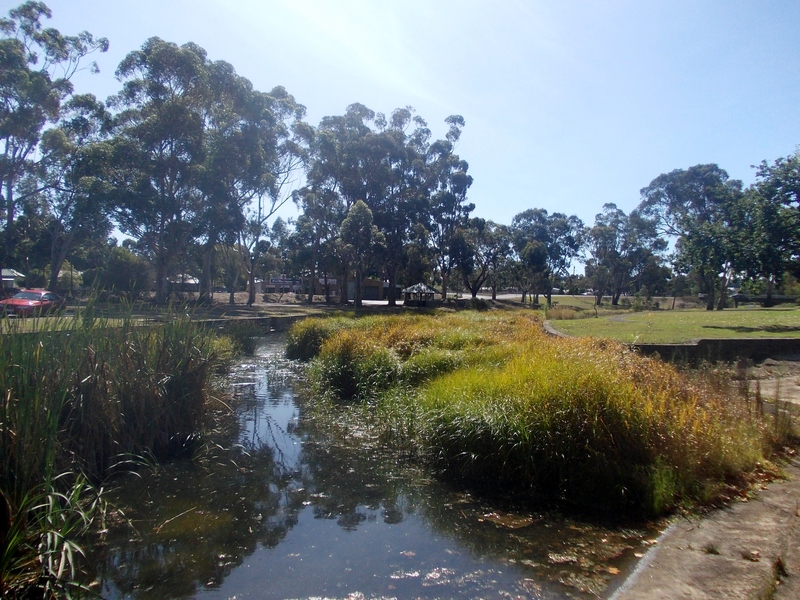 On 7 August, the party reached the Wannon valley south of Casterton at the Wannon River’s junction with the Glenelg River and saw a beautiful scene before them. 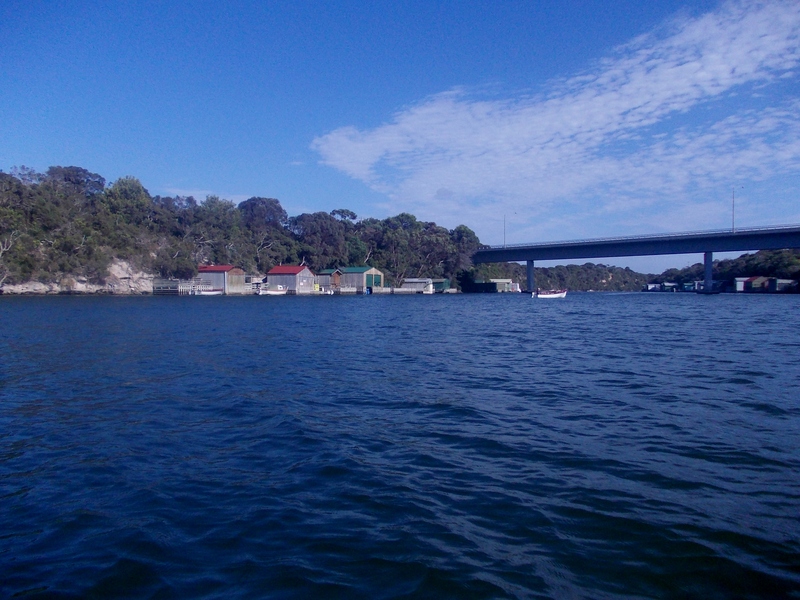 From there, they travelled to near where Dartmoor is today and Mitchell launched a boat on the Glenelg River at Fort O’Hare and with a small party, made his way to the sea. Expecting to come out near Portland Bay, they were further west, reaching the mouth of the river at what is now Nelson. 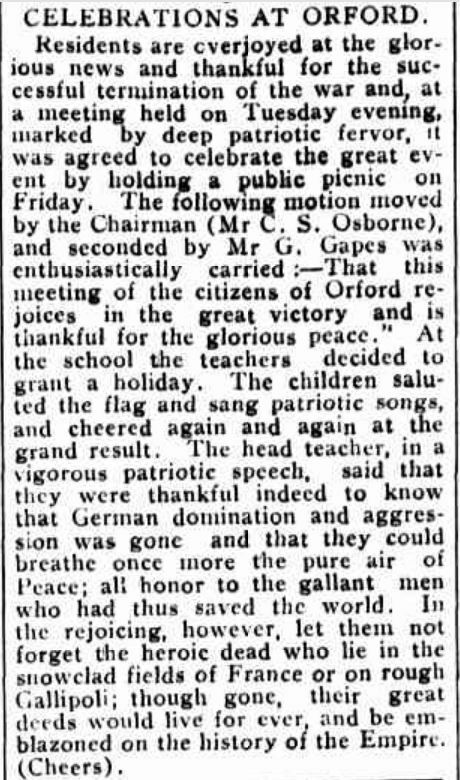 The party turned back up the river and returned to the camp at Fort O’Hare. They then travelled along the Crawford River and with the carts getting bogged down in heavy ground, Mitchell and a small party set out on horseback to Portland Bay. Their first stop was near Heywood and a large hill Mitchell climbed and named Mount Eckersley. From there they crossed the Fitzroy and Surry Rivers bringing us back to 29 August 1836 and Major Mitchell’s first sighting of the coast at Portland Bay. 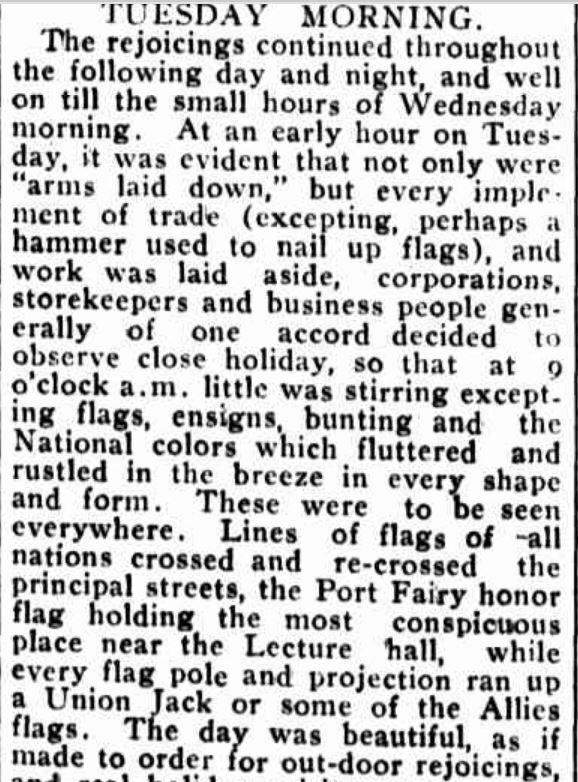 The following day, Mitchell made a trip to Cape Nelson then returned to Portland. Major Mitchell said his goodbyes to the Hentys and continued on his way. 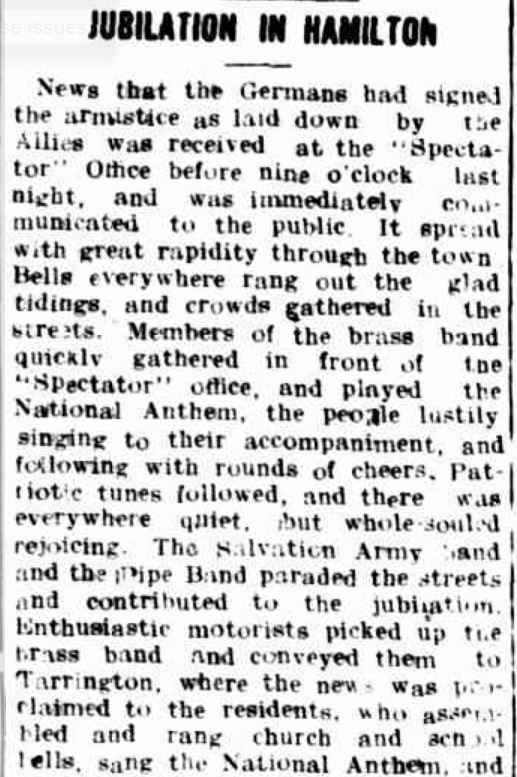 The party returned to the Surry River then continued back to the base camp. On 31 August, Mitchell’s party reached Mount Clay with Mitchell naming it, and by sunset they were back at the base camp. We leave Major Mitchell now but will join him again on 11 September when he reaches what is now Hamilton. The arrival of Major Mitchell at the doorstep of the Henty’s home at Portland Bay influenced their future. 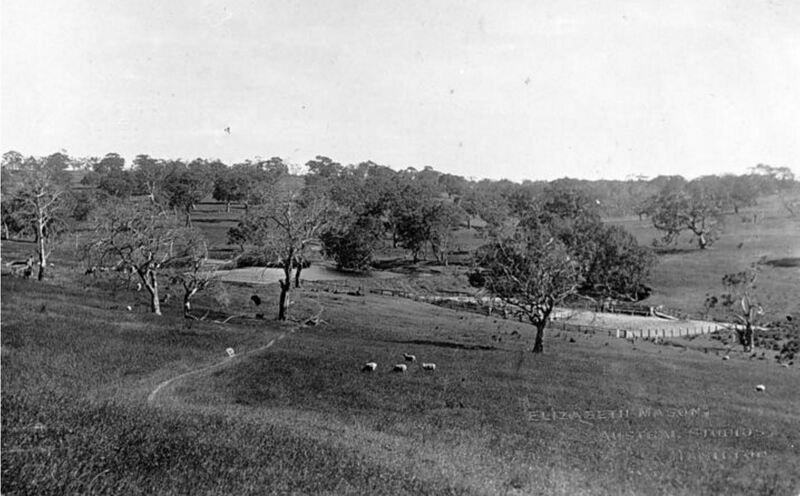 In glowing terms, Mitchell had told them of the land around the Wannon Valley he described as “Australia Felix”. On his recommendation, the brothers travelled north to see for themselves. Within twenty-five miles from their settlement at Portland Bay, they noticed the change in the countryside. 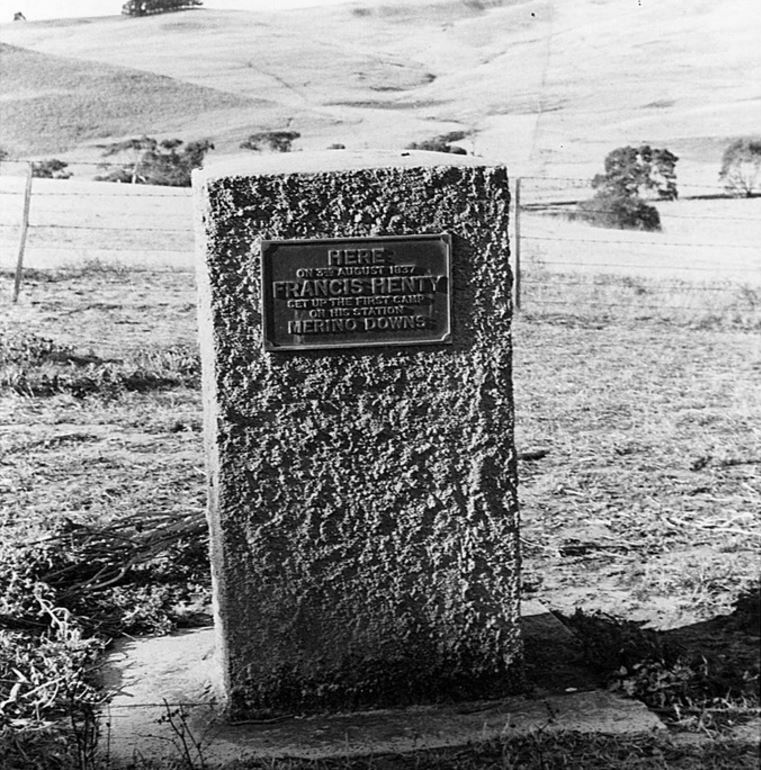 Stephen Henty’s reaction was simply, “This is paradise.” By 3 August 1837, Henty sheep were on the land at Merino Downs and soon Muntham Station, opening the next chapter in the history of the Henty brothers. This video of Muntham Station shows the countryside Major Mitchell and the Henty brothers found so attractive. Back to Merino and Henty Centenary Celebrations Committee Historic souvenir of the Back to Merino and Henty centenary celebrations, November 11th to 15th, 1937. 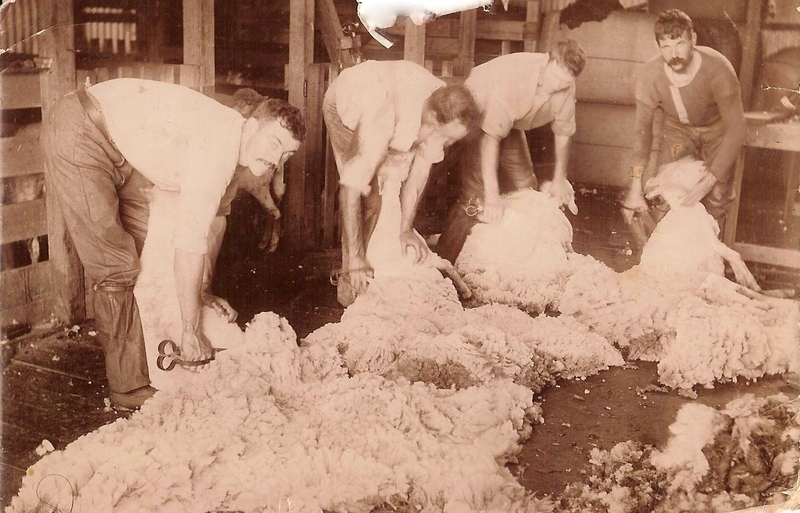 Back to Merino and Henty Centenary Celebrations Committee, [Merino? Vic, 1937. Dressed in a gown of steel grey cloth, trimmed with glacé silk and a “borrowed” tulle veil, Lily Buckland married George Sparrow on 9 April 1916 at Mount Eccles. The wedding was at the home of Lily’s sister and George’s brother, Alice and Charles Sparrow. Lillian Letitia Buckland was born at Briagolong in 1888, the eldest daughter of William Buckland and Hannah Oakley. 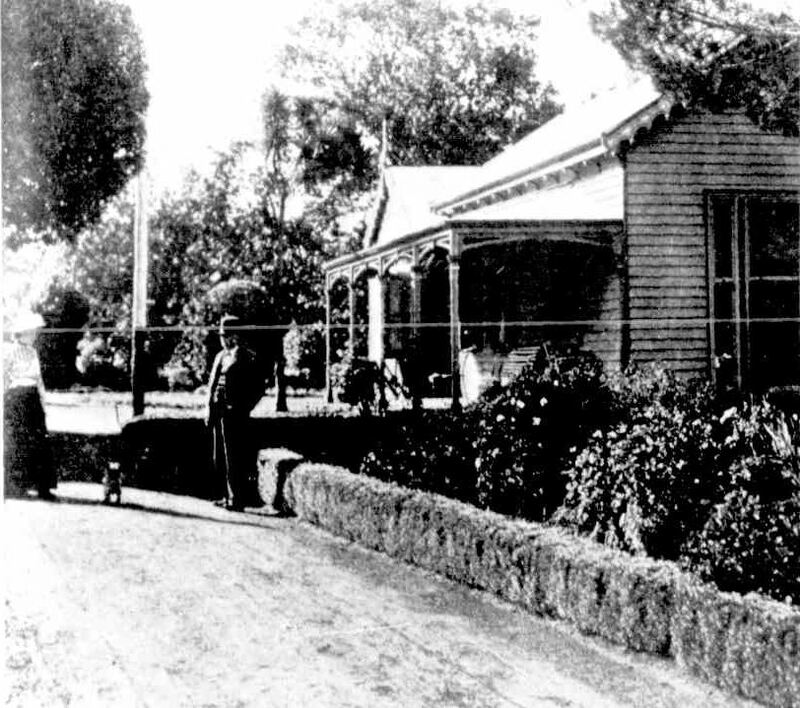 The family lived at Toora in Gippsland. George Henry Sparrow was born at Macarthur in 1891, a son of local residents, Abijah Sparrow and Emma Peters. The first instance of a union between the two families was the marriage of Alice Buckland and Charles Sparrow in 1913. How one family from Gippsland and another from the Western District came together is unknown. A year after the beginning of World War 2, two of George and Lily’s boys enlisted. Allan joined up on 29 June 1940 and served with the 2/23 Australian Infantry Battalion while Roy enlisted on 14 October 1940, serving with the 63rd Australian Infantry Battalion. Allan was discharged on 15 November 1945, however, Roy a Corporal continued on after the end of the war. On Friday evening 15 March 1946, rain began to fall on the roof of the Sparrow’s home, the likes they had never heard before. At home with George and Lily were three of their children, Mavis, Bruce and Ronald. The rain continued through the night and into Saturday night. On the morning of Sunday 17 March 1946, the Sparrow family woke to the sound of water lapping at their beds. Outside, water was rising rapidly around the property and they decided to evacuate. Leaving their domestic animals and poultry to find high ground themselves, Lily and the children climbed into their jinker with George leading the horse, guiding it along the already flooded roads. It was increasingly difficult for George to distinguish the dangers ahead in the floodwaters, and not far from the house, a wheel of the jinker fell into a concealed hole and upturned, tipping the passengers into the water. George tried desperately to save his family but the water was deep and fast flowing. In his attempt to get help, he became exhausted, collapsed and died. “SEARCH FOR FLOOD VICTIMS” Advocate (Burnie, Tas. : 1890 – 1954) 23 March 1946: <http://nla.gov.au/nla.news-article68968037&gt;. A search party was soon looking for Lily and her children. Mavis, Bruce and Ronald’s bodies were found in a hole close to the jinker, the water in the hole was over two metres deep. Lily’s body was found caught in a fence over three kilometres away, such was the force of the water. Mavis was twenty-five, Bruce twenty-two, and Ronald, fifteen. Five family members lost in a terrible tragedy. Rumours were flying that were was no need for them to leave, but servicemen who went to the house during the search supported their actions after seeing the high watermark on the walls. Sadly for the Sparrow family, when one of their surviving sons arrived at the farm the following day, he found the chooks and the household dogs and cats had survived the flood. The Argus (Melbourne, Vic. : 1848 – 1957) 20 March 1946 <http://nla.gov.au/nla.news-page1668019&gt;. 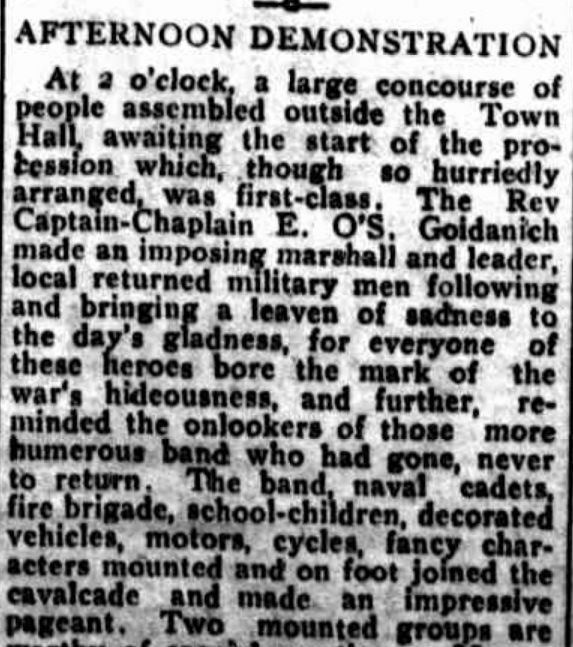 On the afternoon of Thursday 21 March 1946, the sun broke through the clouds as hundreds made their way to Macarthur’s Church of England for the funeral of the Sparrow family. Among the many floral tributes was a sheaf of flowers sent by the Governor of Victoria and his wife Sir Winston and Lady Dugan, including a personal message for the remaining members of the family. Just days before they had passed through the Macarthur district, including the Sparrow property, to witness the devastation. The Sparrow family were victims of one of Western Victoria’s worst natural disasters. More used to the ravages of fire, residents were to witness rising rivers and creeks over the weekend of 16 and 17 March that soon turned their part of Victoria into an inland sea. “FLOODS DEVASTATE WESTERN DISTRICT” The Horsham Times (Vic. : 1882 – 1954) 19 March 1946: 3. Web. 7 Mar 2016 <http://nla.gov.au/nla.news-article73076468&gt;. 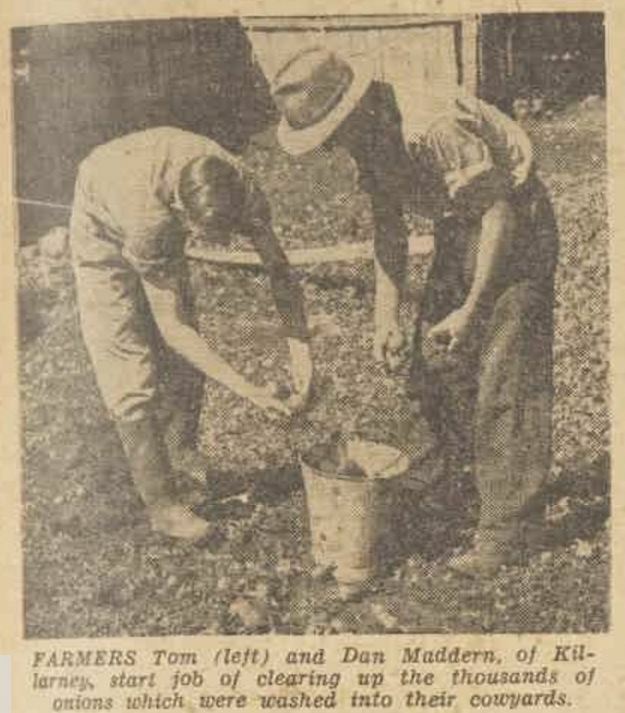 The Western District was ravaged by drought from 1939 to 1945 with disastrous bushfires sweeping through the Western District in January 1944. 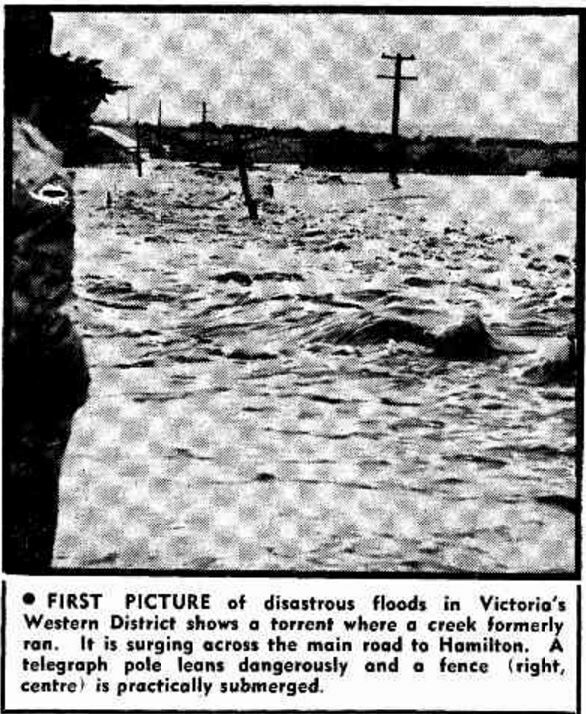 “TUESDAY, MARCH 19, 1946 AND NOW A FLOOD” The Argus (Melbourne, Vic. : 1848 – 1957) 19 March 1946 <http://nla.gov.au/nla.news-article22235082&gt;. 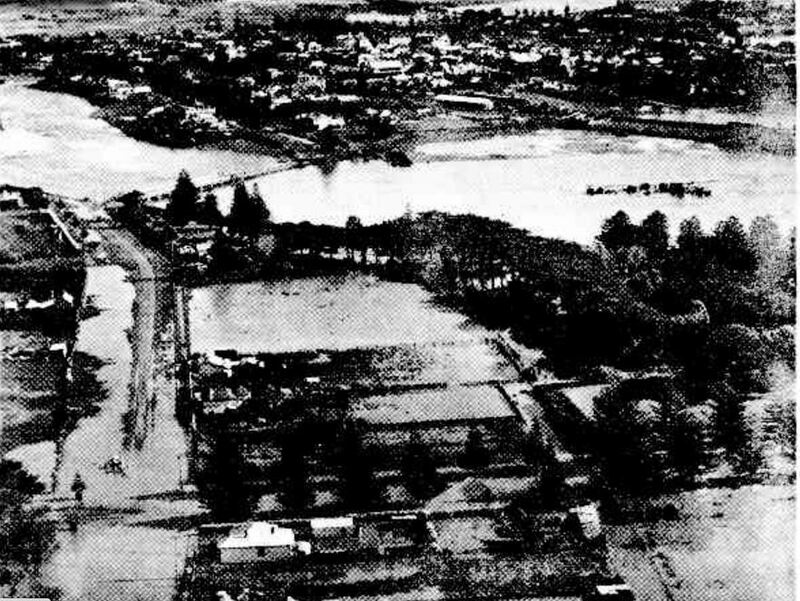 Early in March 1946, parts of Queensland and New South Wales were under floodwaters due to a tropical cyclone. On March 10, cold, wet and windy weather hit Victoria. At 9:00 am on Monday 11 March, the previous forty-eight hours had produced 52 mm of rain in Port Fairy, one of the highest rainfall totals in the Western District for the period while 36 mm fell at Hamilton. A cyclonic depression moved across South Australia in the following days before reaching the Western District on Friday 15 March where it stopped. 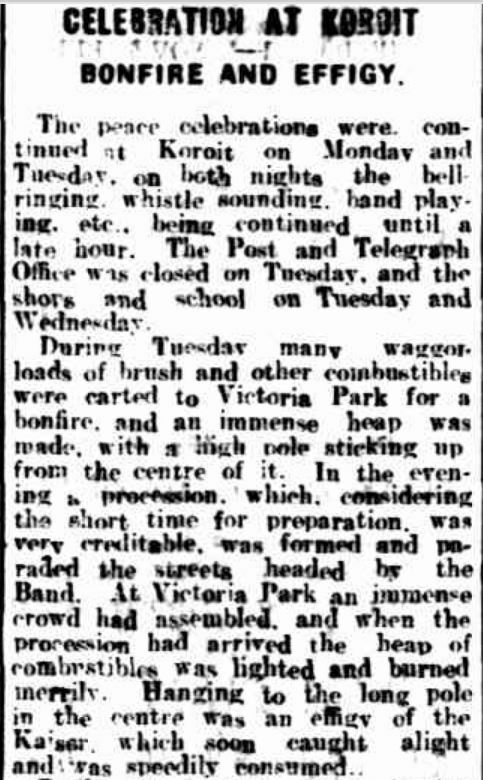 The forecast for Victoria published in The Argus of Friday 15 March was for some rain developing from the west and then showers. At 9:00 pm on Friday night, the forecast was “cold and unsettled with some showers. Some heavy rain, with hail, on and south of the ranges”. That heavy rain was of tropical proportions falling from Friday night and through the weekend. 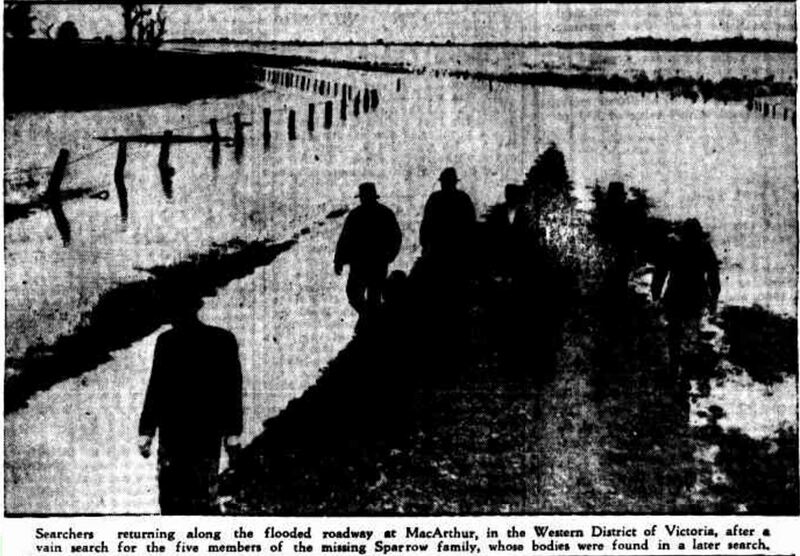 By Monday 18 March, The Argus reported the floods covered the Western District from Natimuk in the southern Wimmera to the sea, and to the east to Mortlake. Police headquarters at Russell Street Melbourne said that a stretch of water up to four metres lay from Hamilton to the coast. The map below shows the extent of the rainfall. 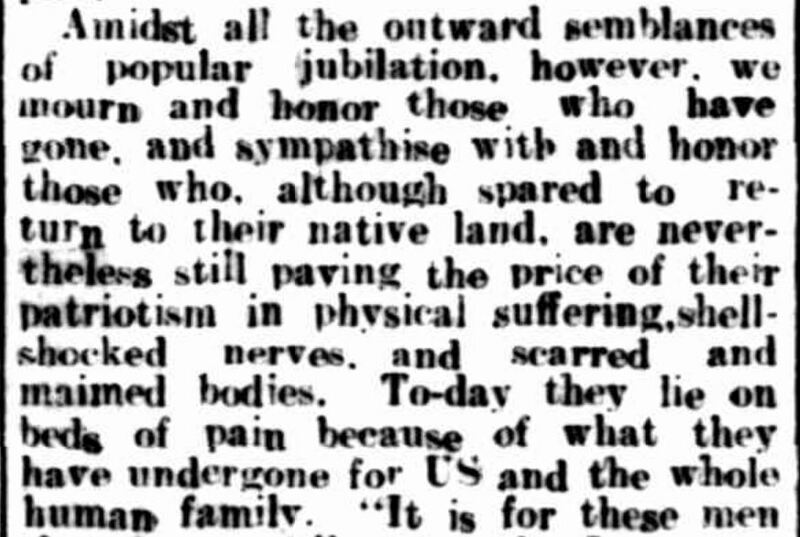 “FAMILY TAKEN OFF ROOF” The Sydney Morning Herald (NSW : 1842 – 1954) 19 March 1946 . There were evacuations from many towns including Hamilton, Portland, Port Fairy, Warrnambool and Casterton. Rescuers took to boats trying to save families, many clinging to the roofs of their houses. Thousands of head of stock were lost, bridges and roads washed away, telephone lines were down and railway lines damaged. 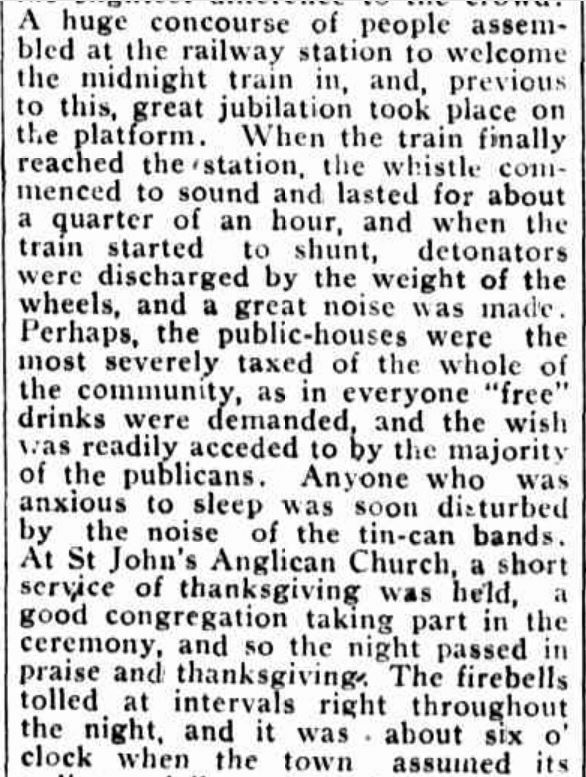 There were mass cancellations of trains and buses. 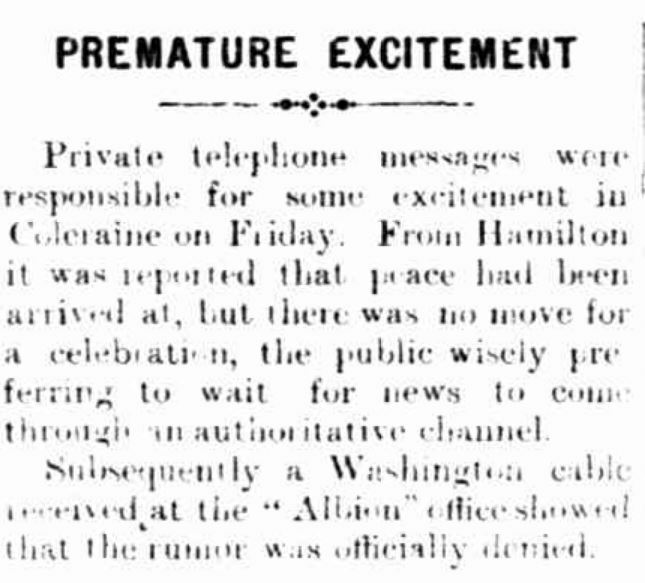 Towns were cut off with little means of communication. 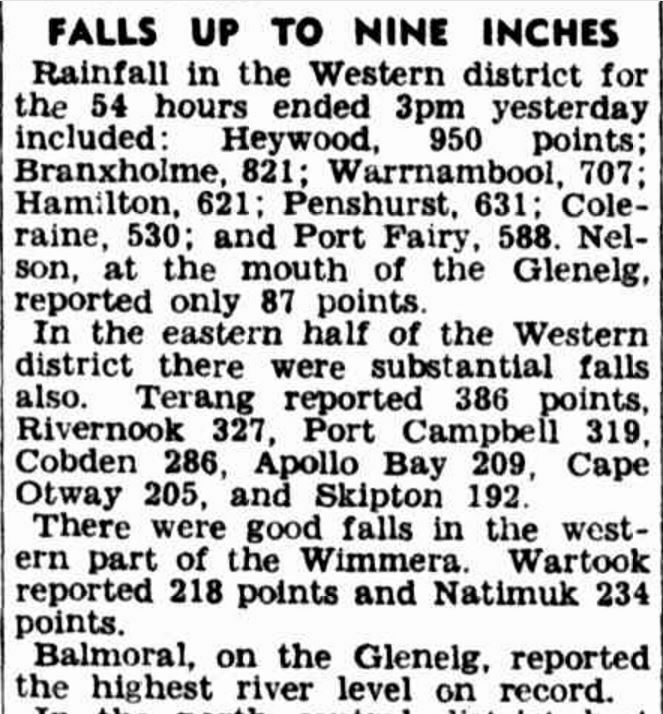 On Tuesday 19 March 1946, The Argus published the rainfall totals from 9:00 am on Saturday 17 March until 3:00 pm on Monday 18 March. 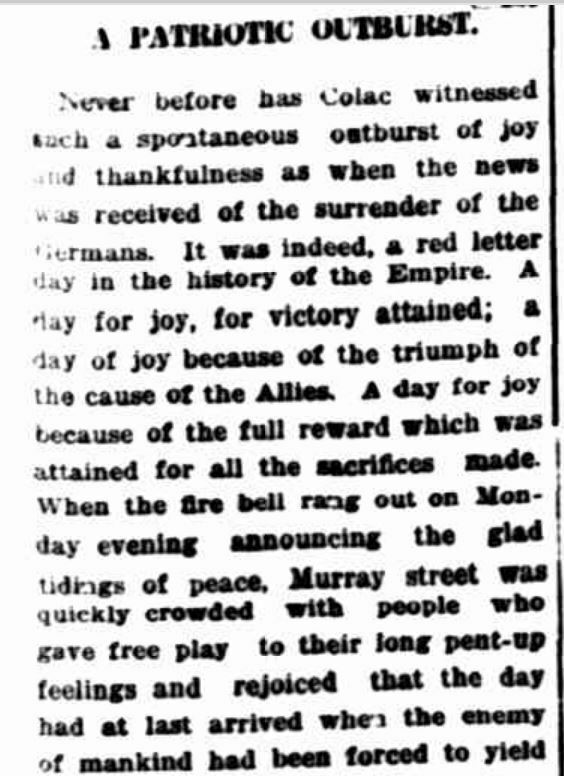 “TEMPORARILY FINE TODAY New Depression Approaching” The Argus (Melbourne, Vic. 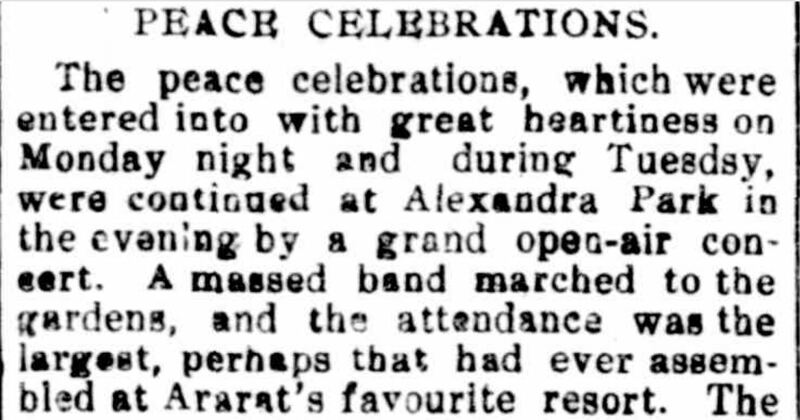 : 1848 – 1957) 19 March 1946 http://nla.gov.au/nla.news-article22235127 . While many communities were flooded, the following were those most severely affected by the big flood of 1946. Parts of the countryside around Macarthur were under three metres of water stranding families on their roofs hoping for rescue. Around nine kilometres south of Macarthur, on the Port Fairy Road, a bridge washed away. Stock losses in the district were estimated at 5000 sheep and 500 head of cattle. There was concern among authorities about the possible outbreak of disease, with livestock hanging on fences in the flood waters. Posing a threat to rescuers were hundreds of snakes swimming in the water. In the Wallacedale/Condah area, ten houses were evacuated and dairy herds were lost. Some parts were under three metres of water. Mr & Mrs Edgar Lacey and Miss Grace Tullett took refuge on the roof of the Lacey home. To shelter from the heavy rain and strong winds, they were able to remove a sheet of tin and climb into the ceiling. With them on the roof, also seeking refuge, were several snakes. A RAAF Catalina Flying boat was flown in to rescue the trio. 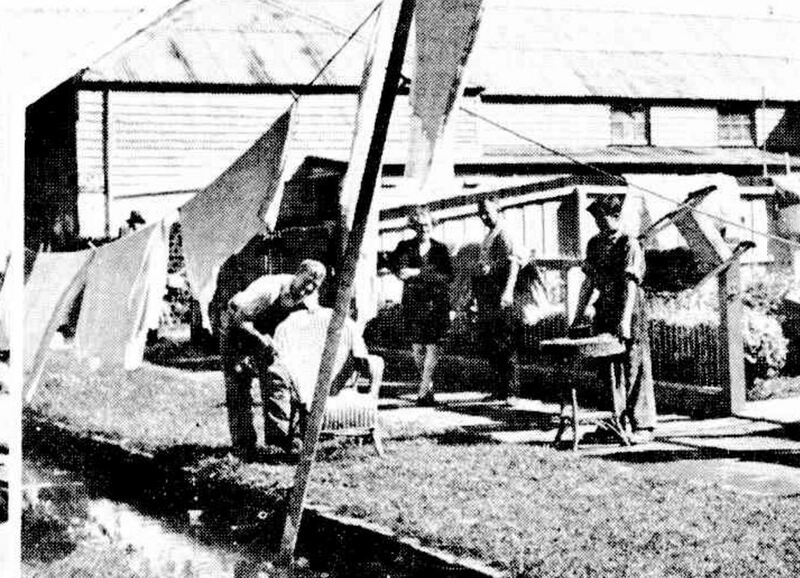 On arrival, the pilot could not find them so he returned to Williamstown, NSW. Next, a flat-bottomed boat tried but failed to retrieve them. 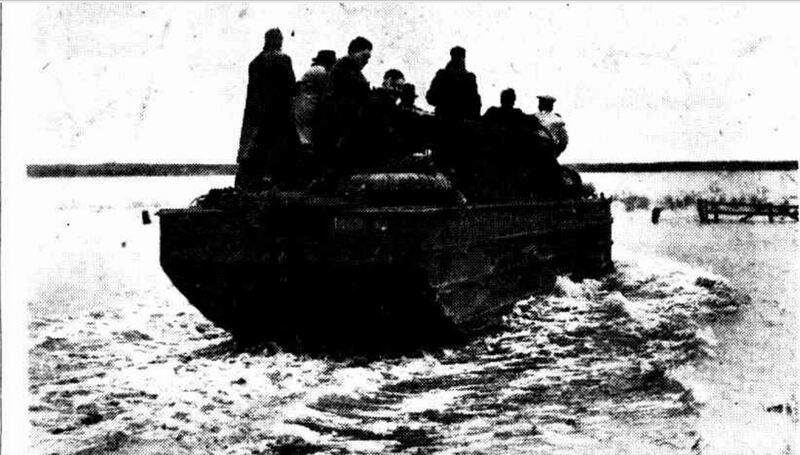 An amphibious car from the Army or Army “duck” was the next plan. Finally, after twenty-five hours, they were rescued but it was several days until the water subsided around their house. 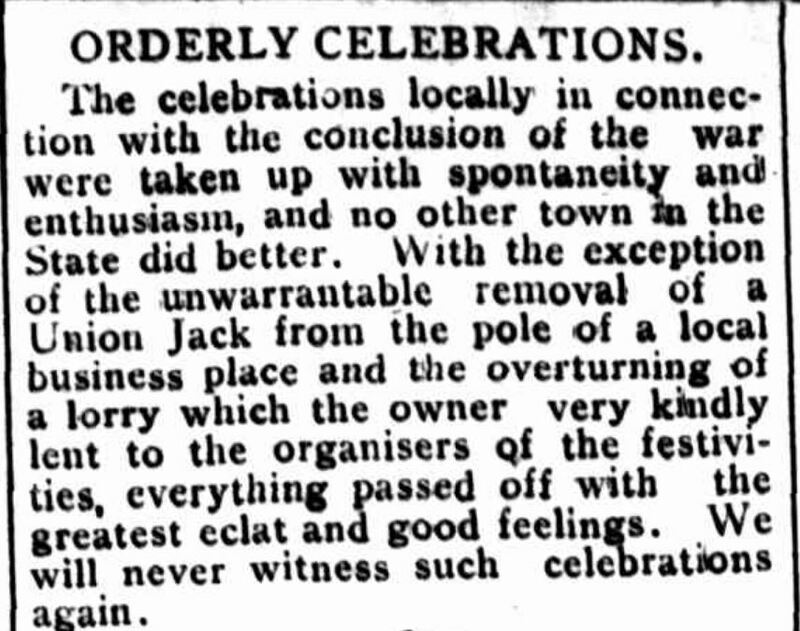 “TOWNSHIP ISOLATED” Examiner (Launceston, Tas. : 1900 – 1954) 21 March 1946: <http://nla.gov.au/nla.news-article92700639&gt;. Miles of fencing and roads washed away and there were heavy losses to livestock including horses and pigs. A beekeeper’s hives bobbed in the water with the stranded bees atop of the boxes. Rescuers saw thousands of snakes while delirious rabbits, marooned on high ground, were caught and their skins sold. Branxholme had 394 mm of rain from the Friday until the Monday edition of The Argus went to print and the town was cut off by road, rail and telephone. At Byaduk, Mr Tyres rescued seven people from a raft. More were evacuated but were able to return home on Tuesday including Mr and Mrs McCready. Mr J. Scott and Miss Suttie had their homes flooded. David Kinghorn was rescued from a haystack. Hamilton saw the heaviest rainfall since records were first kept. Up until 3:00 pm on Monday 18 March 219mm had fallen in fifty-fours, the town’s largest recorded total over the same period. The highest previous monthly rainfall total was 311 mm set in December 1930. The Grange Burn, usually quietly meandering through parts of the town, quickly rose and became a raging river. Around twenty homes near the railway station were evacuated on Saturday 16 March. 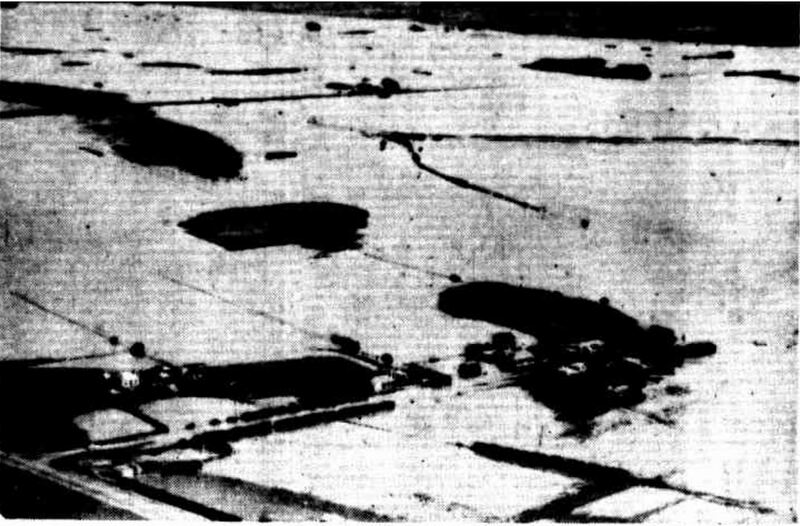 Fuel depots near the creek were underwater and hundreds of oil drums from the Shell and the Commonwealth Oil Refinery depots washed down the Grange Burn, accumulating against bridges and fences. Two other fuel depots were badly damaged. One underground petrol tank pushed its way to the surface. Iron from the fuel depots wrapped around trees and plaster from a nearby factory was spread up to almost 100 metres. In those days, the Hamilton swimming pool was on the Grange Burn, at the Braeside Weir, close to the fuel depots. GRANGE BURN LOOKING TOWARD THE BALLARAT ROAD BRIDGE. A view of the Grange Burn near the Portland Road bridge is below. 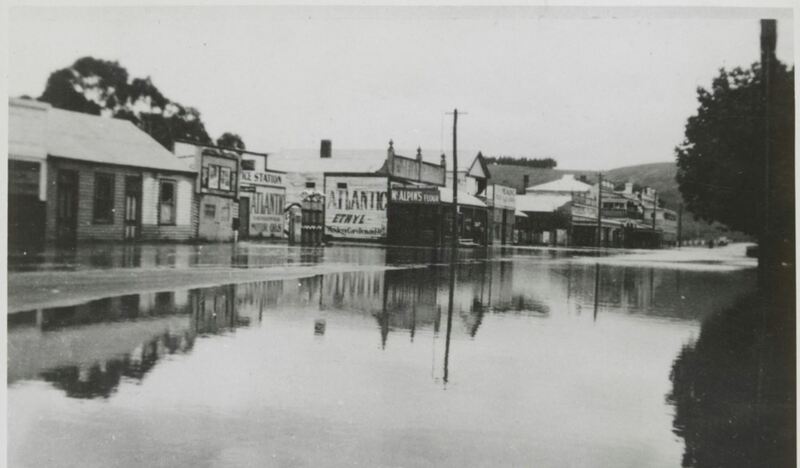 Many bridges and roads around the town were impassable and the drains in Lonsdale Street overflowed. 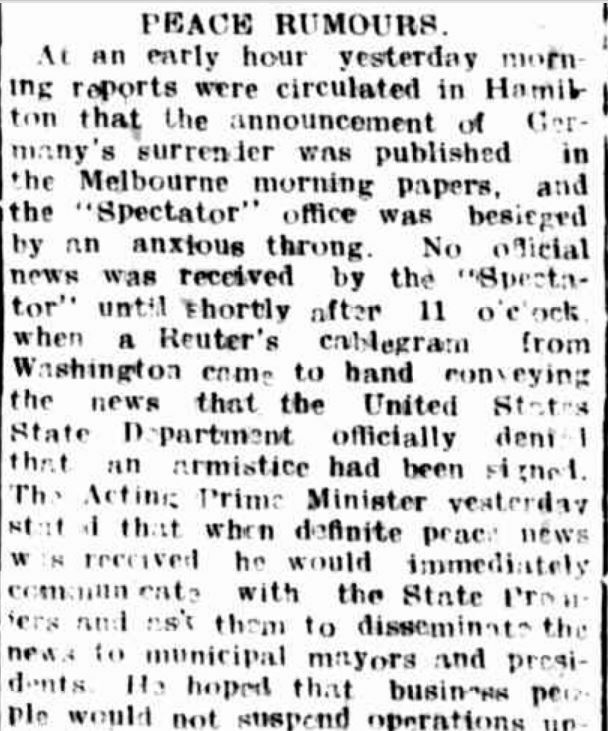 The Hamilton Town Hall became “home” to around seventy evacuees and Mayor Rasmussen called on residents to take those evacuated into their homes. Water went through twenty-five to thirty homes, reaching a depth of almost a metre in some. Mr Brimacombe of Martin Street lost all but one of his 250 chooks. 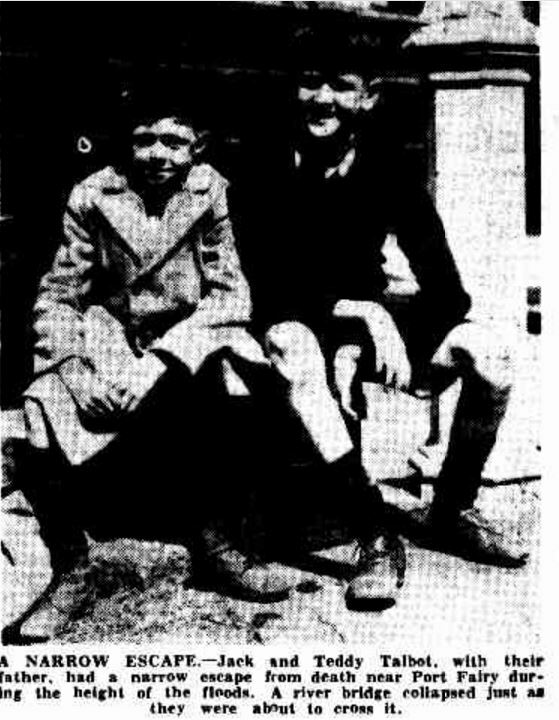 By Monday 18 March, travellers marooned in Hamilton were taken to Portland. Road connections between Warrnambool and Mt Gambier reopened and by Tuesday morning, Ansetts ran a bus from Horsham to Hamilton. An Army “duck” arrived, using the town as its base. 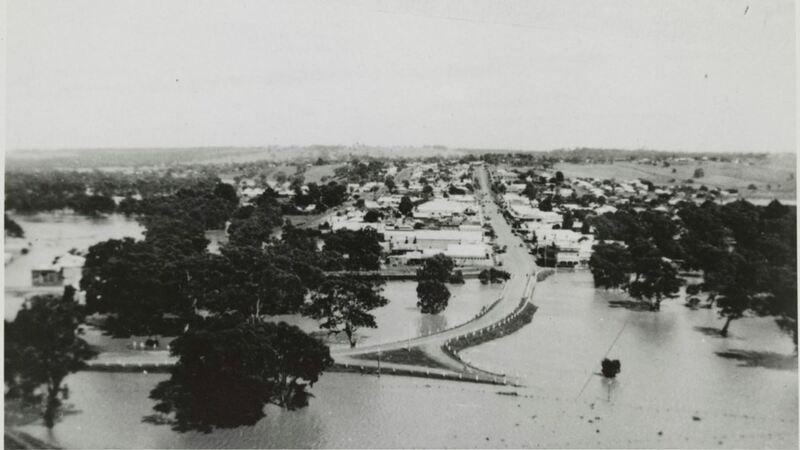 The photos below, used with permission from Jacinta Hanelt, depict the 1983 floods in Hamilton. They show the same areas flooded in 1946 and although not has deep as those floods, they give an idea as to the extent of the 1946 floods. Despite the damage to the fuel depots in 1946, they remained located close to the Grange Burn. 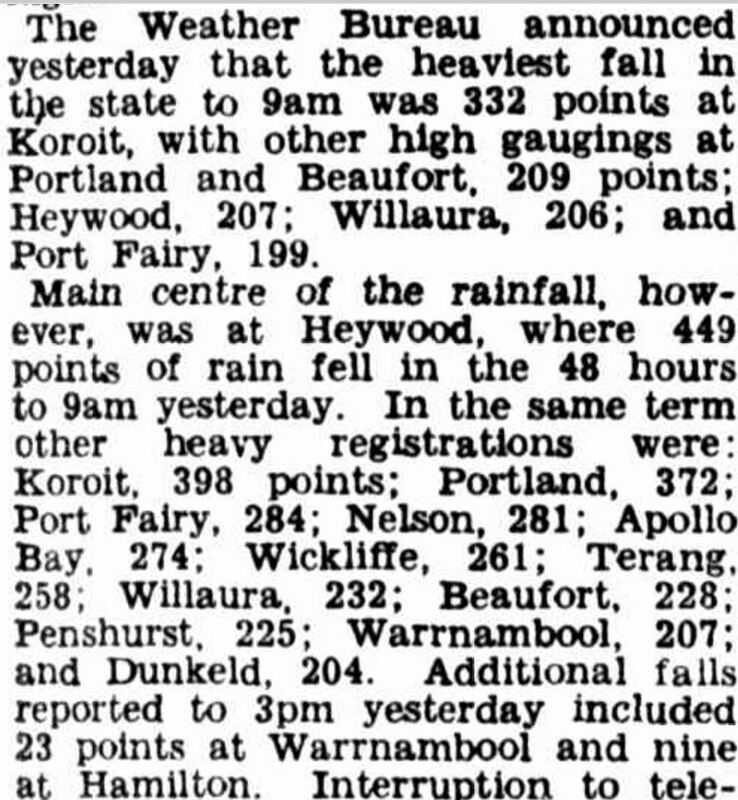 In forty-eight hours at Warrnambool, 228 mm of rain fell accompanied by gale force winds. 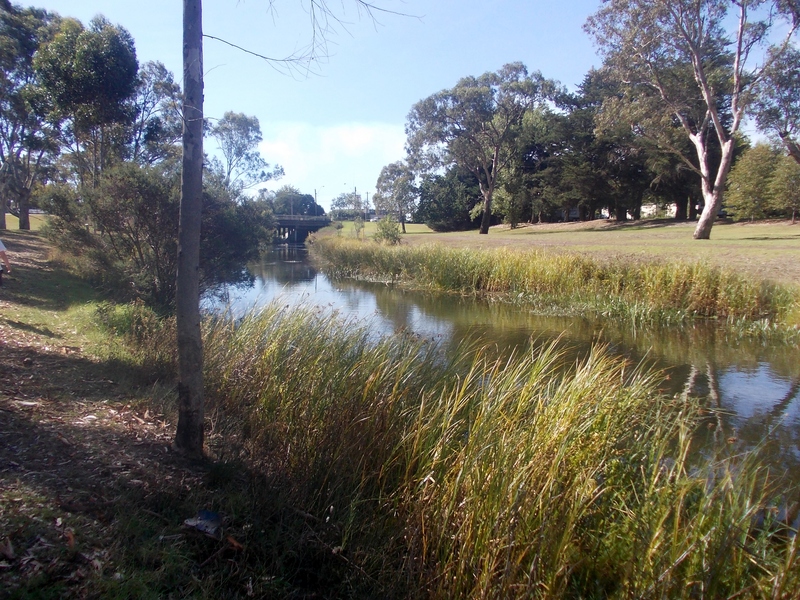 There was flooding along the Russell’s Creek, Merri Creek and Hopkins River. The 3YB radio transmitter was surrounded by three metres of water and sandbags and pumps were called for. At least seven bridges in the shire were damaged. Nearby Dennington was under water but in South Warrnambool, only four homes required evacuation. Old residents said they hadn’t seen anything like it. 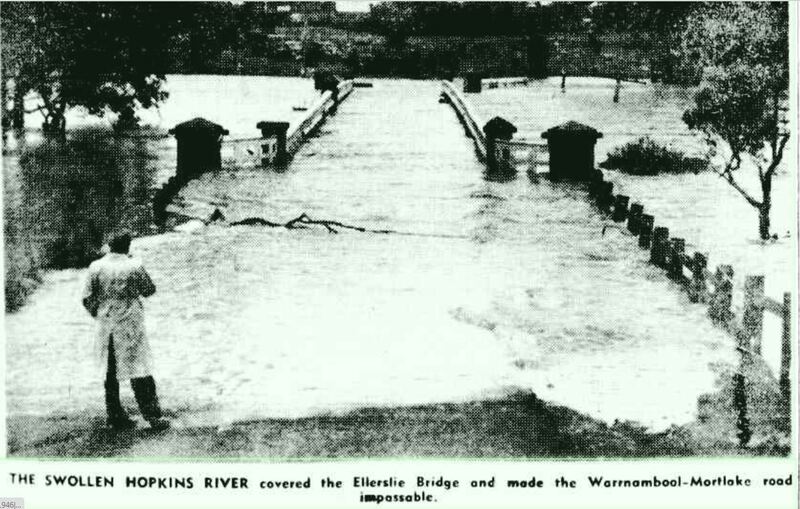 During Monday 18 March, the Hopkins River was rising at a rate of thirty centimetres an hour and later that night, the river burst its banks leaving the highway up to 1.2m under water. Meanwhile, Allansford residents were preparing to leave their homes. 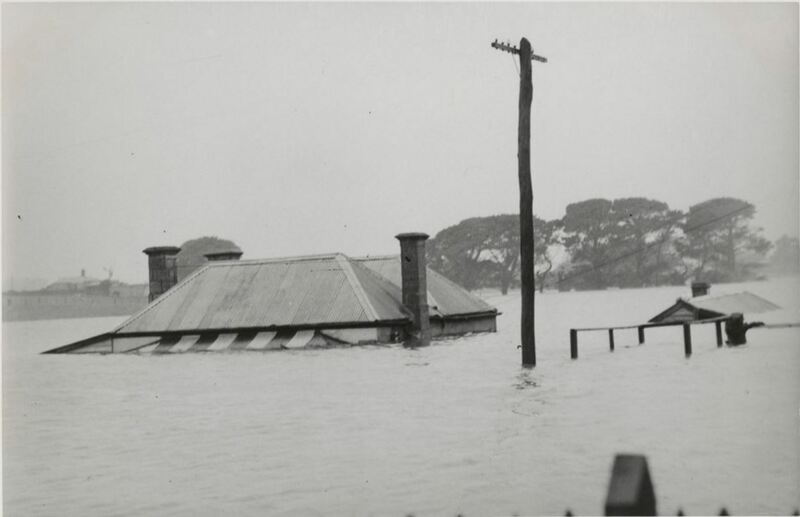 The following video from Warrnambool Historical Pictures – Alex Wilkins Collection, gives an amazing insight into how the floods impacted Warrnambool and district and includes some dramatic footage. 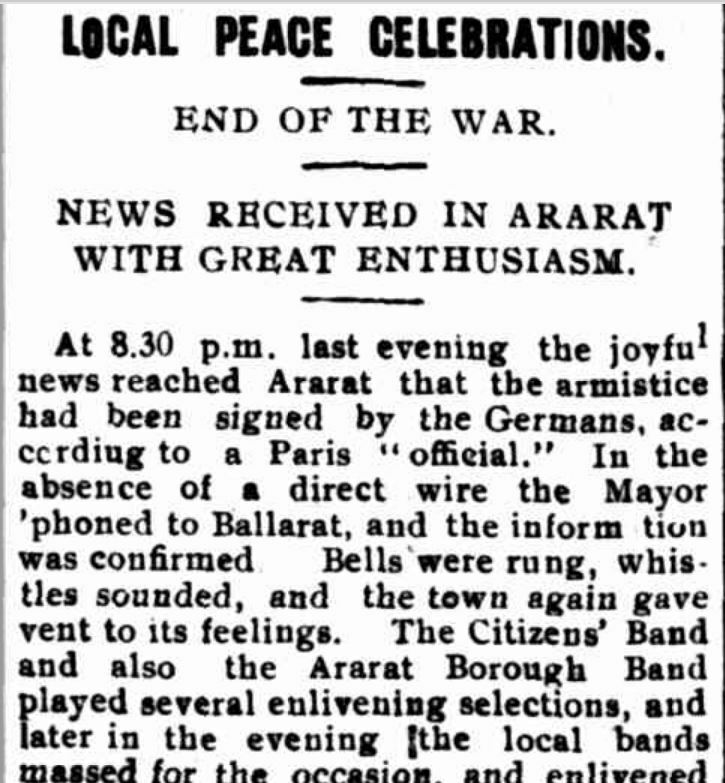 The Argus (Melbourne, Vic. 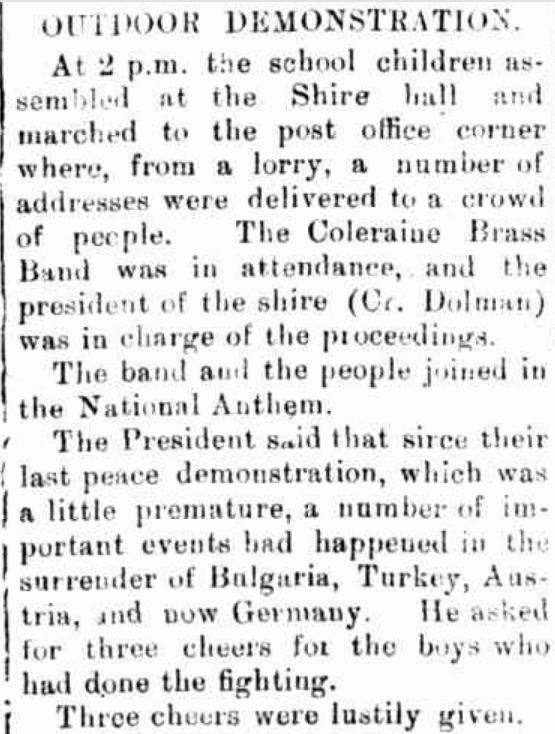 : 1848 – 1957) 20 March 1946: <http://nla.gov.au/nla.news-page1668019&gt;. And the road to Port Fairy was also cut, with the following photo showing the situation about five kilometres west of Warrnambool on the Princes Highway. 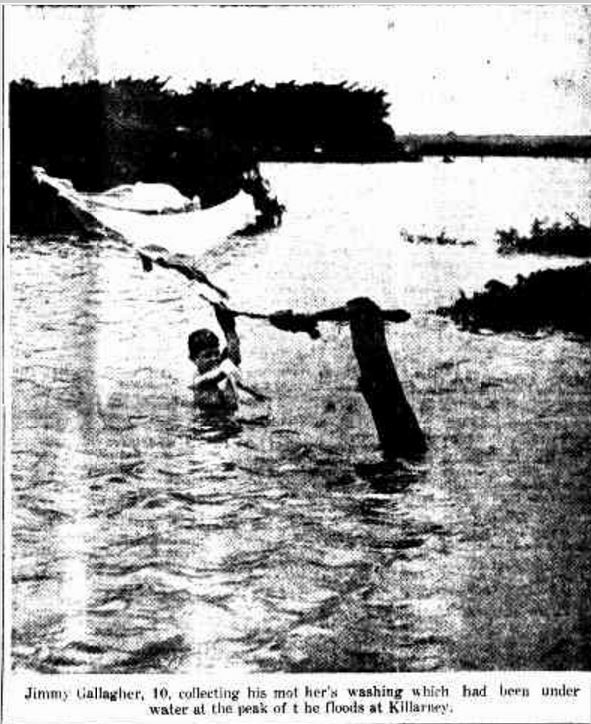 “DISASTROUS FLOODS IN VICTORIA.” Townsville Daily Bulletin (Qld. : 1907 – 1954) 21 March 1946:. 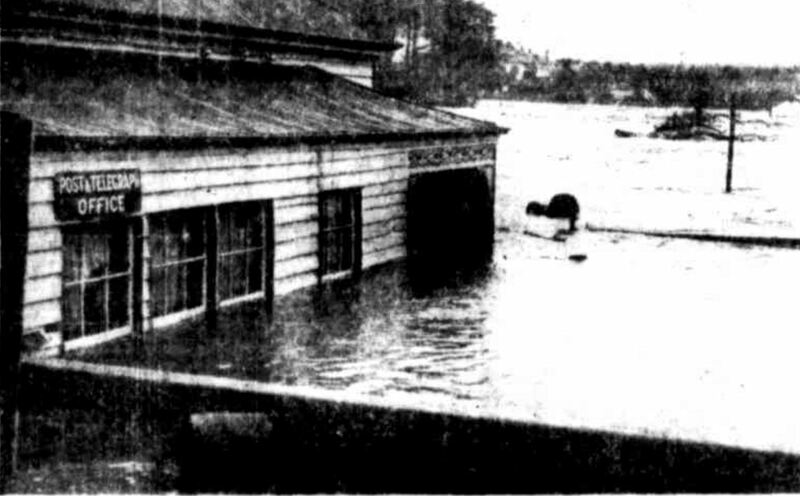 At Woodford, the local school teacher and his family were stranded in the Woodford Police Station and the post office was underwater (below). A herd of thirty dairy cows drowned. WOODFORD POST OFFICE “DISASTROUS FLOODS IN VICTORIA.” Townsville Daily Bulletin (Qld. : 1907 – 1954) 21 March 1946: <http://nla.gov.au/nla.news-article62889490&gt;. At Killarney, stranded cows on patches of high ground, helplessly slipped into the floodwaters as exhaustion overcame them. There were huge losses to potato and onion crops and Killarney resembled a lake. 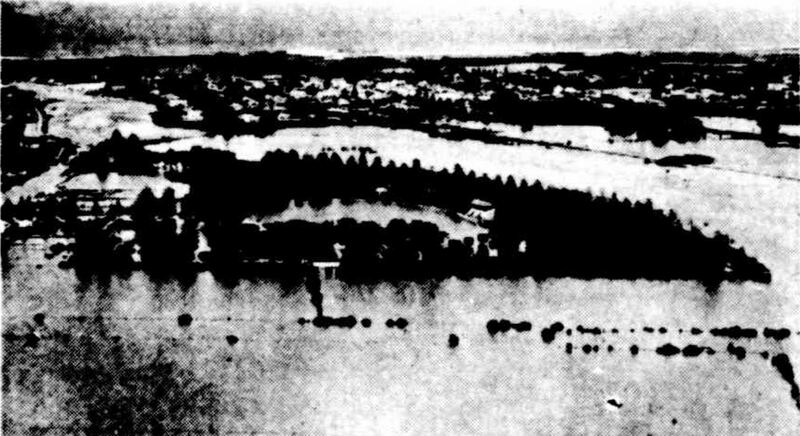 “WESTERN DISTRICTS OF VICTORIA FLOODED.” Daily Advertiser (Wagga Wagga, NSW : 1911 – 1954) 21 March 1946: 1. . The six-week-old baby of Mr and Mrs Patrick Lenehan was floated out a window of their house, the baby’s pram a substitute boat. “FLOODS LEAVE TRAIL OF DESTRUCTION” The Age (Melbourne, Vic. : 1854 – 1954) 19 March 1946:<http://nla.gov.au/nla.news-article206797296&gt;. Stories began to emerge of the heroics in the district. Widow, Mrs Madden and her eight children were saved by Jim Gleeson in his tractor. 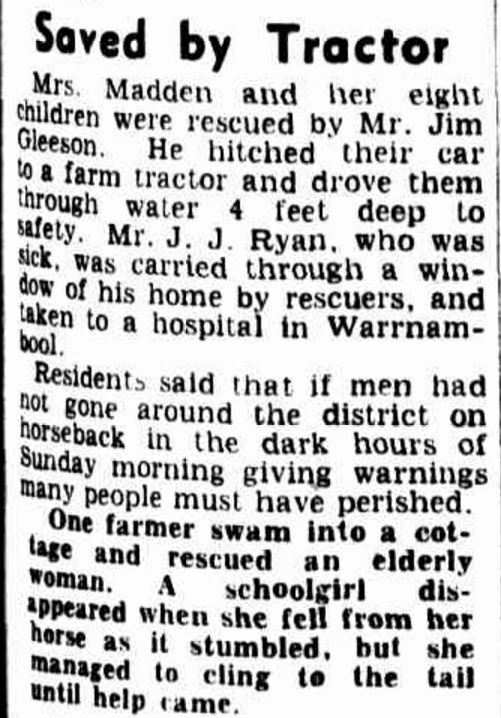 Another farmer saved an elderly woman from her cottage and Mr J. Ryan was taken to Warrnambool Hospital after being lifted through the window of his flooded home. “FLOODS LEAVE TRAIL OF DESTRUCTION” The Age (Melbourne, Vic. : 1854 – 1954) 19 March 1946: <http://nla.gov.au/nla.news-article206797296&gt;. Onion crops were wiped out leaving the vegetables bobbing in water or collecting in silt. Farmers tried to salvage what they could. Mrs Madden, rescued with her eight children by Jim Gleeson, returned to her home to begin the clean up. She is pictured below with her daughter Dorothy cleaning silt from their carpets. 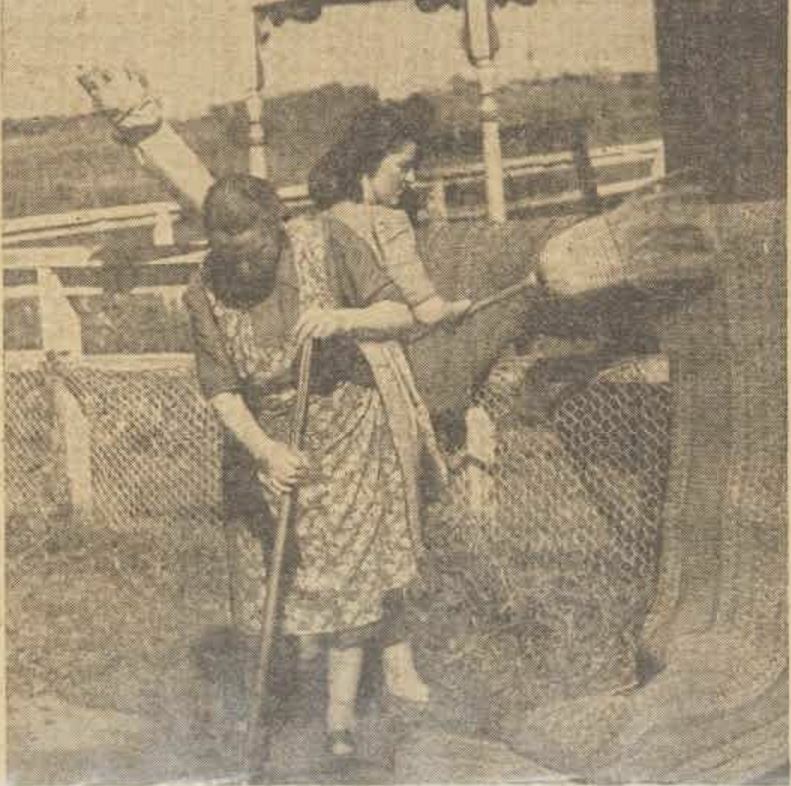 “Green pastures and hard work after floods” The Australian Women’s Weekly (1933 – 1982) 6 April 1946: <http://nla.gov.au/nla.news-article47490094&gt;. 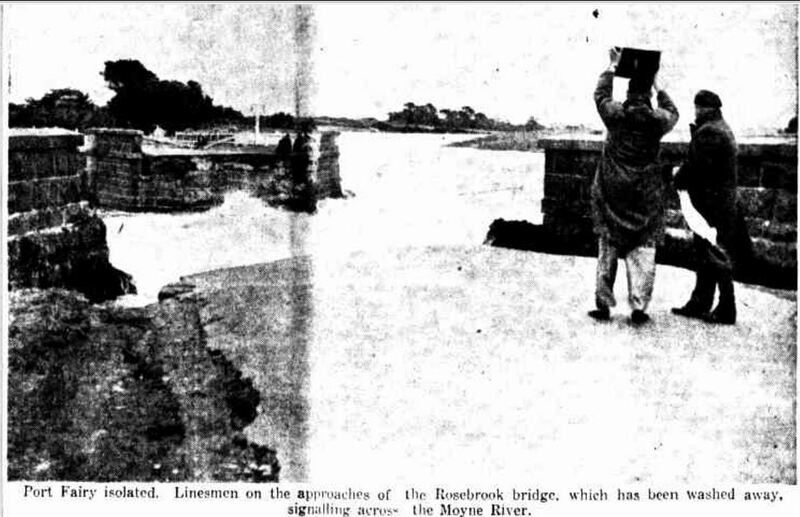 The bridge over the Moyne River at Rosebrook was also flooded and signals were sent across the bridge as a means of communication (below). 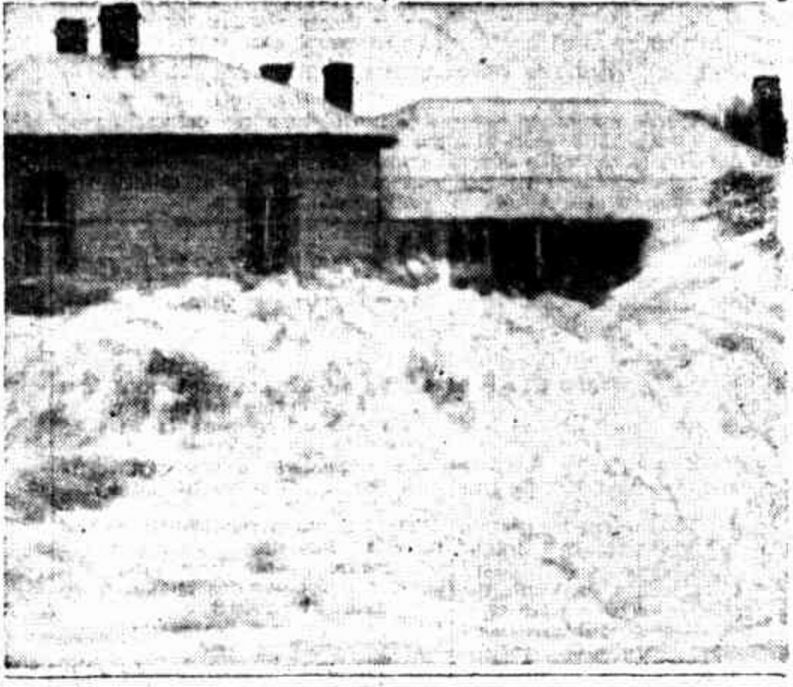 The Moyne River rose rapidly at Port Fairy leading to the evacuation of homes in the east of the town. 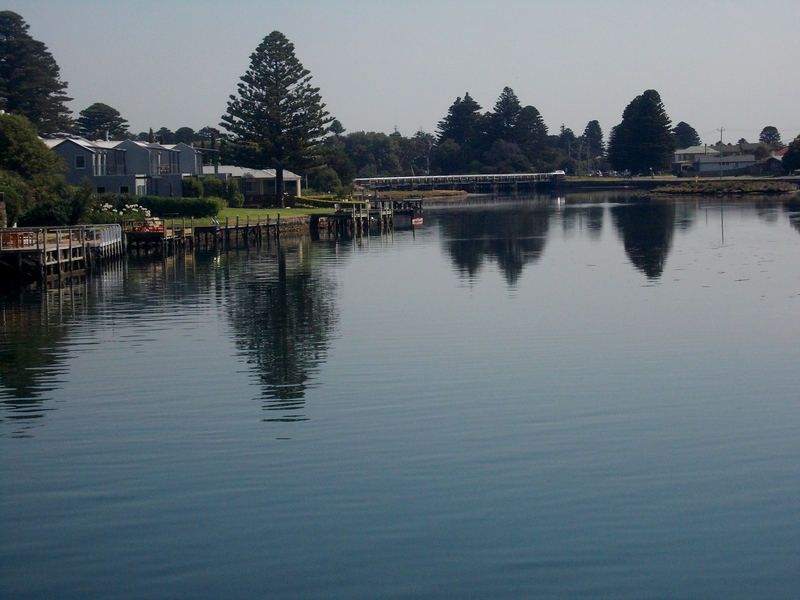 MOYNE RIVER , PORT FAIRY LOOKING EAST. Residents in Regent, William and Bank Streets were also evacuated with the water reaching almost a metre in Bank Street and running through houses. To the west of the town, water was up to 1.5 metres deep. Thousands of tonnes of potatoes and onions were lost and in Port Fairy North, Steel’s bridge gave way. Every hour, reports were arriving of stranded families. Power in the town was interrupted for sixteen hours. 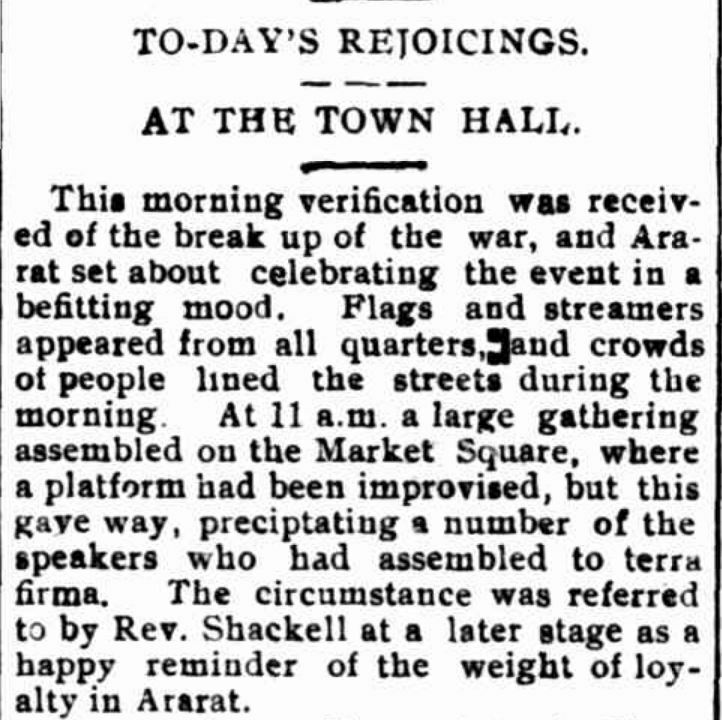 “Flood Waters Receding Around Port Fairy” The Argus (Melbourne, Vic. : 1848 – 1957) 20 March 1946: 15. Web. 1 Mar 2016 . The concrete wharf where fishing boats were moored broke up, threatening to wash boats out to sea. In the end, five boats were lost. Large slabs of concrete from the wharf were swept away and smashed. 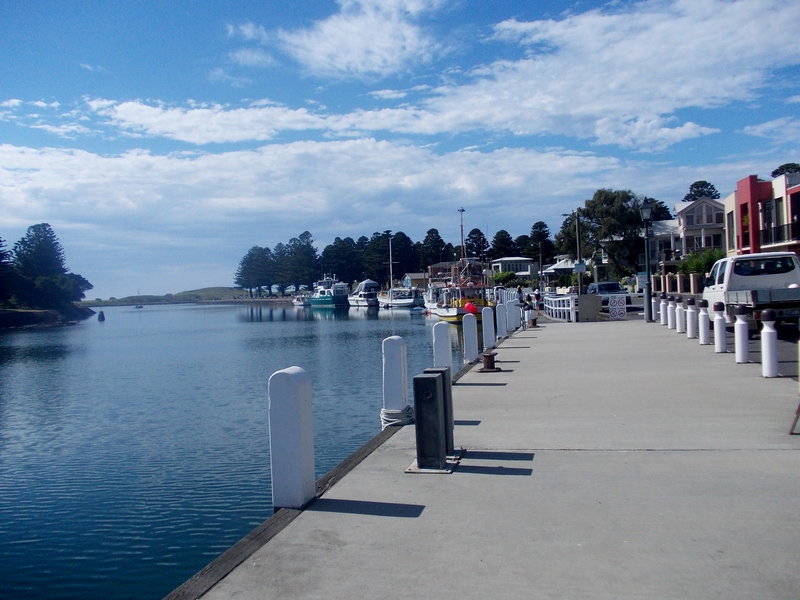 PORT FAIRY WHARF ON THE MOYNE RIVER LOOKING TOWARD THE MOUTH OF THE RIVER. 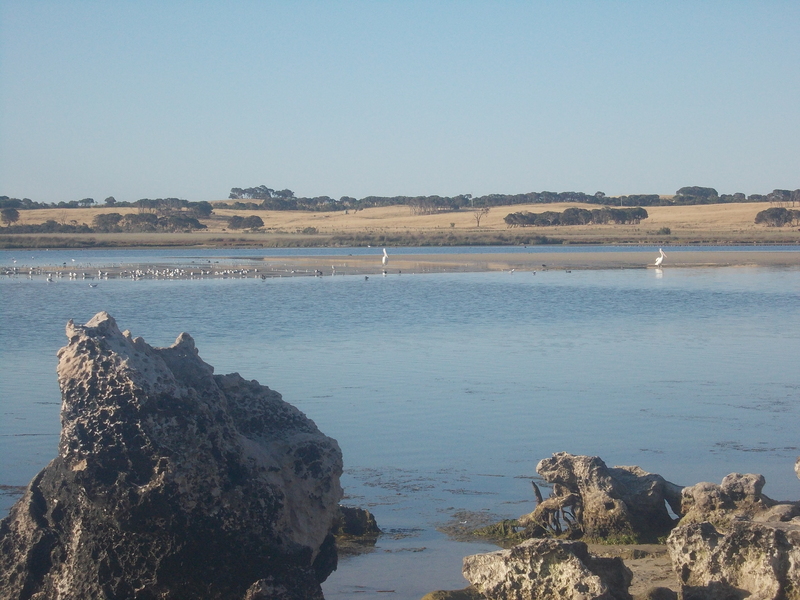 Although it’s not clear, the following photo gives some indication of the torrents of water to rush Port Fairy. FLOOD WATERS FROM THE MOYNE RIVER, PORT FAIRY. 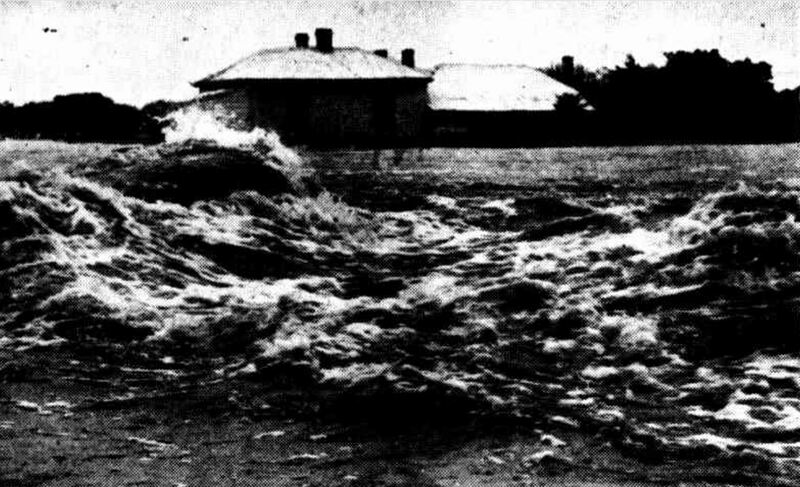 “FLOOD WAVES LASH HOUSES” Sunday Times (Perth, WA : 1902 – 1954) 24 March 1946: 15 (Sport Section). .
By Monday 18 March, the threat has subsided slightly but more water was expected to come down the Moyne River and high tide was a concern. As a result, the fire brigade put all men in the town on standby. 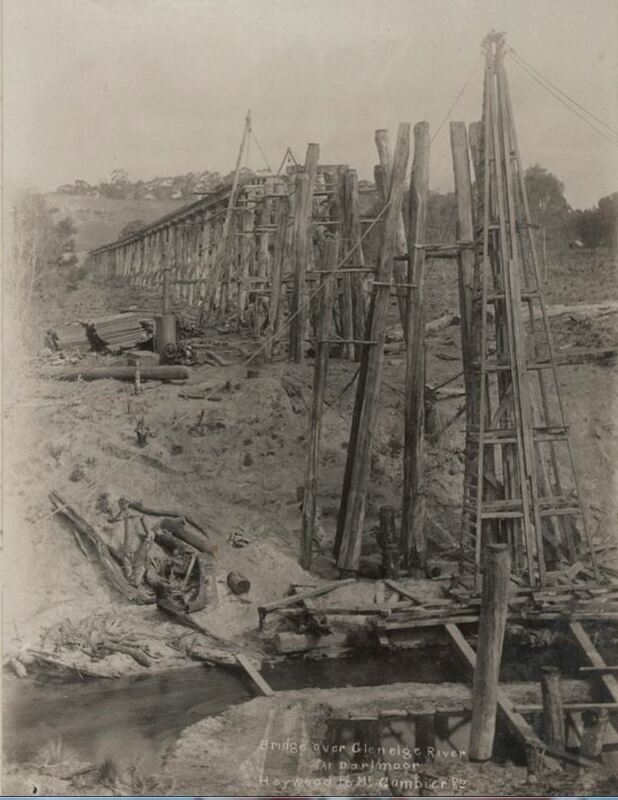 The main bridge over the Moyne was still standing but had taken a “pounding”. The river reached its peak on Sunday and fisherman stood in waist deep water desperately trying to secure their boats, their livelihoods, with some almost drowning. 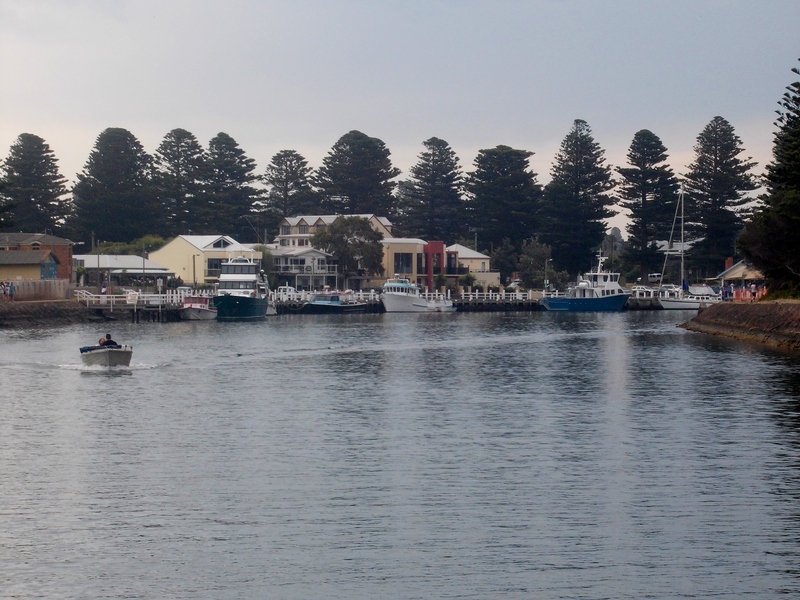 LOOKING EAST TOWARD THE PORT FAIRY WHARF, MOYNE RIVER. By Tuesday, houses on the outskirts of Port Fairy East were still half-submerged. Other families were forced to leave their homes, as weakened walls threatened to collapse while the road to Portland was expected to stay closed for some time. In the north-east of the town, built up flood waters tore through sand dunes. In doing so, the water escaped to the sea preventing more damage to the town. 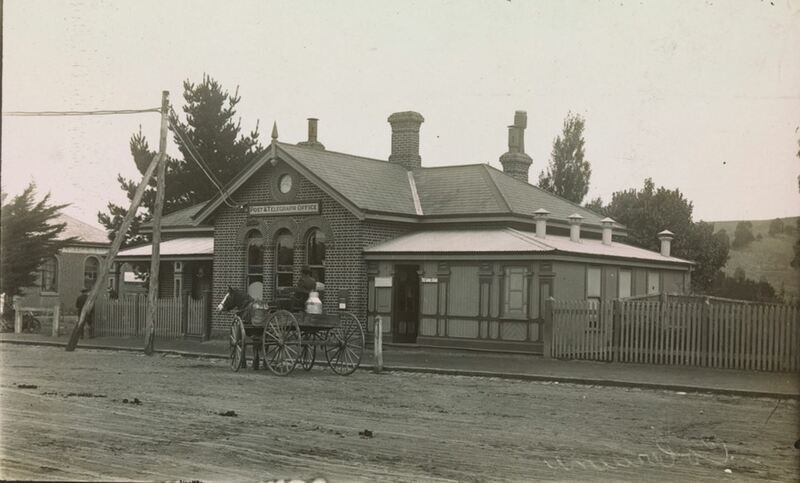 The Town Clerk of Port Fairy spoke with John Cain Sr, then Premier of Victoria “Send us some tobacco; there is a famine in smokes here” Bacon, eggs, potatoes and other food supplies were also in short supply. Two Army “ducks” arrived on Tuesday 19 March with butter, eggs, bacon, tinned meat, yeast and tobacco. Another “duck” was soon dispatched. After rescuing stranded families (below) the “ducks” distributed food to isolated families and fodder for stock. They also collected stranded stock, taking them to safety. 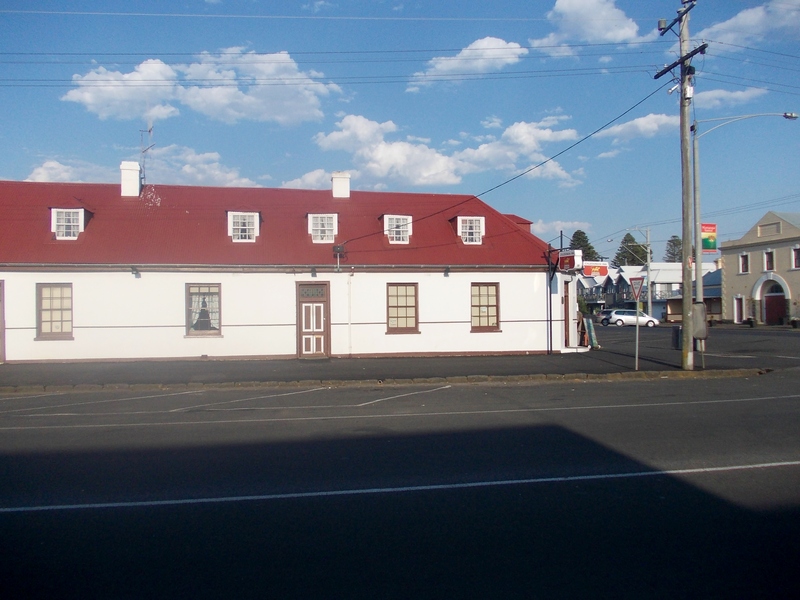 There was almost one metre of water in two of Port Fairy’s hotels, including the Caledonian Inn (below). The publican of the inn waded into his backyard to rescue his poultry, then placed them in the inn’s attic. The nearby picture theatre was also flooded. Jack and Teddy Talbot (below) had a lucky escape as a bridge collapsed just as they were approaching. The Age (Melbourne, Vic. : 1854 – 1954) 20 March 1946: 3. Web. 1 Mar 2016 <http://nla.gov.au/nla.news-article206795566&gt;. 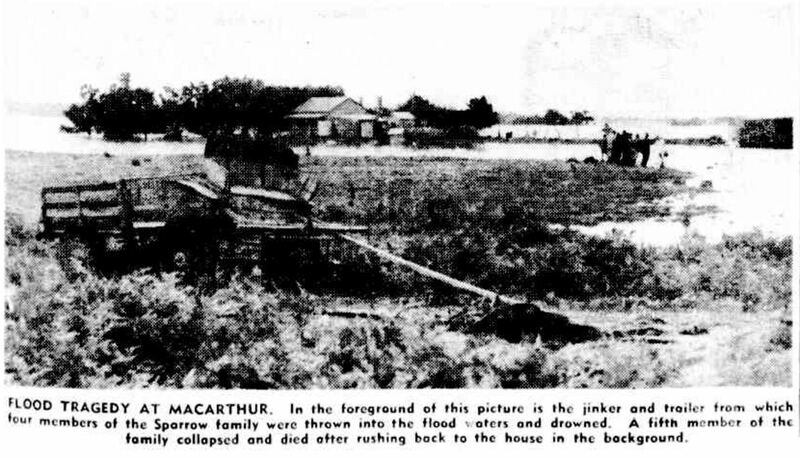 “Aftermath Of Floods In Western Victoria” The Advertiser (Adelaide, SA : 1931 – 1954) 22 March 1946: <http://nla.gov.au/nla.news-article48697059&gt;. 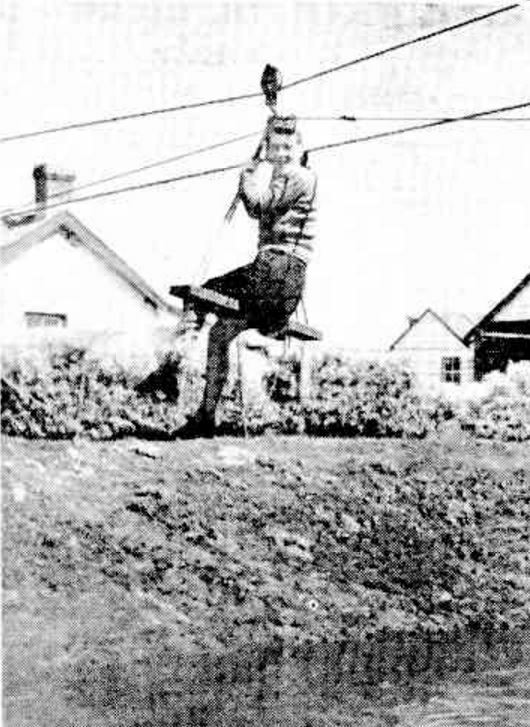 The photo below shows Mrs Woodrup on a flying fox where Steel’s bridge once stood on the Princes Highway at Port Fairy North. The Argus (Melbourne, Vic. : 1848 – 1957) 21 March 1946:<http://nla.gov.au/nla.news-page1668077&gt;. Cars replaced boats in the streets. Frank and Chris Newman, are pictured below taking Mrs B.Bourke home from the shops. The Argus (Melbourne, Vic. : 1848 – 1957) 21 March 1946 <http://nla.gov.au/nla.news-page1668077&gt;. Residents in William Street (below) dried clothes and furniture after the water in their street reached a depth of over a metre. 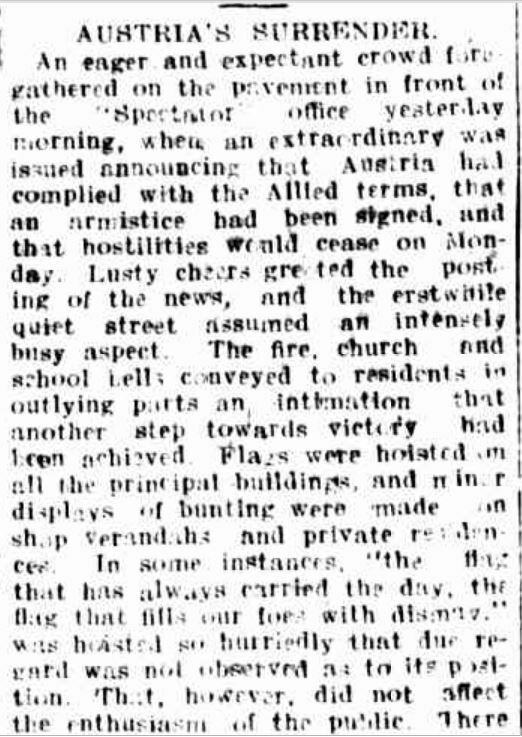 By Wednesday 20 March, wet mattresses and pillows hung over fences, furniture was in front yards and clothes lines hung between houses. Dairy farmers unable to get their milk out left cans of milk at each corner and all townspeople were allowed a jug each while the local hotels had a good supply of cream. The damage bill in Port fairy totalled thousands of pounds. 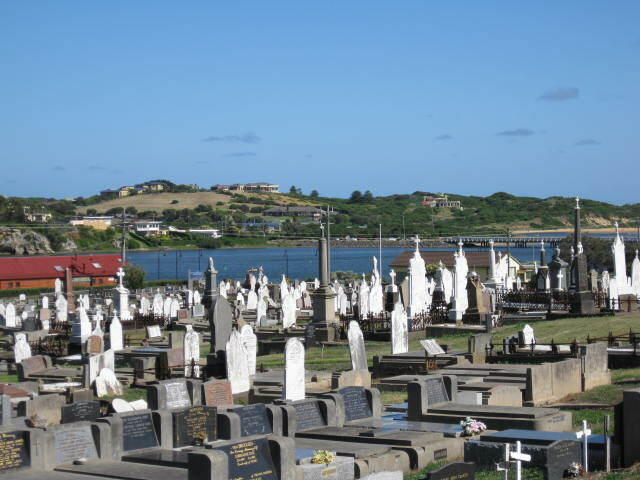 The Port Fairy Cemetery was underwater and even by the end of March, the water was still one metre deep. Eventually, pumps were used to drain it. 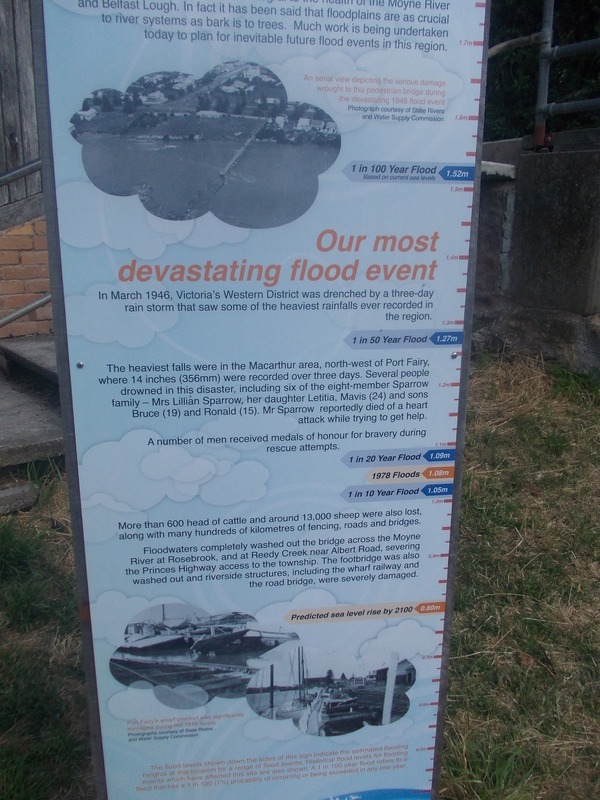 Today, there is a reminder of the 1946 flood at the Port Fairy Wharf. 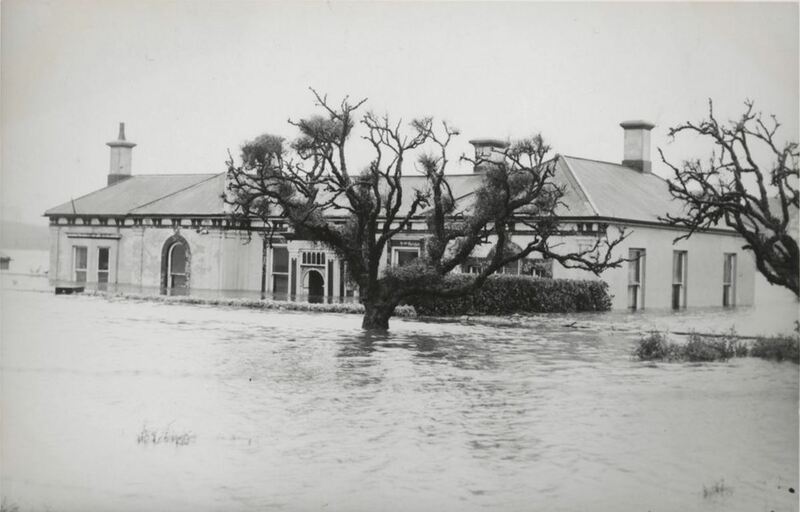 Between Friday night 15 March and Saturday morning 16 March, Portland received 144 mm of rain and low-lying land in the town was flooded. There was a call to divert the water into the sea to save the electricity and gas supplies, but all electricity and gas were cut. The sewage works were deluged and the local fire brigade was busy pumping water. The Portland Showgrounds were under 1.5 metres of water. 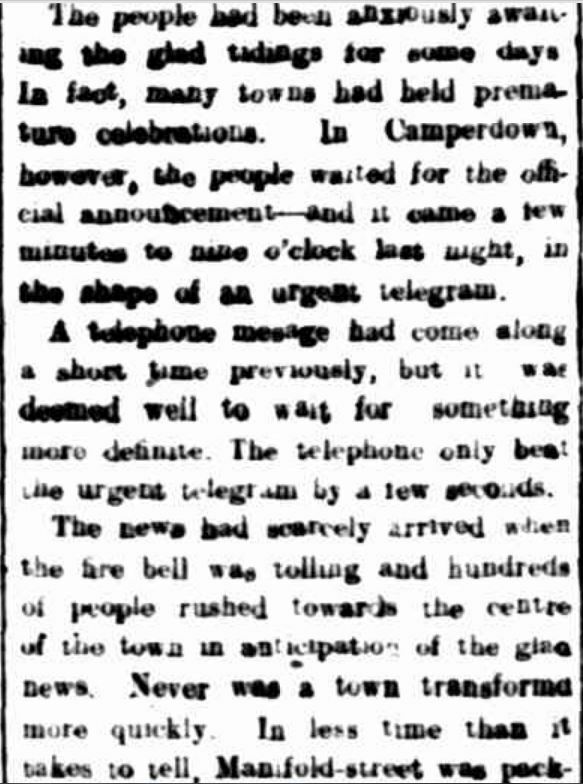 The town was cut off from Saturday including telegraph and radio communications. By the morning of Sunday 17 March, the rainfall totalled 203 mm. Fawthrop Swamp was inundated and parts of Bridgewater Road were covered in water. Much of the state’s tomatoes were grown in the district with crop losses eventually leading to a shortage. Local halls and hotels accommodated evacuees. A “howling southerly breeze” with huge waves hit the breakwater (below). At Heywood, until 3:00 pm on 18 March the previous fifty-four hours had produced 335 mm rain leaving many people homeless. Travellers were also stranded as the Portland/Hamilton road was cut including at the Fitzroy River bridge. 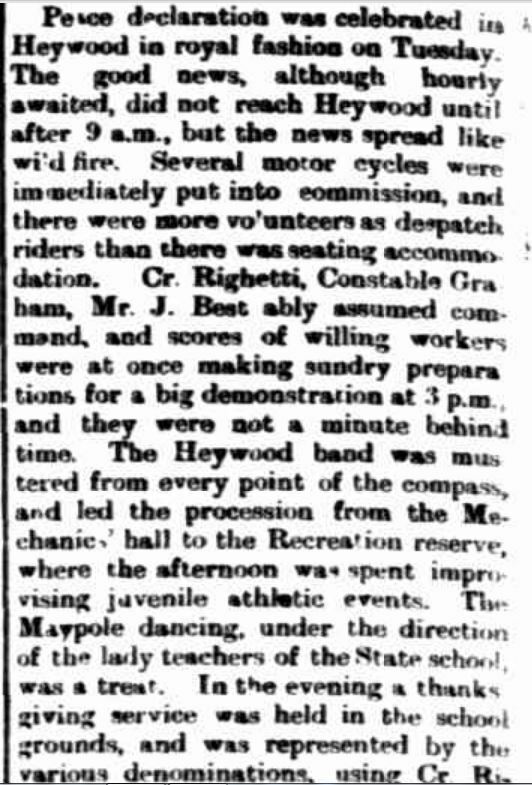 The local hotel was crowded with evacuees and emergency accommodation was set up in the Heywood Hall. The Glenelg River rose dramatically at Dartmoor as water flowed into the river from tributaries upstream. Five hundred yards of a twenty metre high railway bridge (below) was submerged as was the highway after the river’s level rose fifteen metres. Snakes sort refuge on top of the bridge and iron washed into the pylons, acting as a safe haven for insects, spiders and lizards. Old residents agreed it was the worst flood in memory. 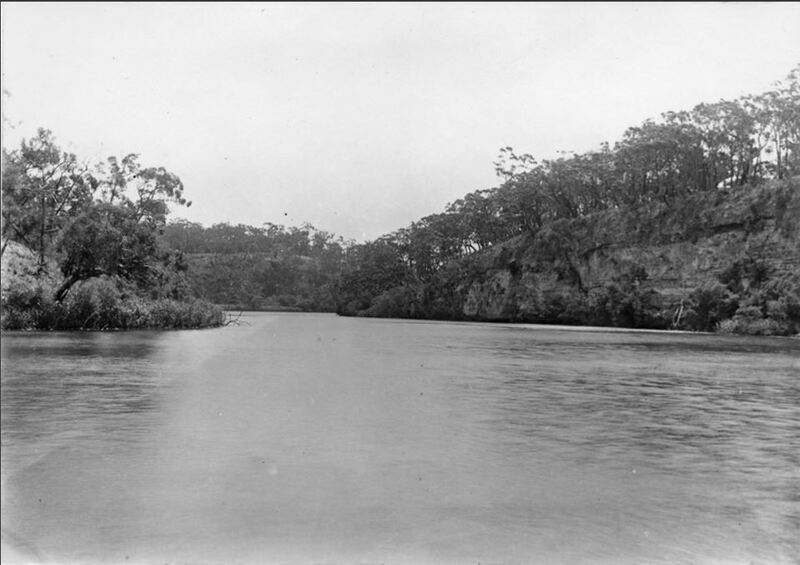 The Glenelg River was over 1.5 kilometres wide and only the tops of telegraph poles were visible. While rowing in the floodwaters, Mr Malseed gathered ten rabbits, twenty-four pumpkins and a number of tomatoes stuck in trees. 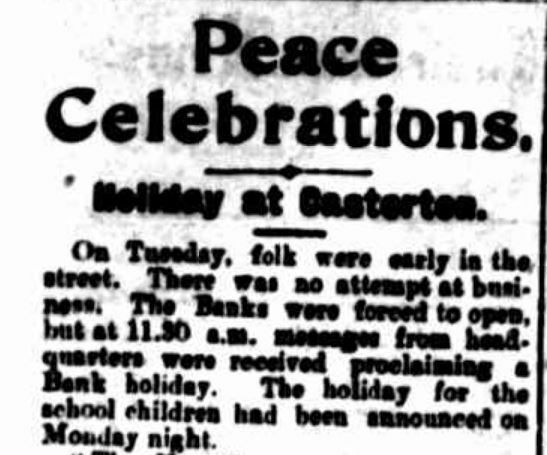 Seventy drums that had spilt into the river at Casterton were expected to reach Dartmoor. Although Nelson only received 30 mm of rain over the weekend, the Glenelg River was rising rapidly as it neared the sea. A boat shed floated down the Glenelg River with two boats still attached. All sheds on the river bank were submerged as was the kiosk. The monument to Major Mitchell on the Isle of Bags was almost submerged. 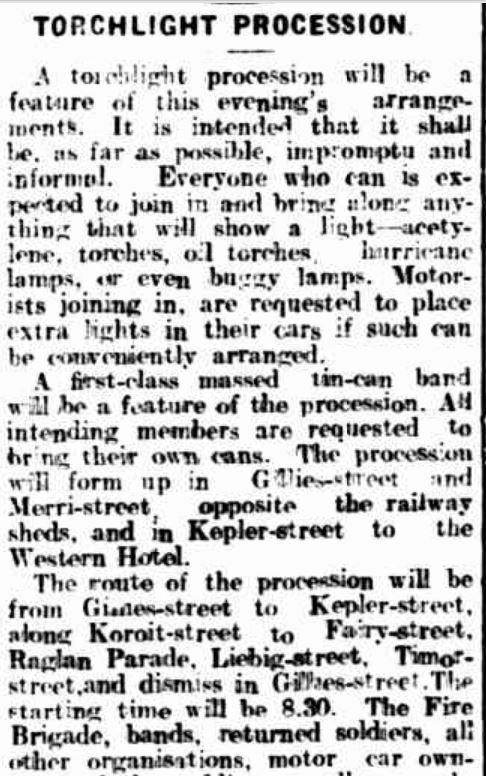 “HOW NELSON SAVED ITS BRIDGE” The Age (Melbourne, Vic. : 1854 – 1954) 22 March 1946: 3. <http://nla.gov.au/nla.news-article206798952&gt;. Coleraine’s rainfall to Saturday 16 March at 6:00 pm was 122 mm. A flood warning was issued at 2:00 am Sunday morning in the lower part of the town. Bryan’s Creek rose rapidly flooding shops and houses. Stranded Mrs J. Torney and her baby were rescued from the golf course clubhouse. Over a metre of water sat in the yard of the Post Office (below) by noon Sunday and reached the eaves of some houses. By Monday 18 March, 186 mm of rain had fallen on the town and residents were cleaning silt from their homes. One house, under 1.8m of water in the days before, was left with 50cm of silt. Damage to bridges had blocked the road from Coleraine to Merino and the suspension bridge washed away. There were also large stock losses and miles of fencing demolished. At Casterton, the Glenelg River swelled quickly reaching a height of 6.45m on the river gauge. 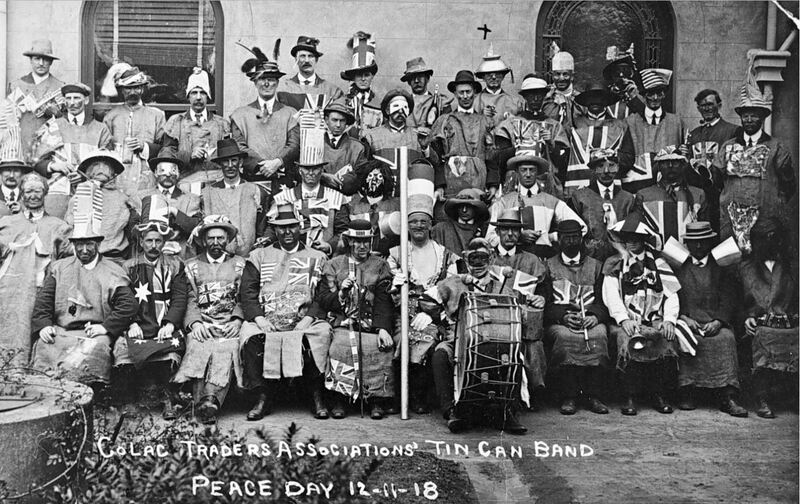 Seventy drums from the local tip rolled into the river and travelled downstream. By Monday, there were still fears for the safety of three men. Six streets in the town were flooded and Mr Frank Daley and his eighty-three-year-old mother were rescued by police in a boat. Thirty metres of pipe serving the town’s water supply was washed away while the Major Mitchell monument, south of the town, was almost submerged. 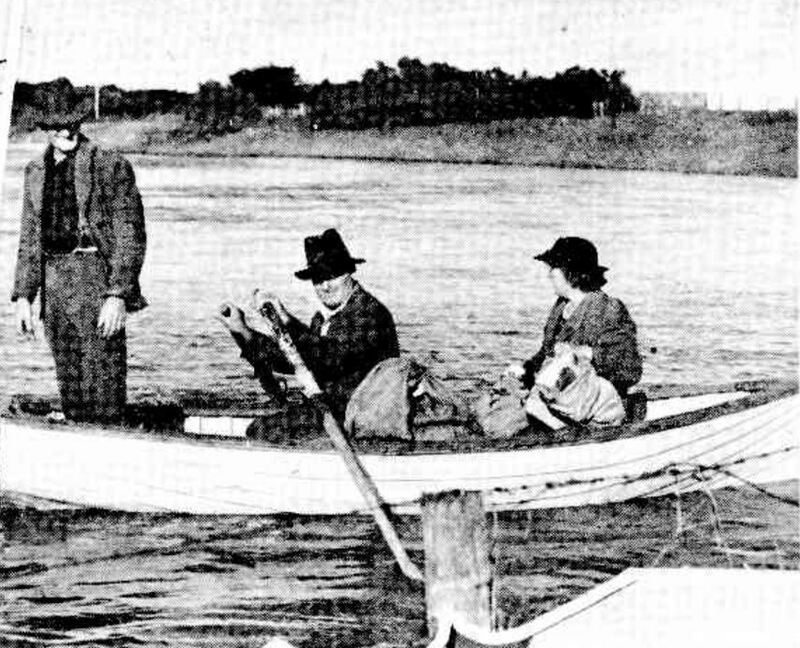 At nearby Sandford, the McCormack family were stranded. On Monday 18 March, police and an Army “duck” tried to reach them. They were later reported safe. Just as the water in rivers and creeks was beginning to ease, the following weekend the rain began to fall again. The totals for the period are below, with towns further east of the original floods affected. 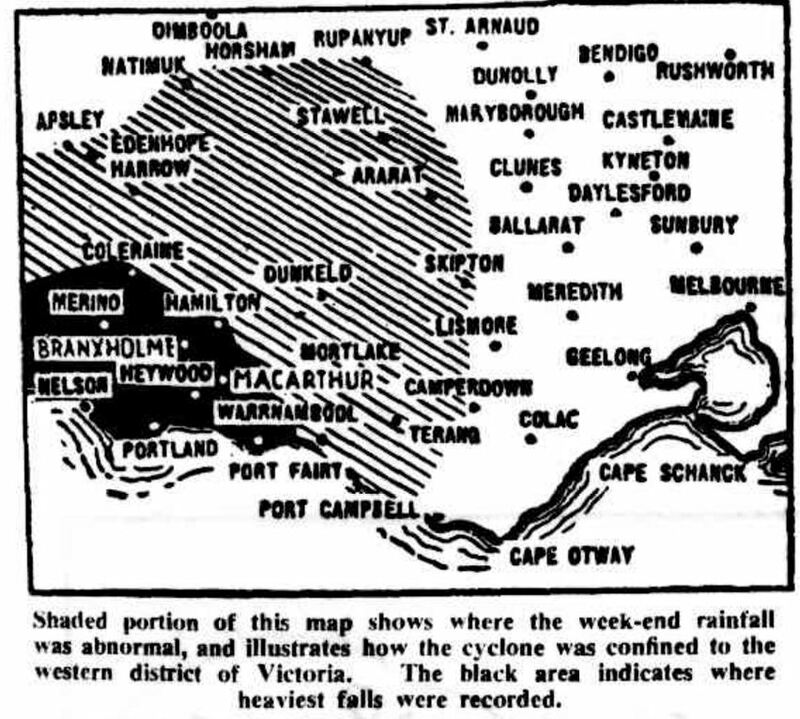 “YEAR’S RAINFALL IN THREE MONTHS” The Argus (Melbourne, Vic. : 1848 – 1957) 27 March 1946:<http://nla.gov.au/nla.news-article22237029&gt;. 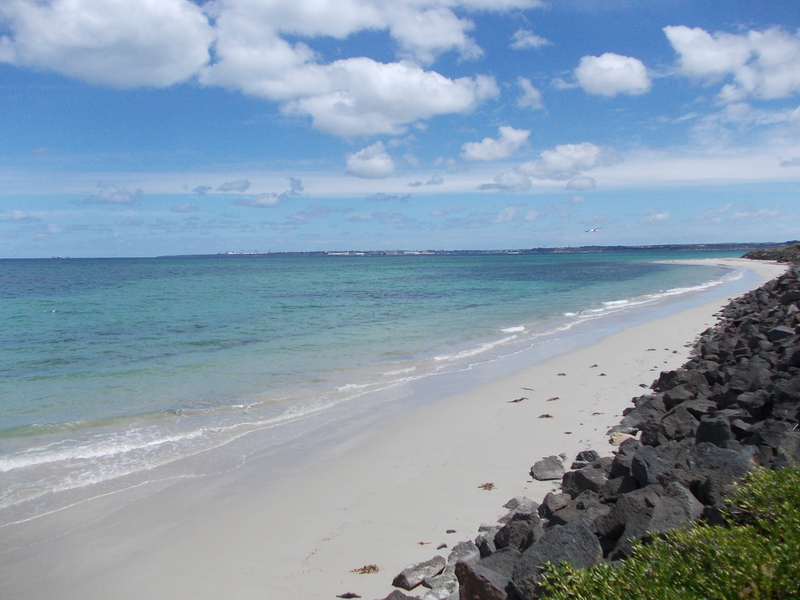 On Monday 25 March, Port Fairy was once again isolated and evacuations were considered. Macarthur was expecting flooding worse than experienced a week earlier and the Eumerella River burst its banks after reaching a depth of over three metres. Families were evacuated at Bessibelle. The towns of Koroit, Hawkesdale and Branxholme were all at risk of flood. At Allansford. the Hopkins River reached the height of the week before but continued to rise before dropping 1.2 metres on Wednesday 27 March. At Casterton, the police were warning residents the Glenelg and Wannon Rivers could burst their banks. Homes at Byaduk evacuated in the week earlier were again vacated. At Wallacedale and Condah flood waters still remained from the week before. An Army “duck” was called to Tyrendarra to save a family isolated by the Fitzroy River and Darlot’s Creek. Portland was also cut off via the Princes Highway due to water over the road. Flooding was reported at Beech Forest and residents living along the Gellibrand River prepared themselves to evacuate. 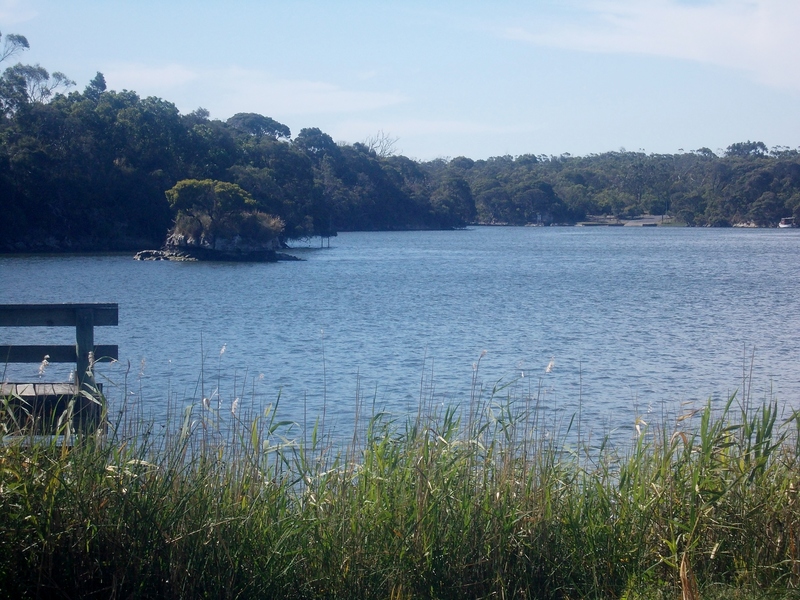 By 29 March, there was over half a metre of water on the Ocean Road at Lower Gellibrand. Meanwhile, at Cobden, 63 mm fell on Saturday 24 March flooding paddocks and stranding cattle. At nearby Cowley’s Creek, stud sheep were rescued from the creek. At Camperdown, a total of 104 mm was recorded over the weekend. Port Campbell, reported its heaviest falls in its history and the township was isolated with over a metre of water over the road. 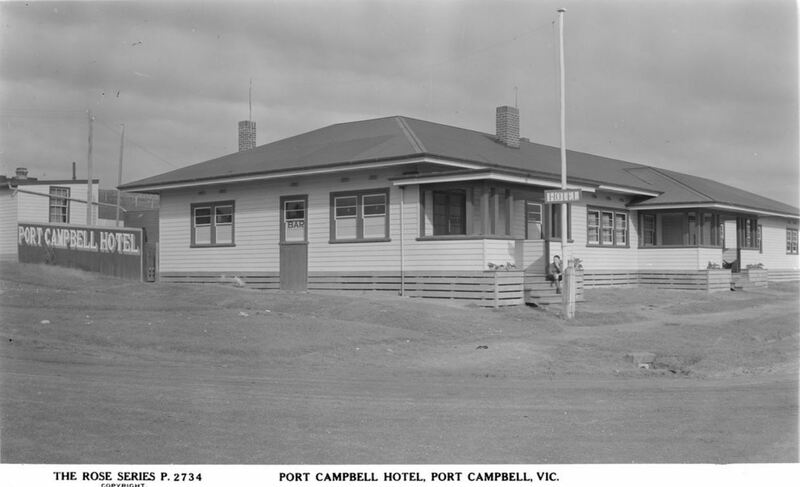 Stranded campers were billeted at the Port Campbell Hotel (below). 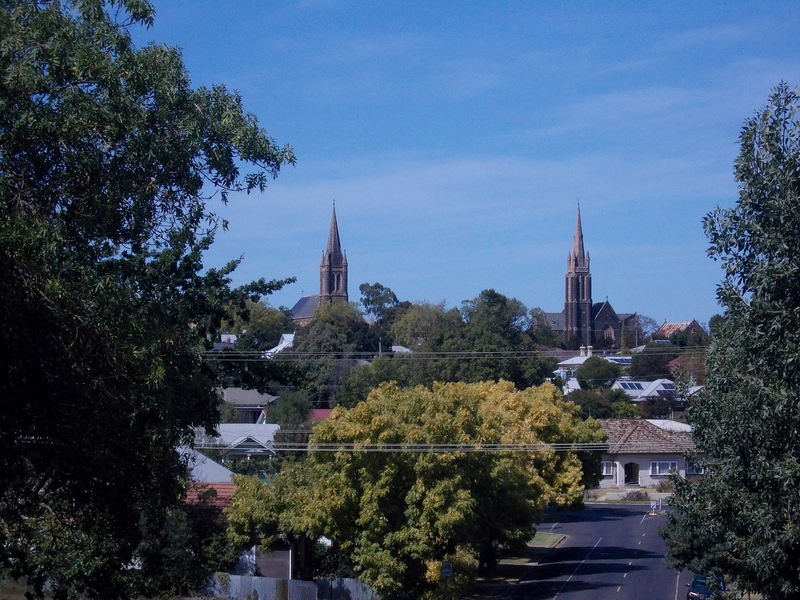 By 27 March, the sun was shining in Warrnambool for the first time in two weeks, but the damage bill and impending recovery left a gloomy forecast for the Western District. 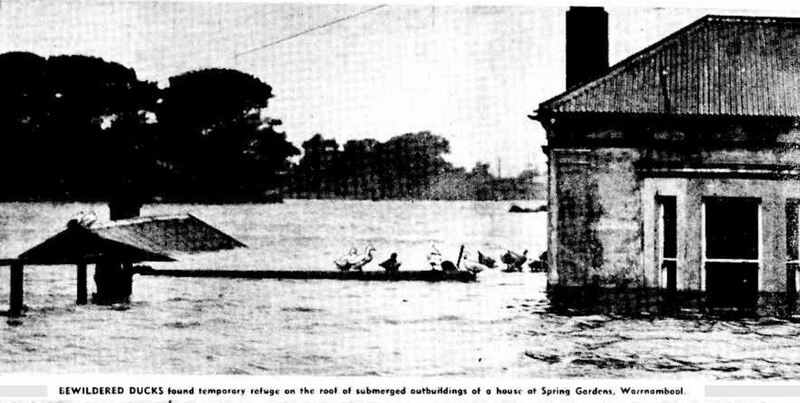 Before the flood waters subsided on 20 March 1946, The Age reported the total damage bill could exceed £2,000,000. On 30 March 1946, the Border Watch reported 150 houses were destroyed and 150 sheds damaged. There were losses to ryegrass seed and potato, tomato, onion and apple crops. One hundred bridges were destroyed. 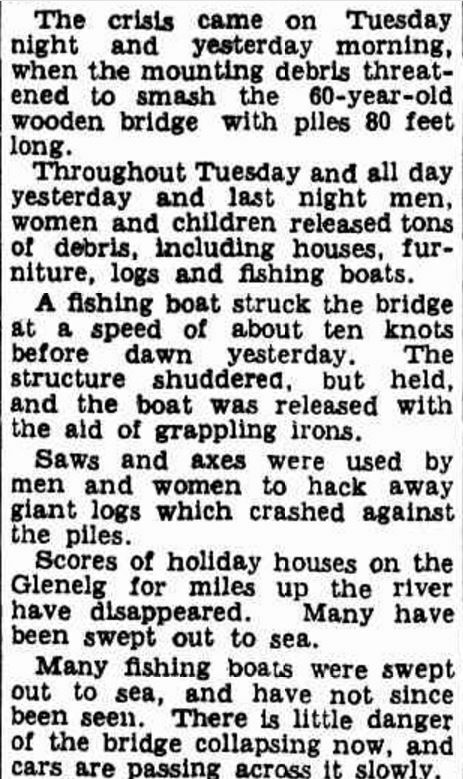 The damage bill for bridges and roads alone, published in The Age of 5 April 1946, was estimated at £76,500. Of that, £25, 300 was in the Warrnambool Shire. 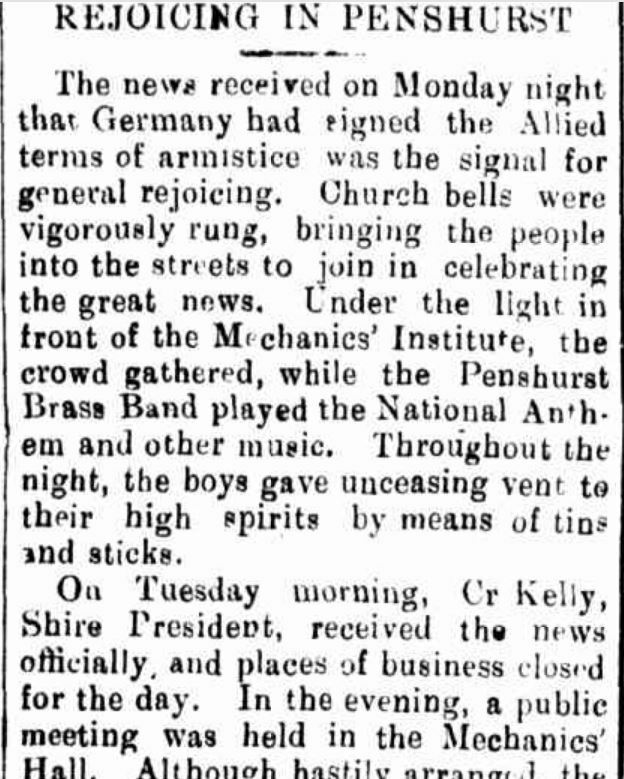 By the end of March, the Army “ducks”, vital during the disaster, returned to Melbourne. 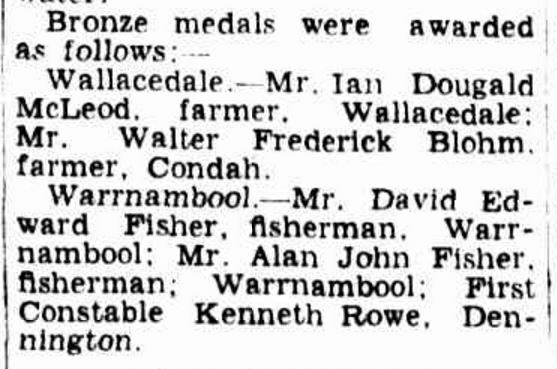 “AWARDS FOR HEROISM” The Age (Melbourne, Vic. : 1854 – 1954) 2 July 1946: 2. <http://nla.gov.au/nla.news-article206375340&gt;. 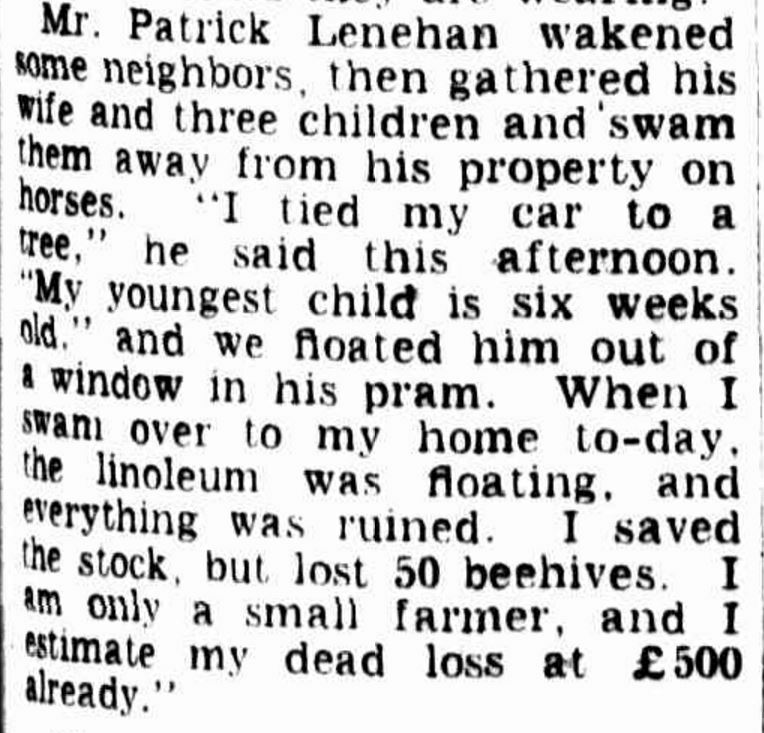 There was a positive to came out of the 1946 floods. Buckley’s Swamp, a peat swamp burning since the fires of January 1944, was finally extinguished. 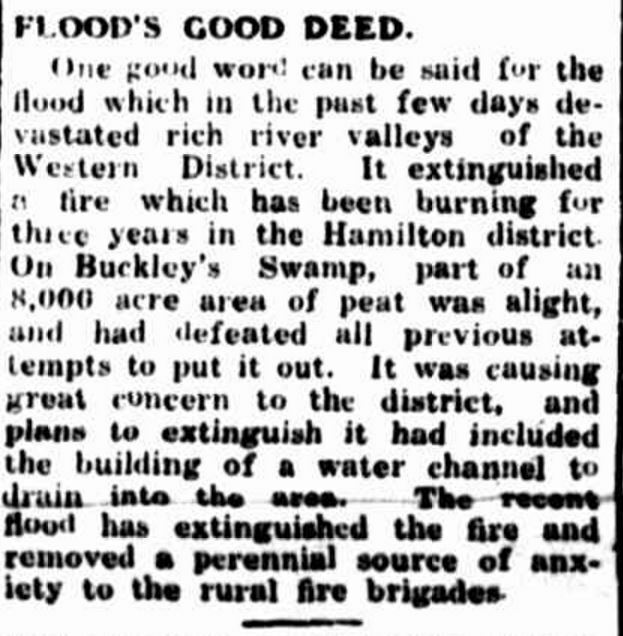 “FLOOD’S GOOD DEED.” Portland Guardian (Vic. : 1876 – 1953) 1 April 1946: 2 (EVENING). Web. <http://nla.gov.au/nla.news-article64407334&gt;. One of my favourite Facebook pages “Glenelg Shire Council Cultural Collection” alerted me to some new treasures at one of my favourite websites, Trove. Those treasures were the Portland photos of Thomas Hannay, taken around 1859 and held by another favourite, the State Library of Victoria. 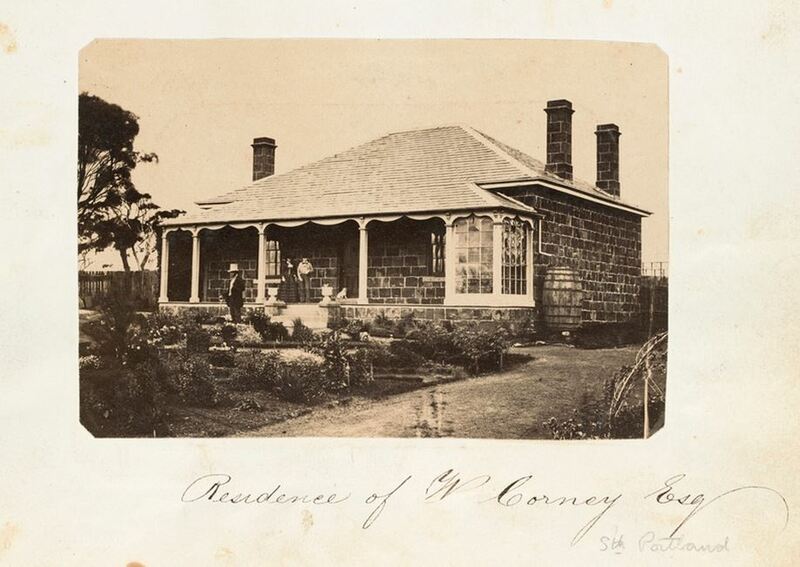 From the collection, a photo of Claremont, built by Stephen Henty in 1852 and rented to his brother Francis Henty, caught my eye. The house was the subject of a Western District Families post two years ago. Thomas Hannay’s photo is terrific and if the date on the photos of c1859 is correct, Claremont was in its infancy. 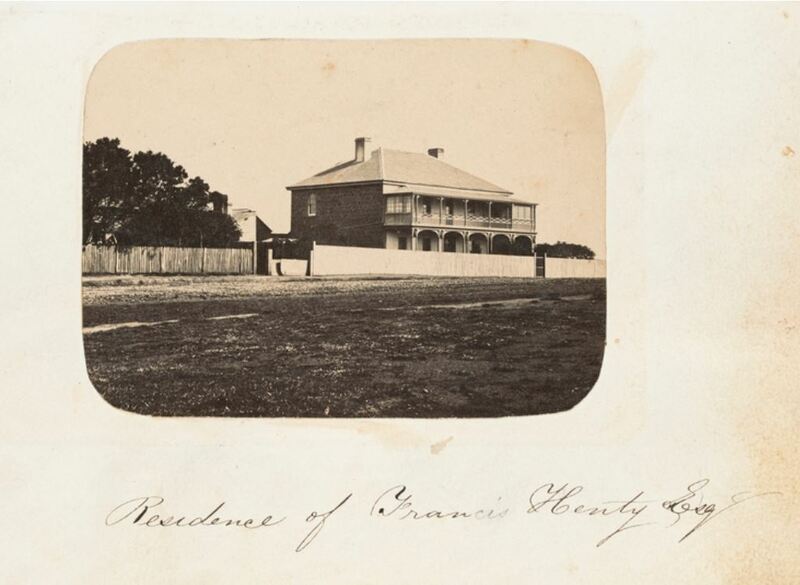 At the time of the photo, Francis Henty used the house as a summer home when not at his property Merino Downs. As I scrolled through the photos, some familiar names appeared. 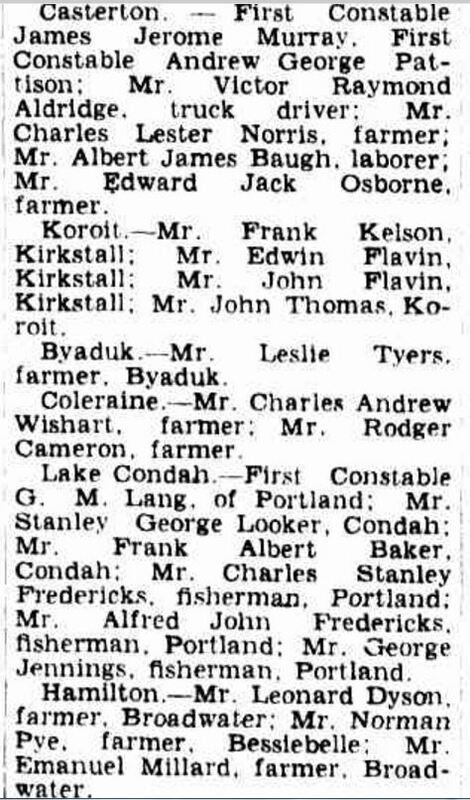 They were the names of some of the Portland pioneers who have appeared in Passing of the Pioneers posts or other Portland related posts here at Western District Families. There was Thomas Must’s home Prospect (below). Thomas was a Passing Pioneer in September 2013. 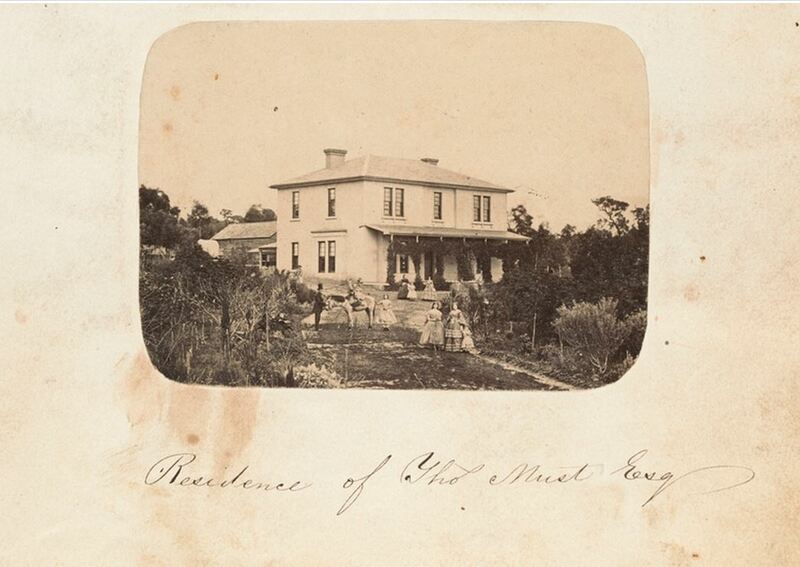 The photo I found of Prospect for that post was from the 1960s, but Thomas Hannay’s photo shows Prospect, built in 1855, as a reasonably new home and with the Must family posing in the front yard. 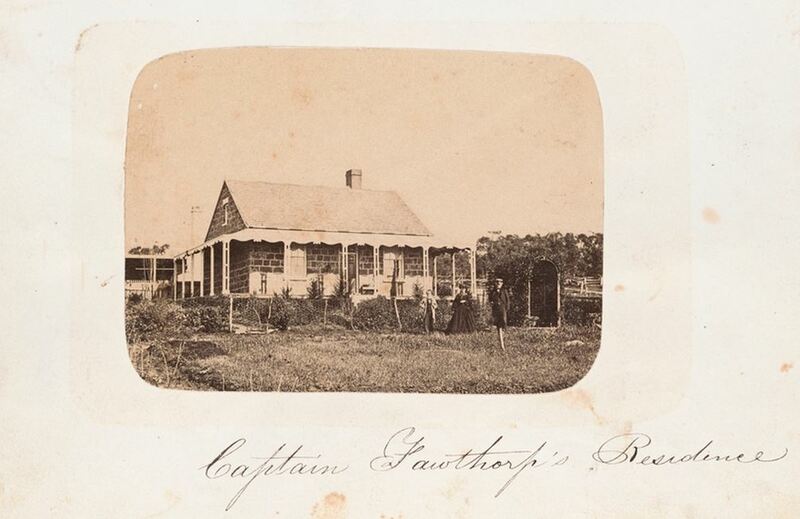 There was also a photo of Captain James Fawthrop’s home. James Fawthrop’s grave was part of the Old Portland Cemetery Part 2 post. He was famous as captain of the Portland lifeboat that went to the aid of the steamer the Admella in 1859. The good Captain, his wife Jane Rosevear, and child posed for Thomas Hannay on his trip to Portland. George Crouch’s name was familiar to me, as his wife, Marianne Trangmar was one of the pioneer women of Portland featured in the book Portland Pioneer Women’s Book of Remembrance I wrote about in January 2013. Their family home is below. 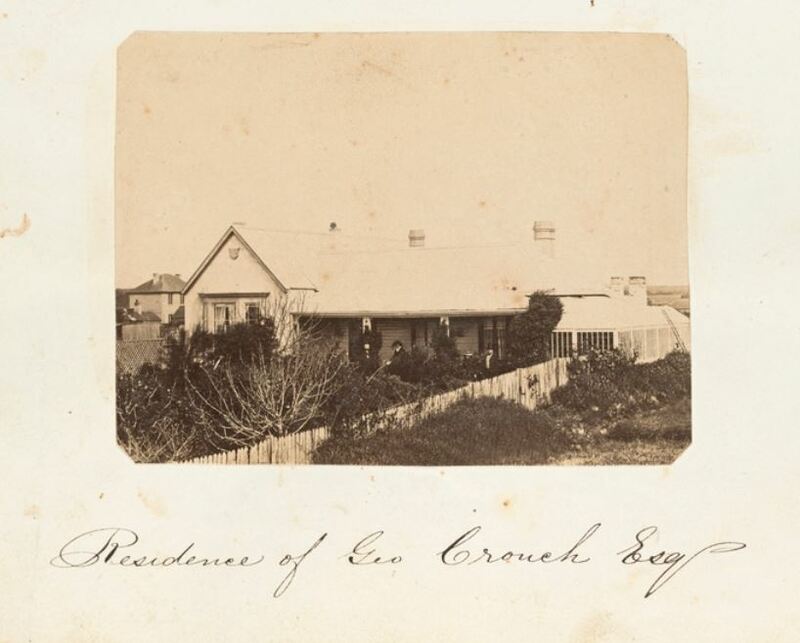 Thomas Hannay, not only photographed George Crouch’s home, but he also photographed his business Trangmar & Crouch that he started with James Trangmar. The business was established after James Trangmar, a December 2012 Passing Pioneer, arrived in Portland in 1844. 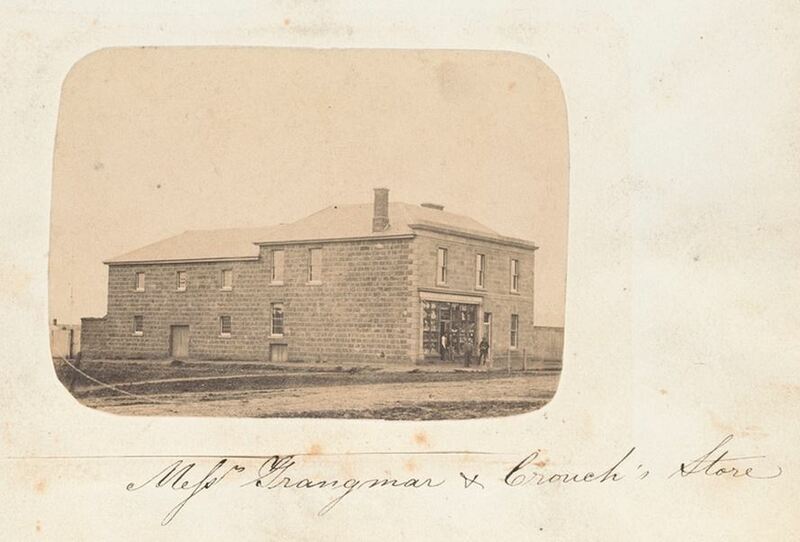 James Trangmar removed himself from the business in 1856 but the name continued on. The business moved to new premises in 1857 and it is probably that building photographed by Thomas Hannay. Stephen Rowan Robertson, a Passing Pioneer from August 2013, married William Corney in 1846 and the house below is their family home in Portland. 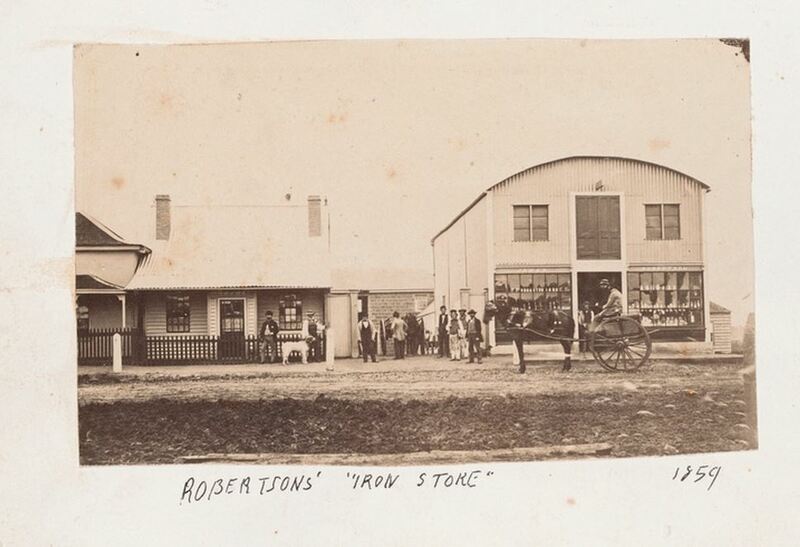 Robertson’s Iron Store (below) was owned by the Robertson brothers, James, John, and William. James and William are among Western District Families’ Passing Pioneers . But Thomas Hannay’s photos are not limited to Portland. 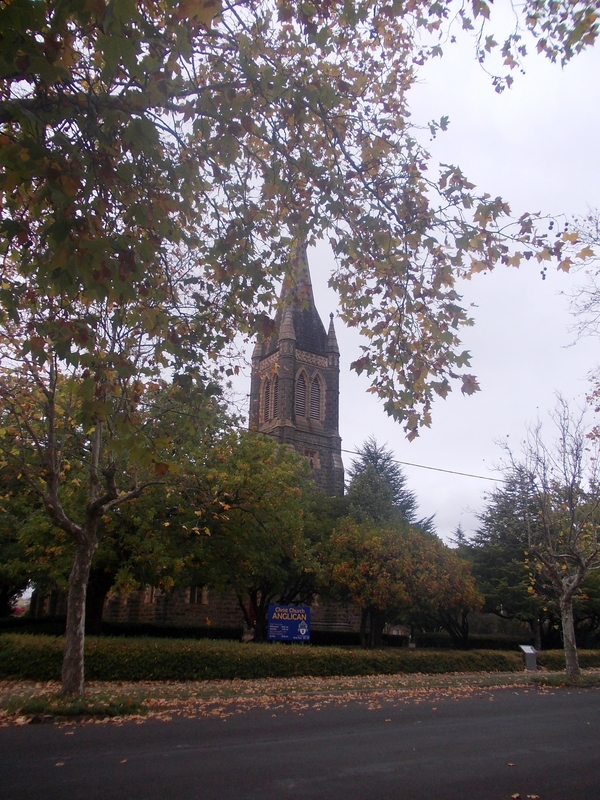 I also found Larra near Camperdown, the home of March 2012 Passing Pioneer, John Lang Currie. 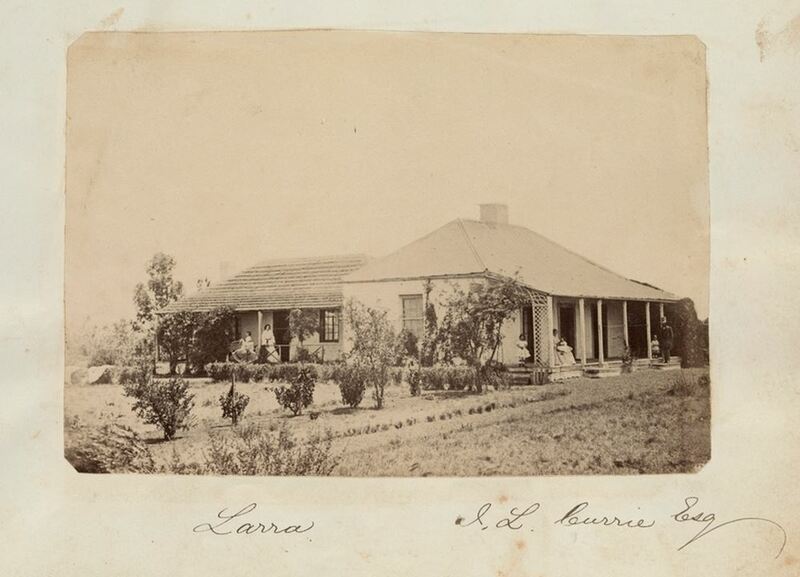 John Currie purchased Larra Estate in 1844. 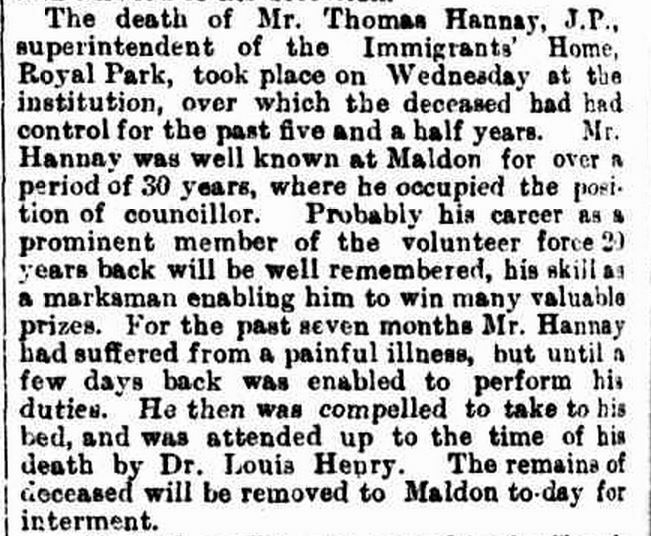 Thomas went on to live at Maldon and died in 1897 in Melbourne. 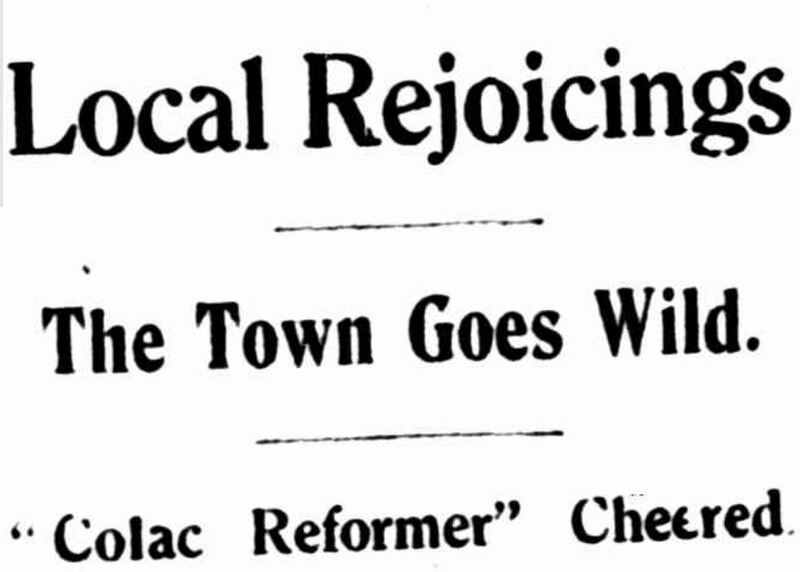 “LOCAL NEWS.” The Age (Melbourne, Vic. : 1854 – 1954) 24 Sep 1897: 6. Web. 8 Sep 2015 <http://nla.gov.au/nla.news-article188142819&gt;. 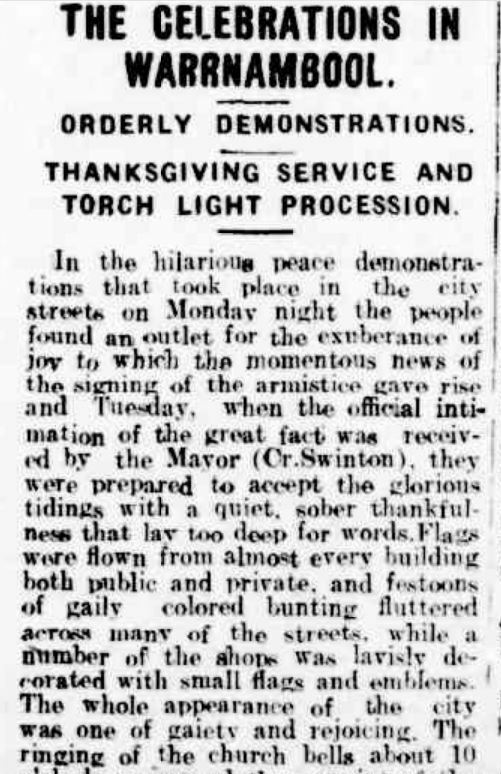 With Portland celebrating its 180th birthday tomorrow (November 19), my Trove Tuesday post this week is an article published in the Portland Guardian of October 15, 1934 prior to that year’s centenary celebrations. Superintendent Clugston of the police department offered some timely advice for those attending the week-long celebration. My favourite “don’ts” are “Don’t hurry or rush about”, “Don’t drive your car or other vehicle in a careless or improper manner and extend courtesy and consideration for all other road users” and “Don’t Guess”. 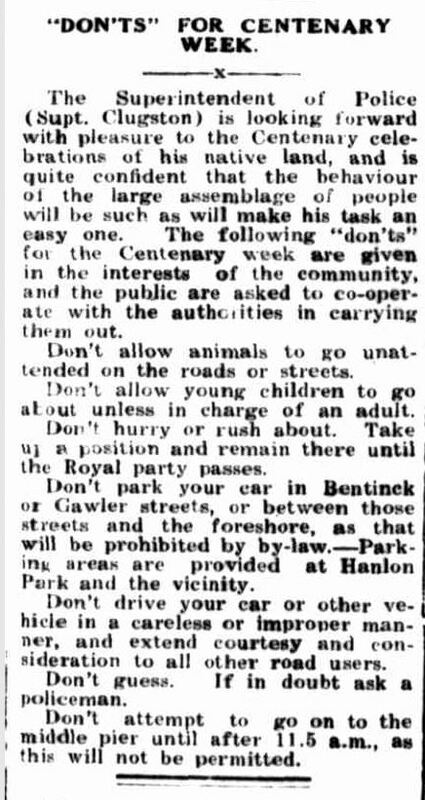 “”DON’TS” FOR CENTENARY WEEK.” Portland Guardian (Vic. 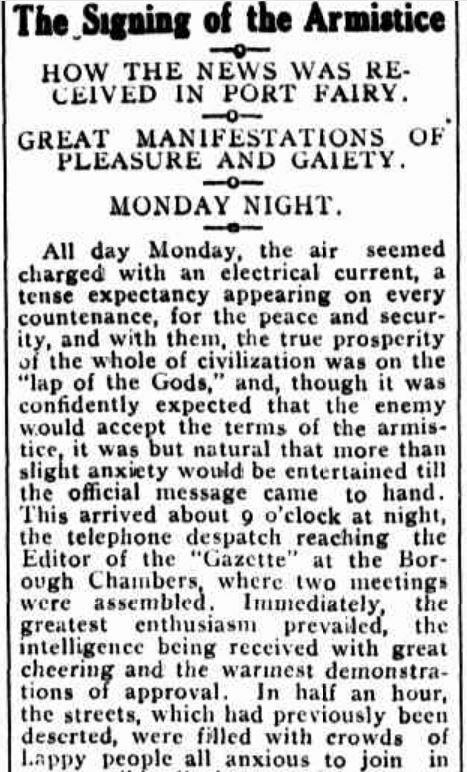 : 1876 – 1953) 15 Oct 1934: 2 Edition: EVENING.. Web. <http://nla.gov.au/nla.news-article64287060&gt;.